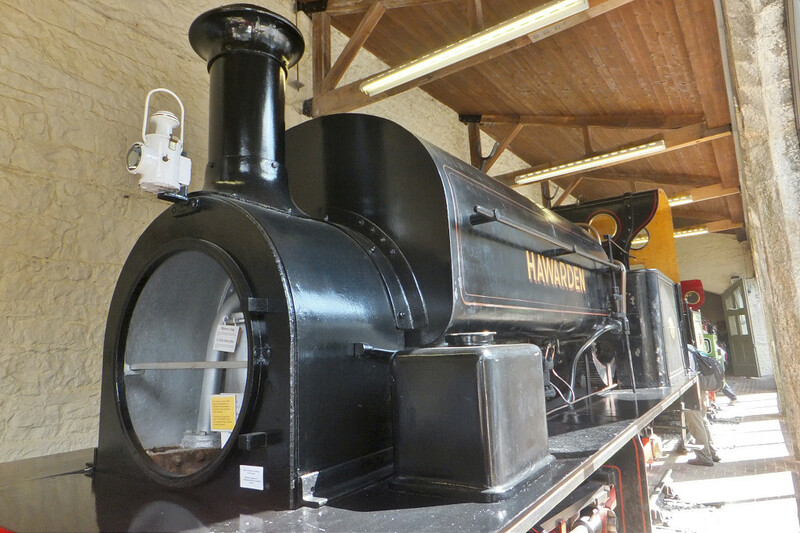 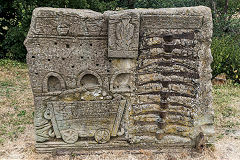 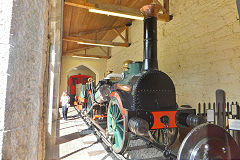 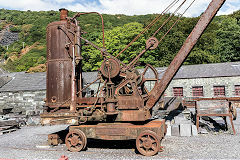 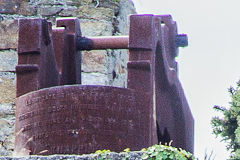 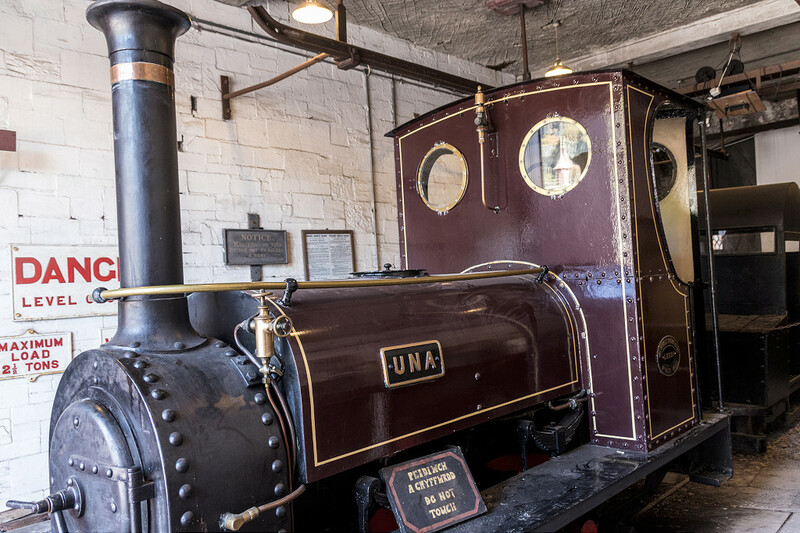 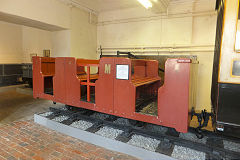 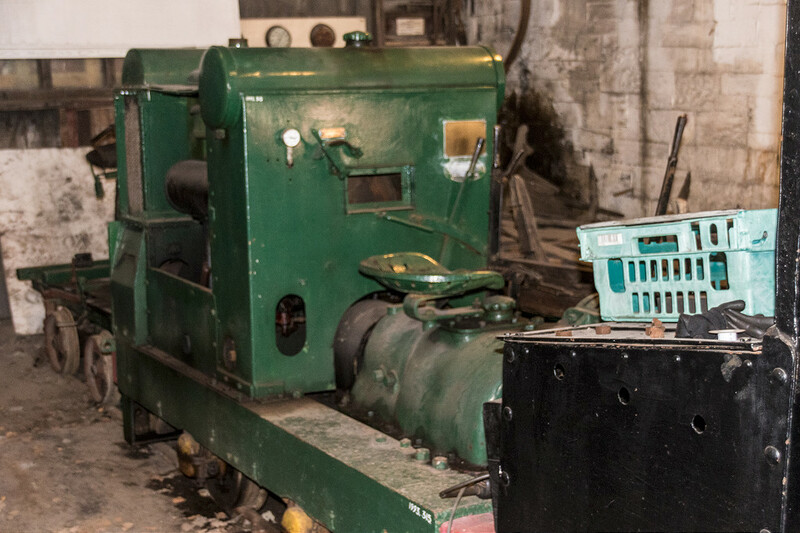 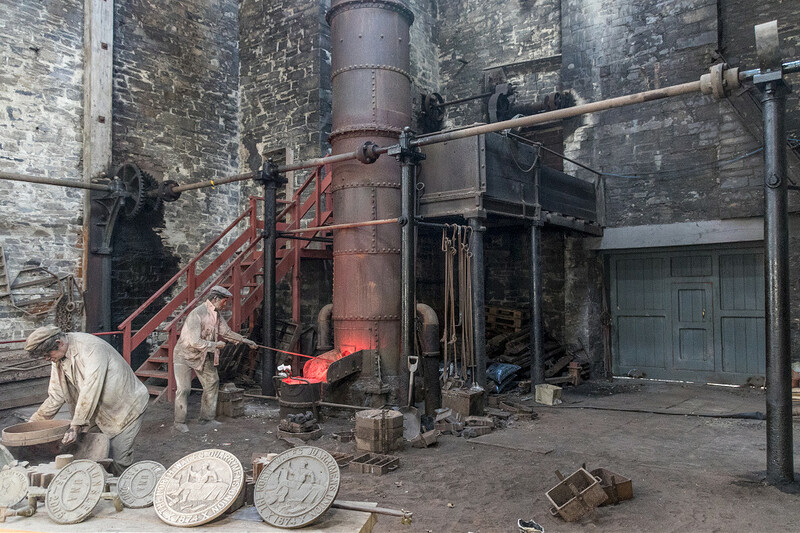 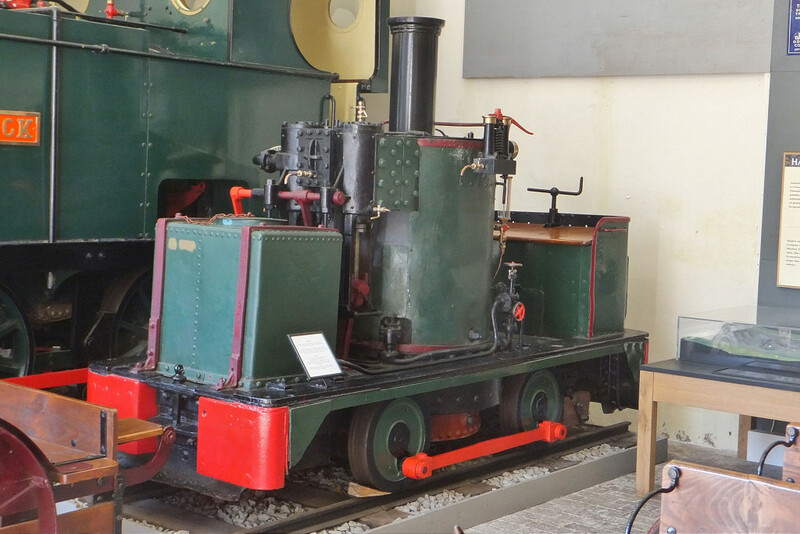 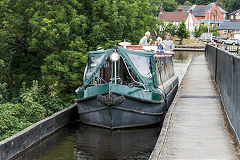 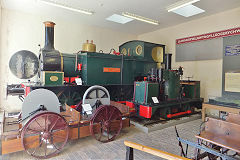 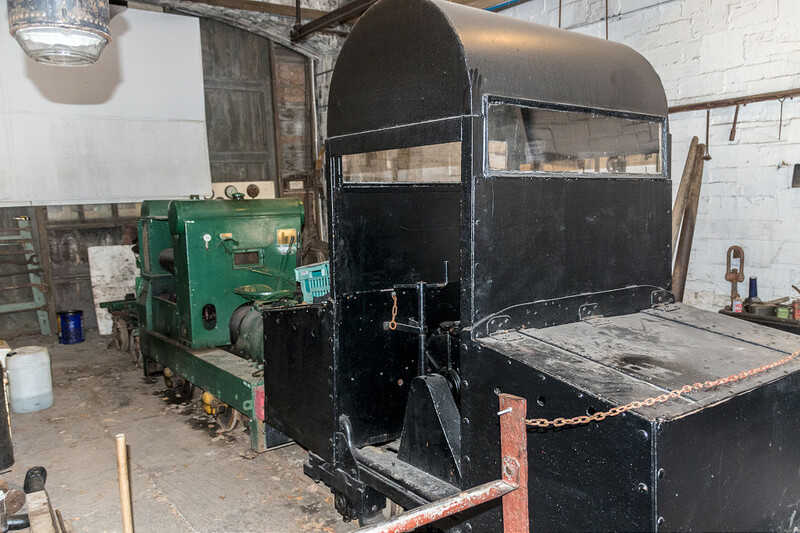 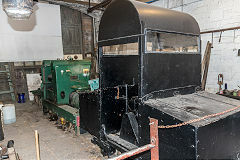 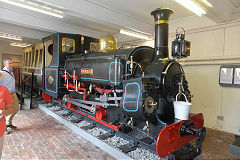 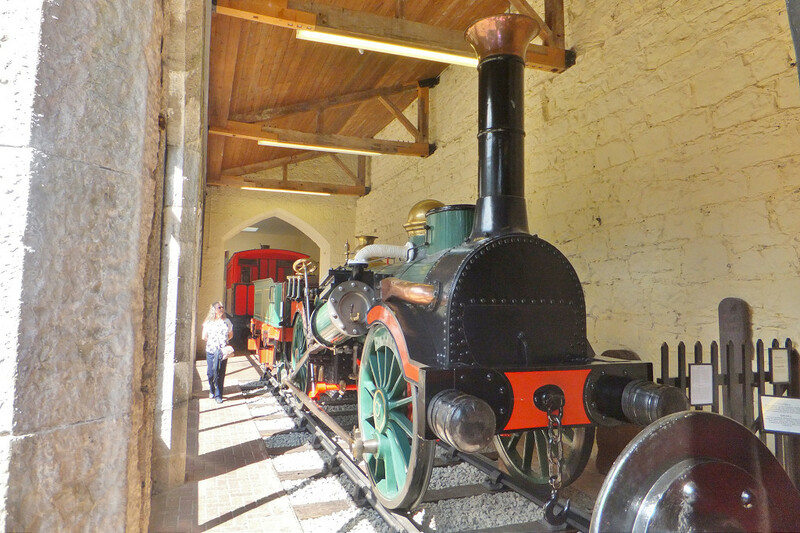 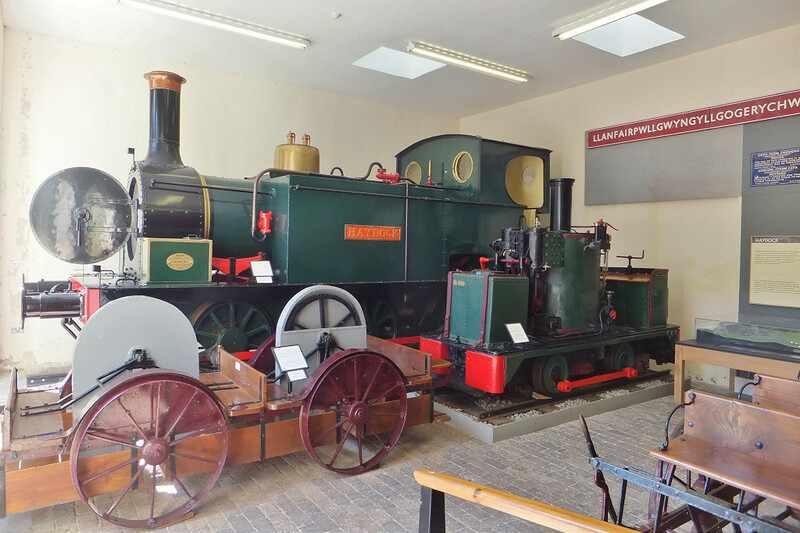 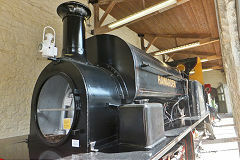 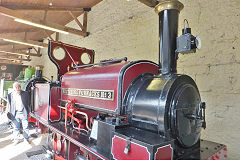 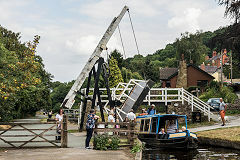 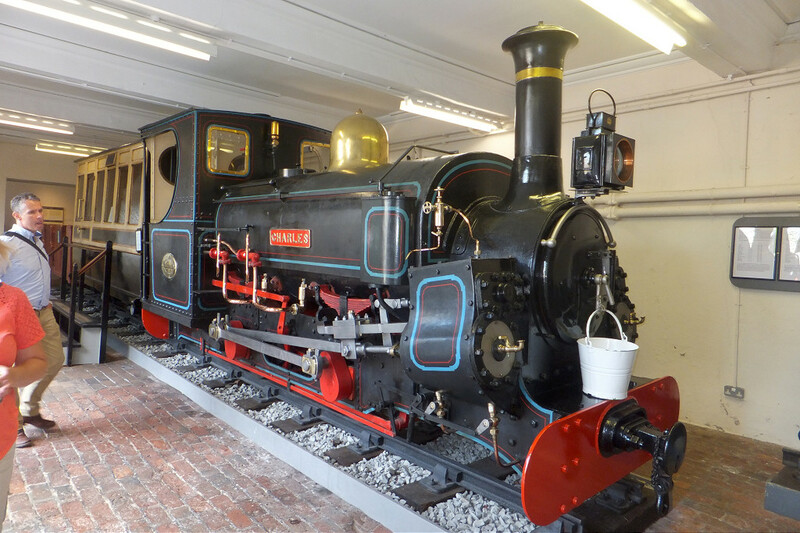 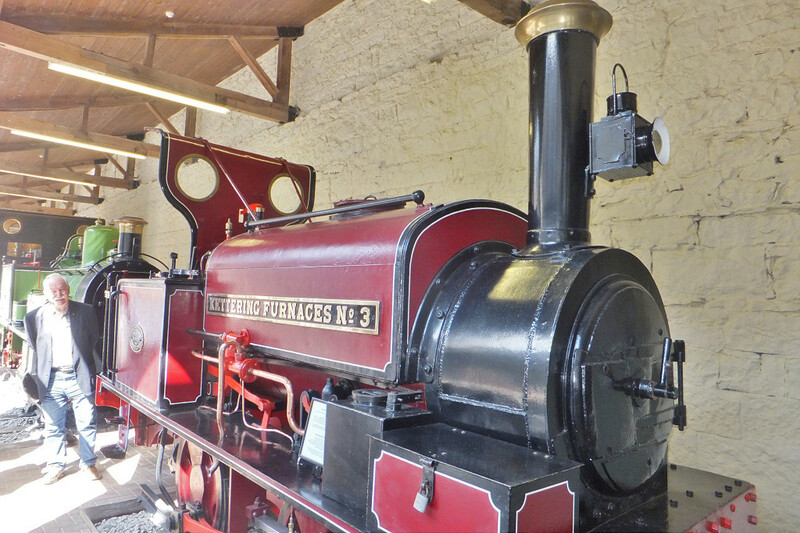 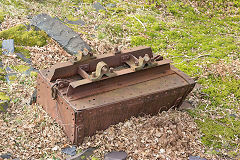 The steam engine was built by Thos C Fawcett Ltd, Leeds and knapping machine was by W H Baxter Ltd, Leeds. 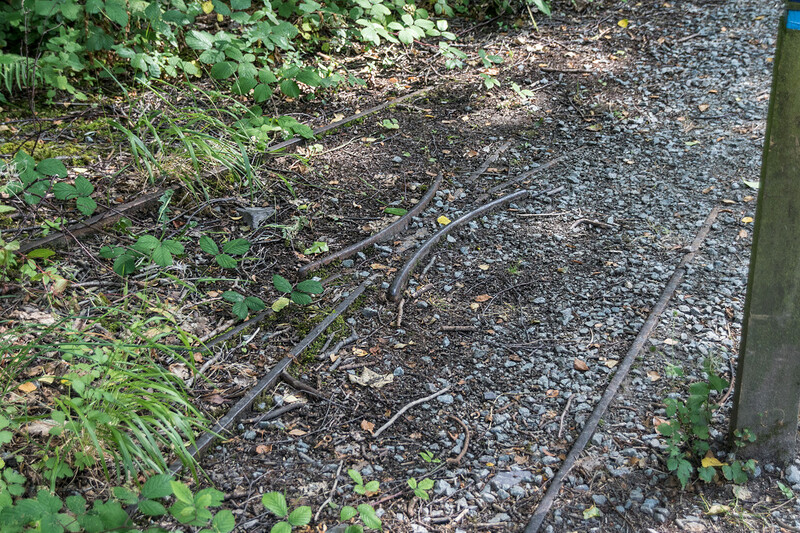 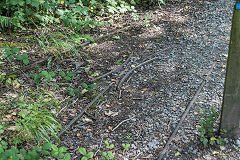 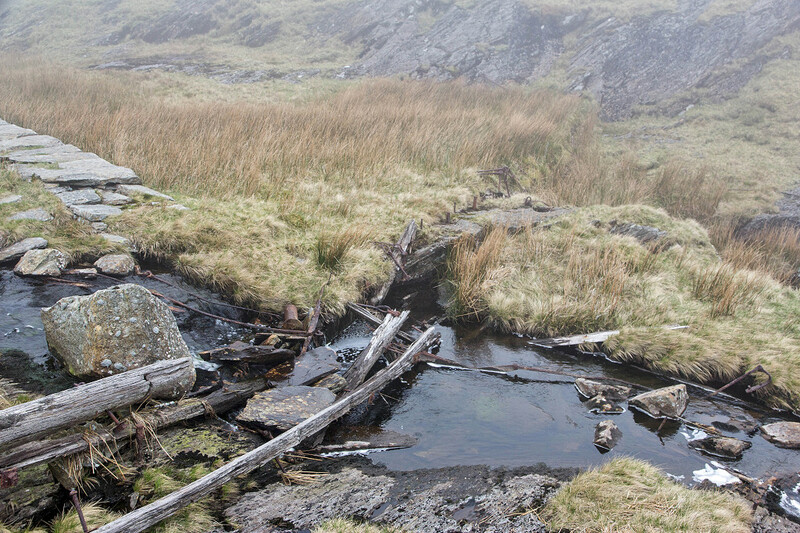 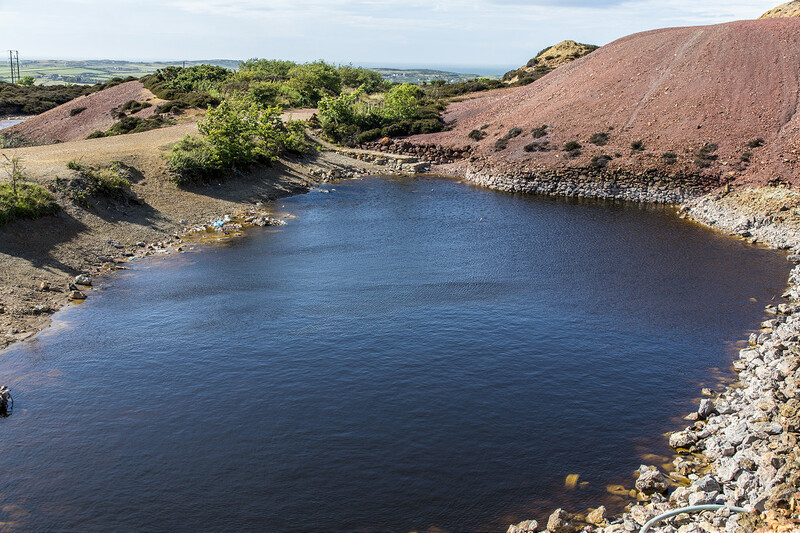 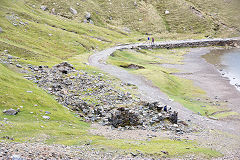 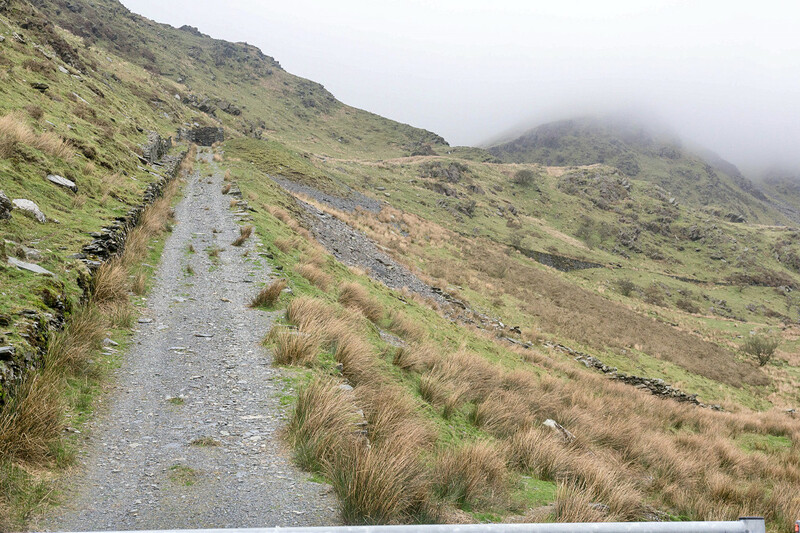 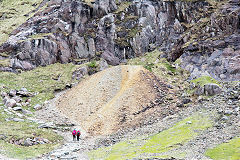 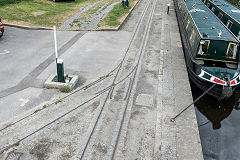 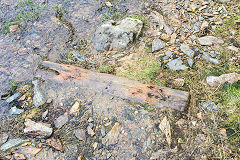 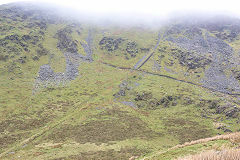 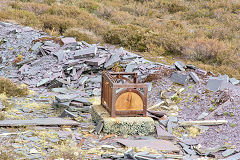 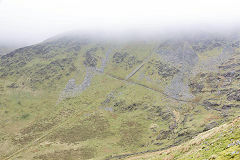 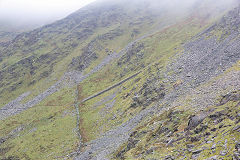 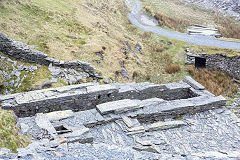 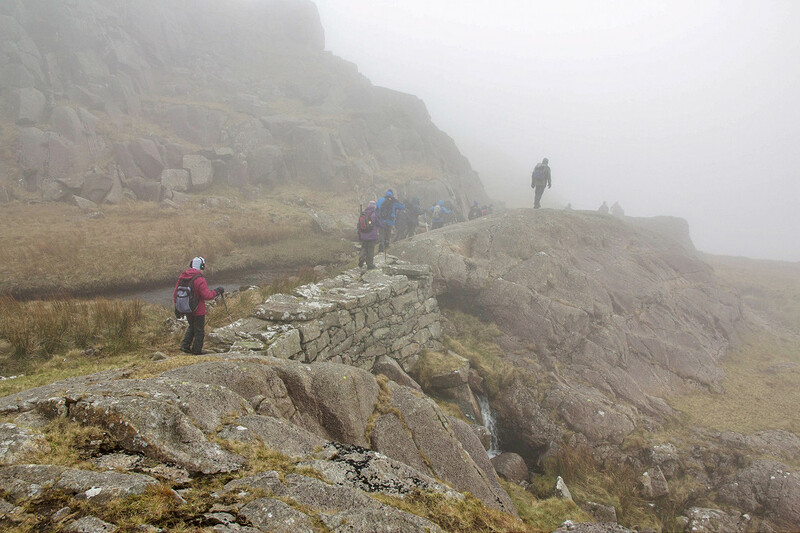 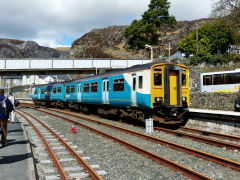 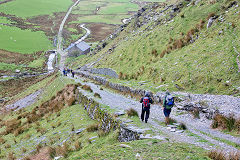 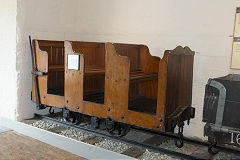 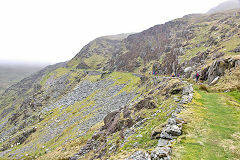 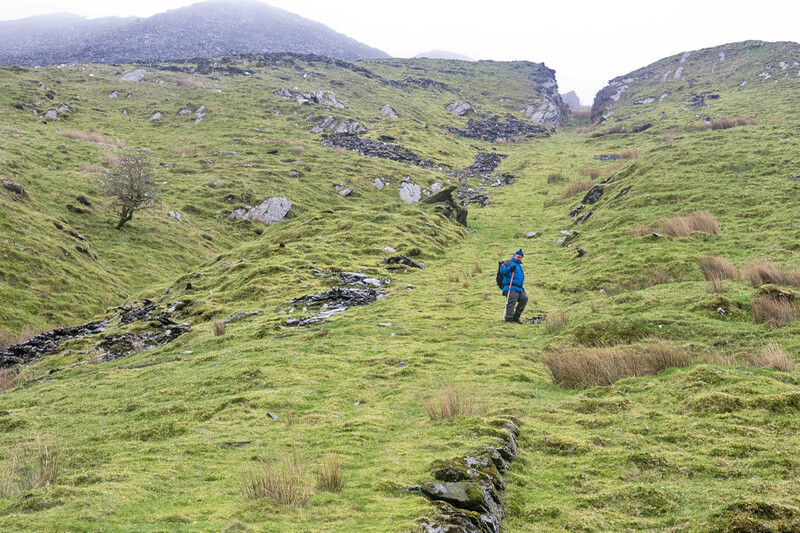 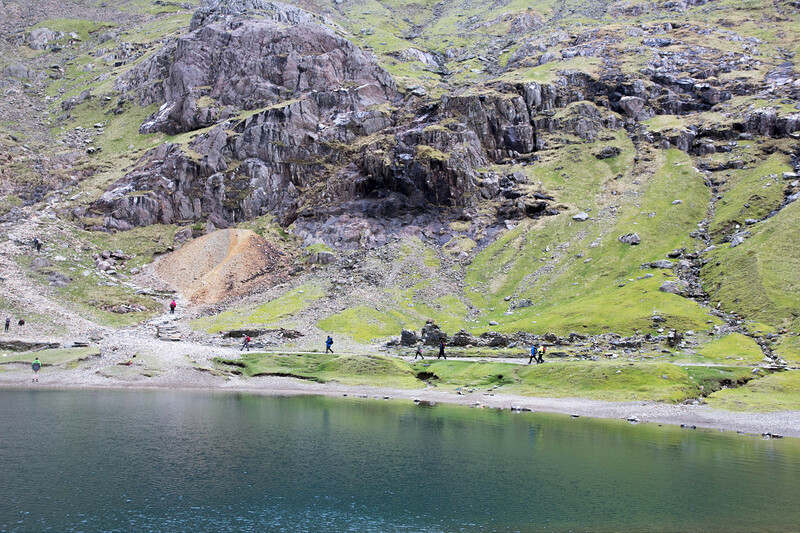 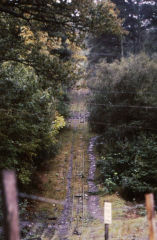 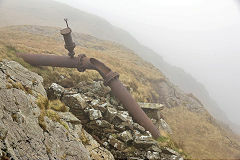 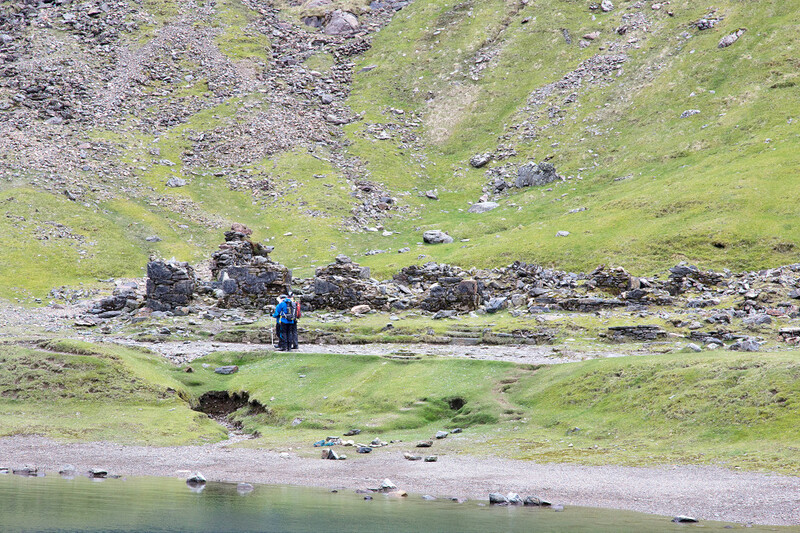 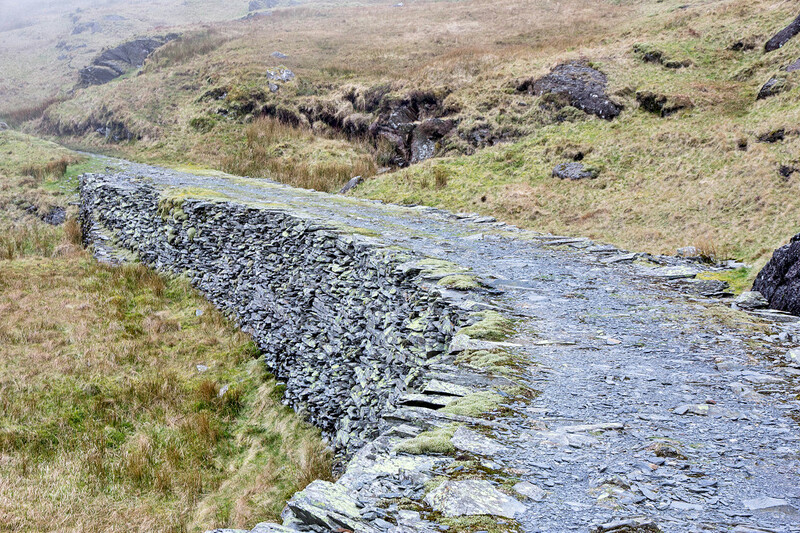 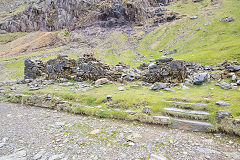 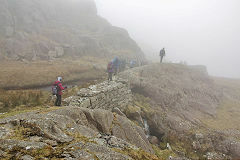 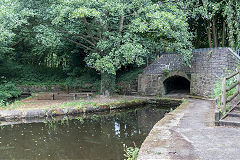 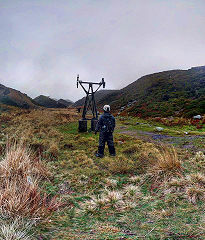 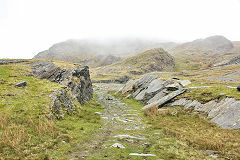 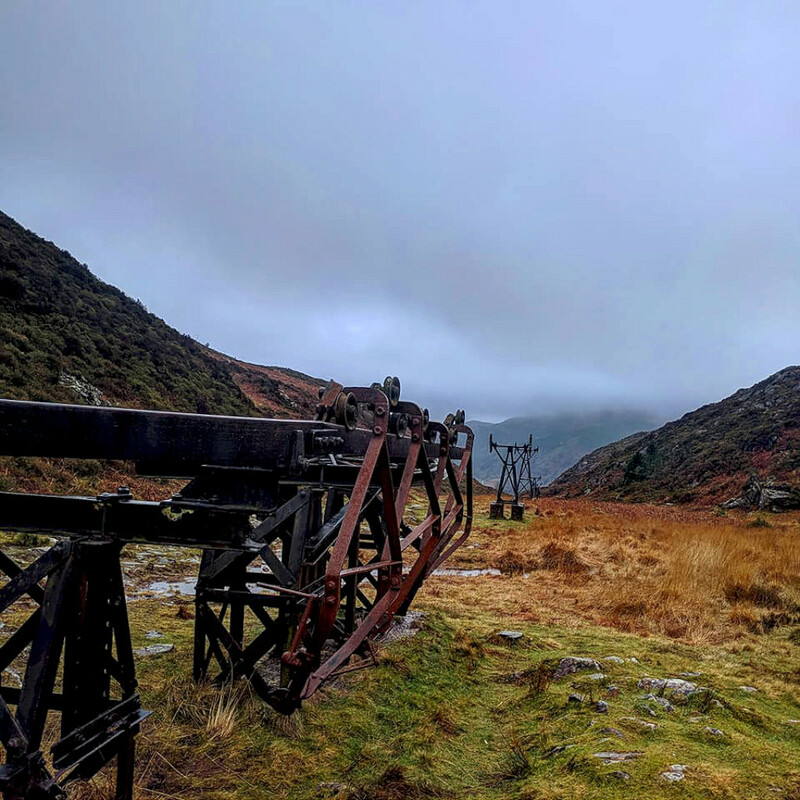 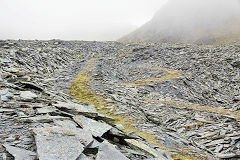 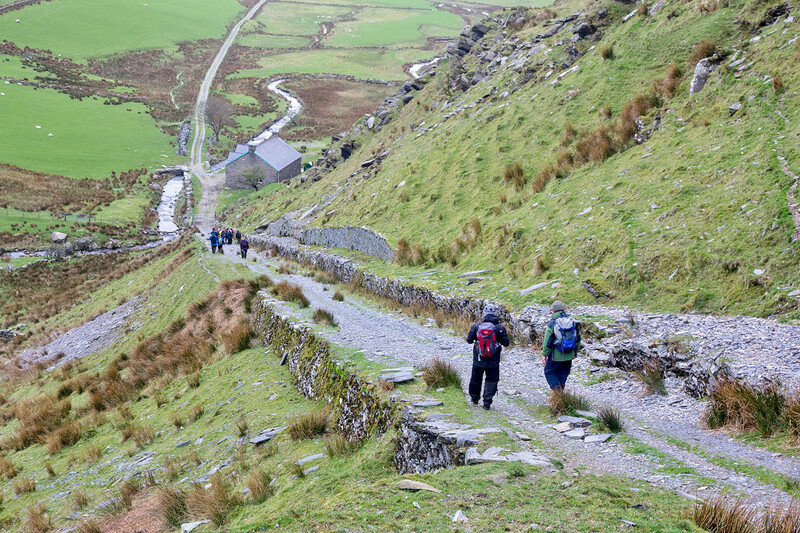 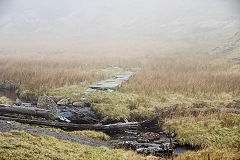 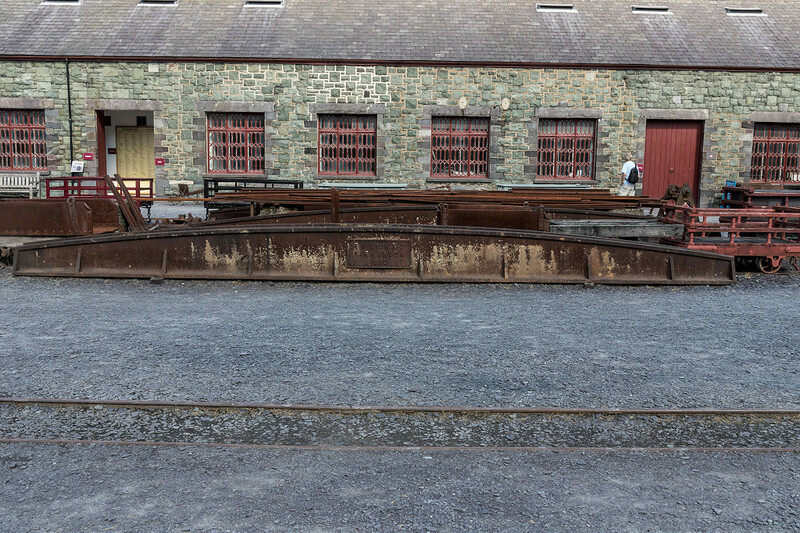 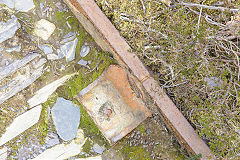 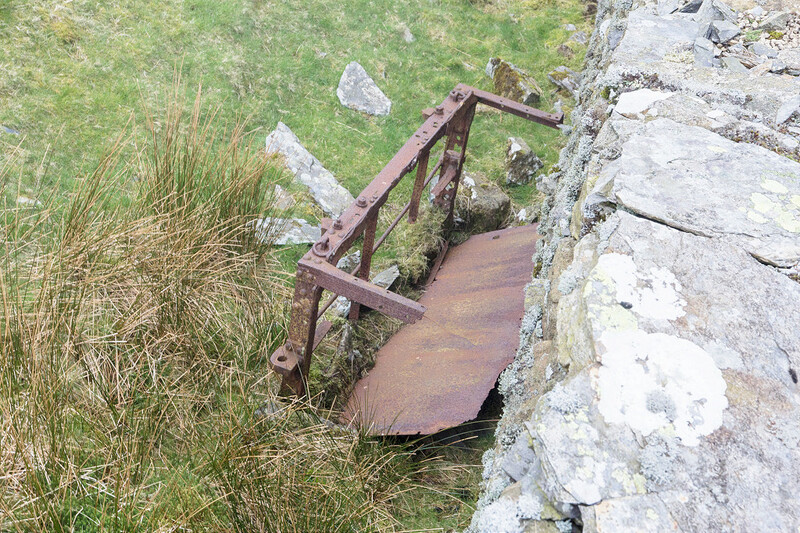 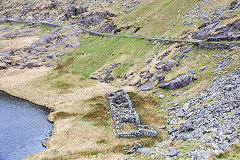 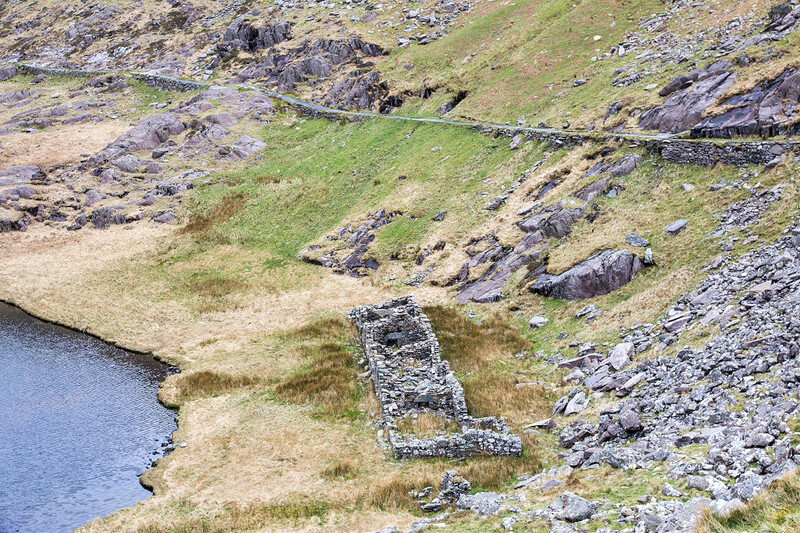 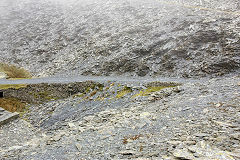 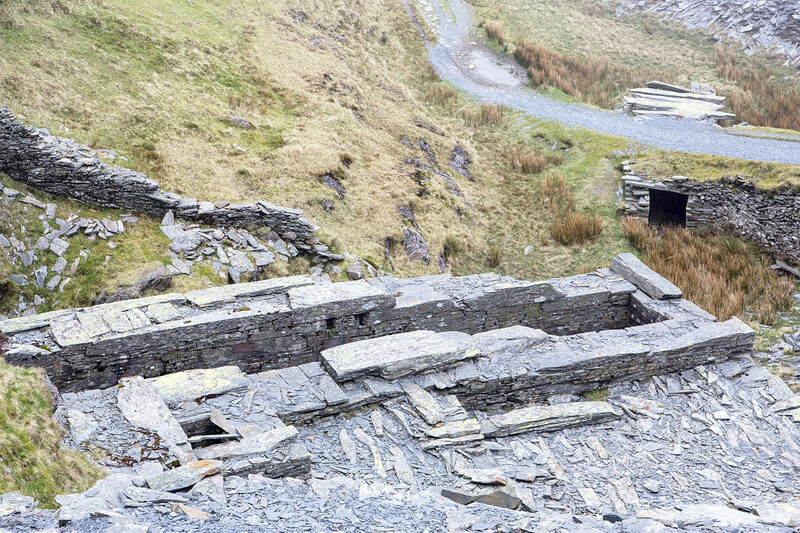 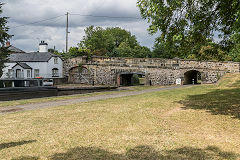 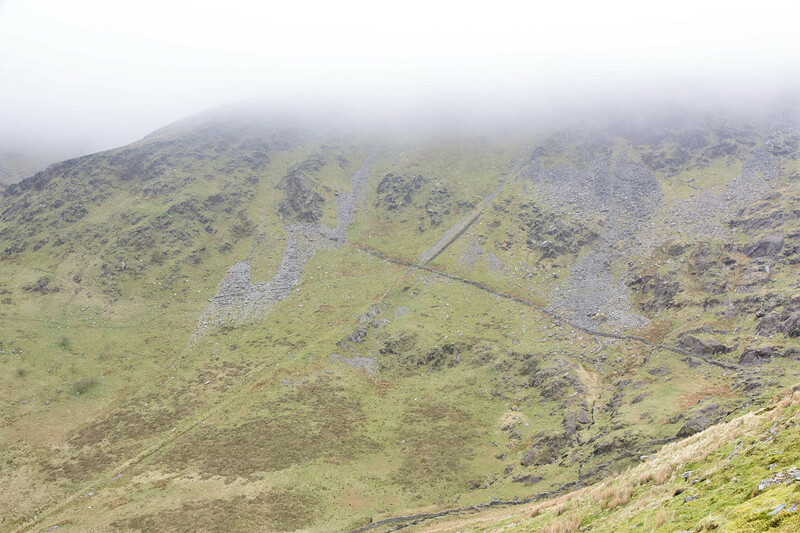 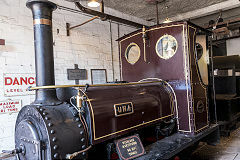 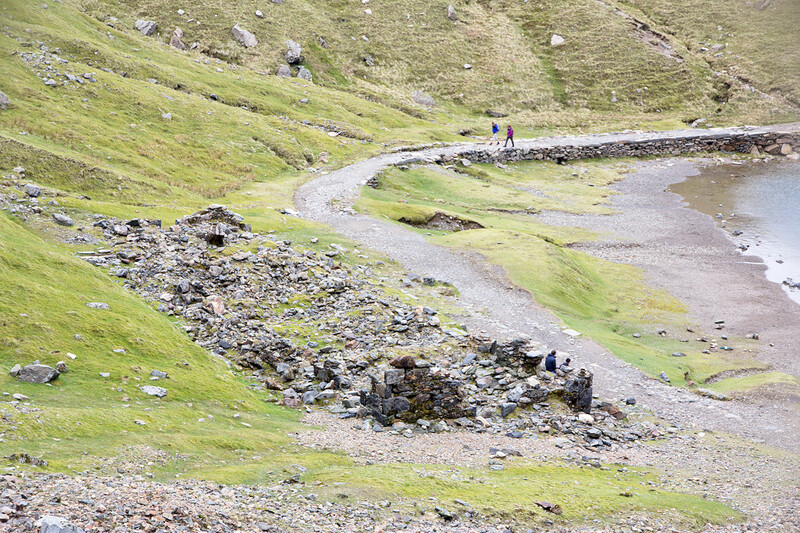 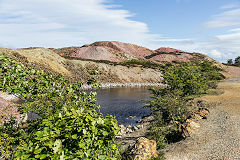 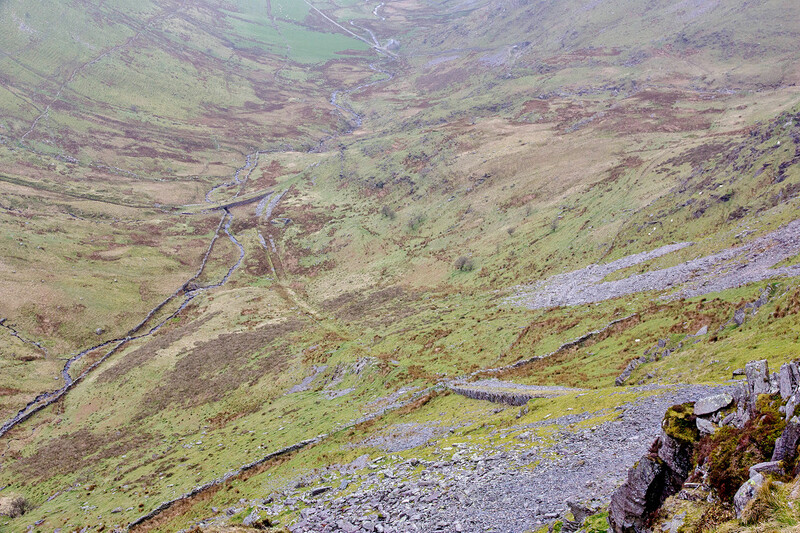 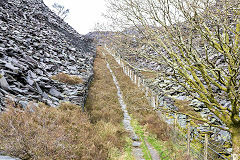 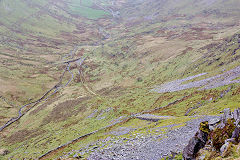 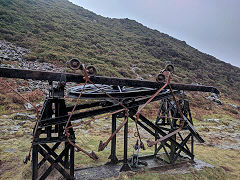 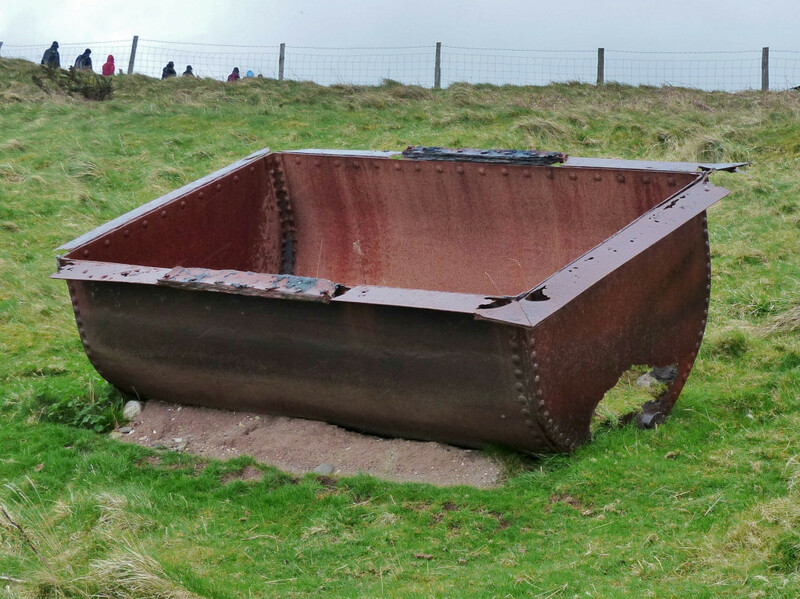 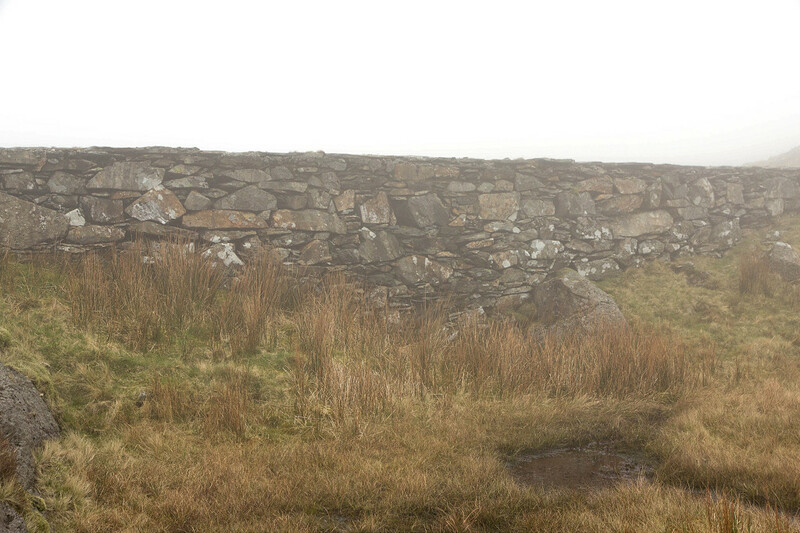 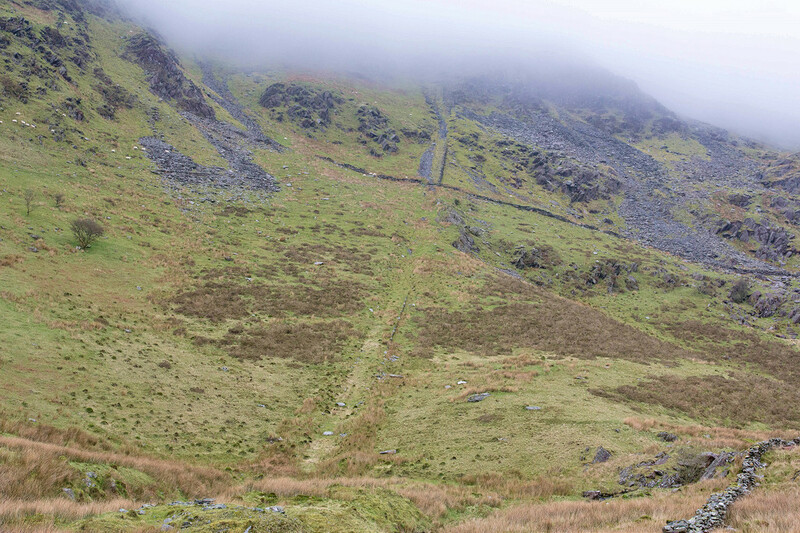 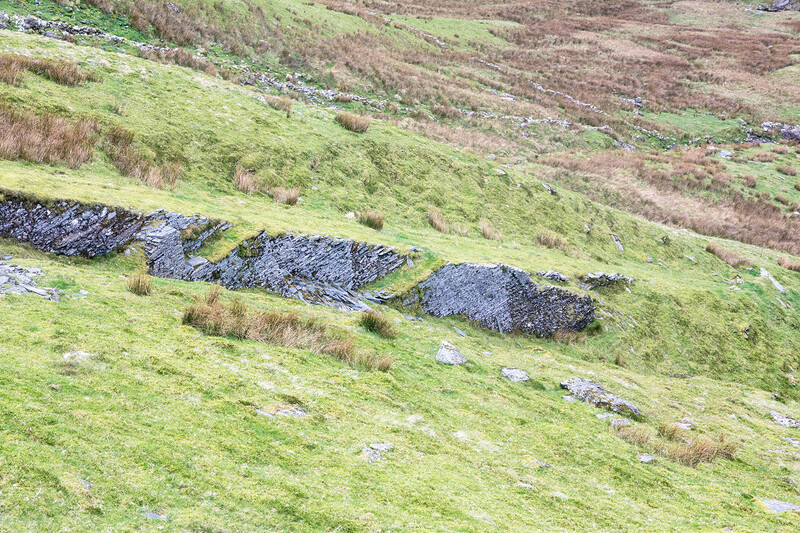 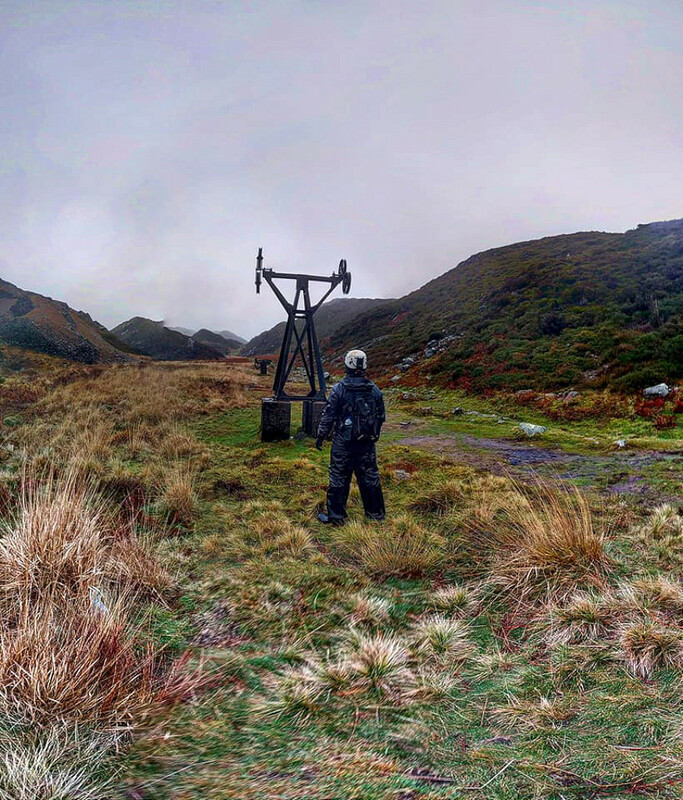 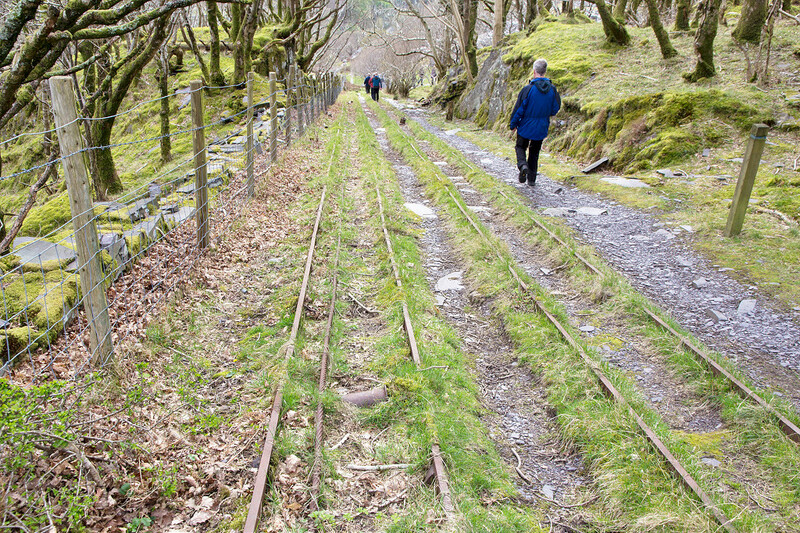 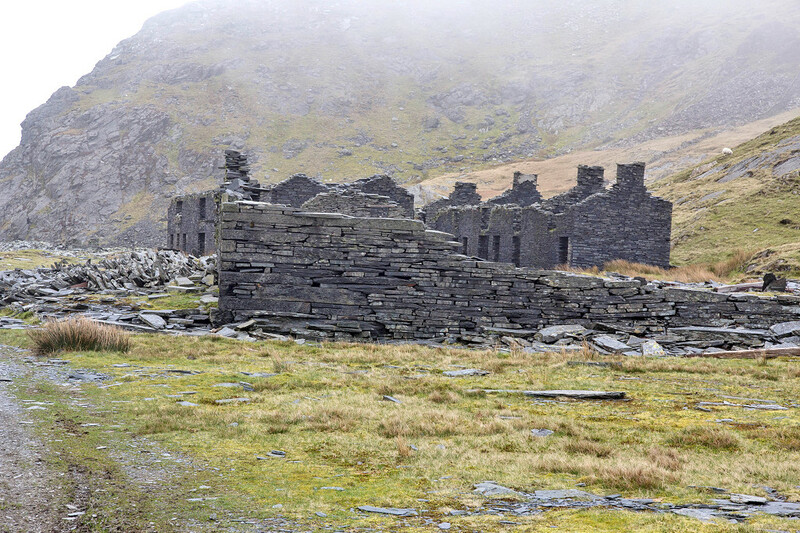 The Miners Track was in use by 1813 and by 1898 had gone through the 'Green Lake', 'Snowdon' and 'Great Snowdon' mining companies to become the 'Brittania Mining Co', responsible for most of the existing leftovers. 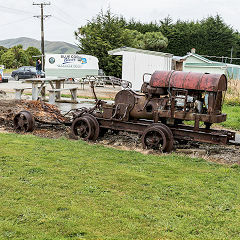 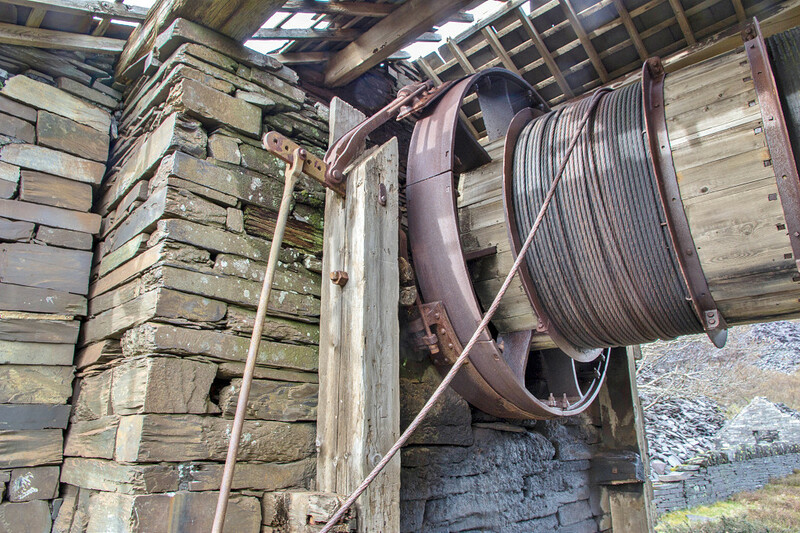 Despite new equipment, a aerial ropeway, electicity and a Pelton Wheel, mining finally finished in 1916. 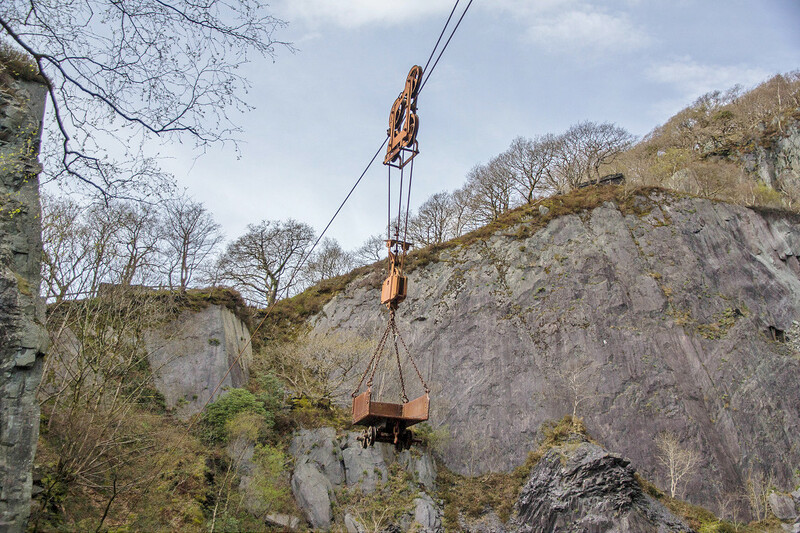 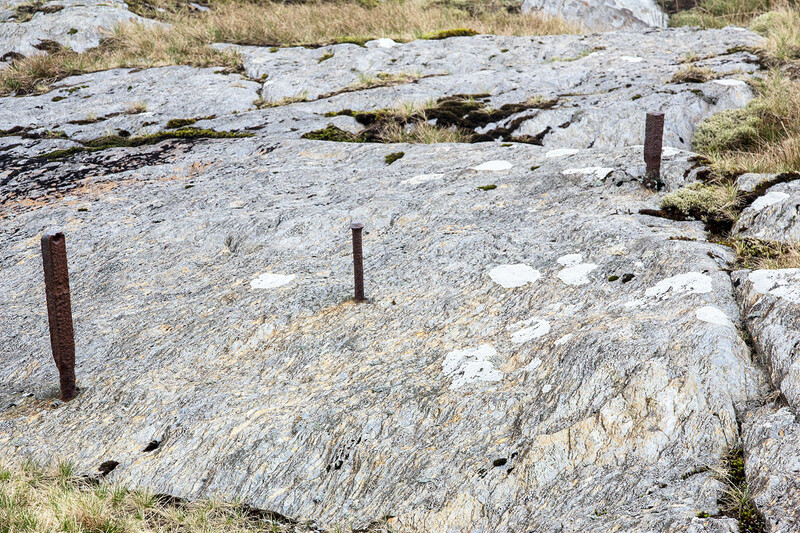 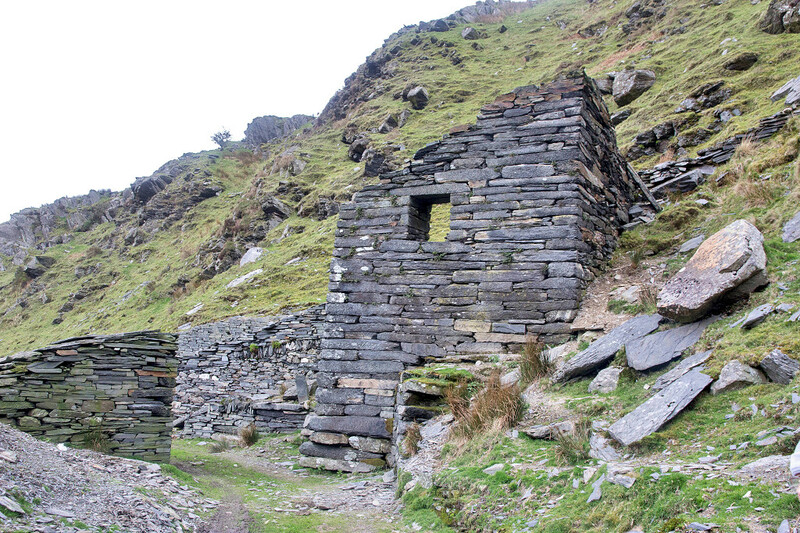 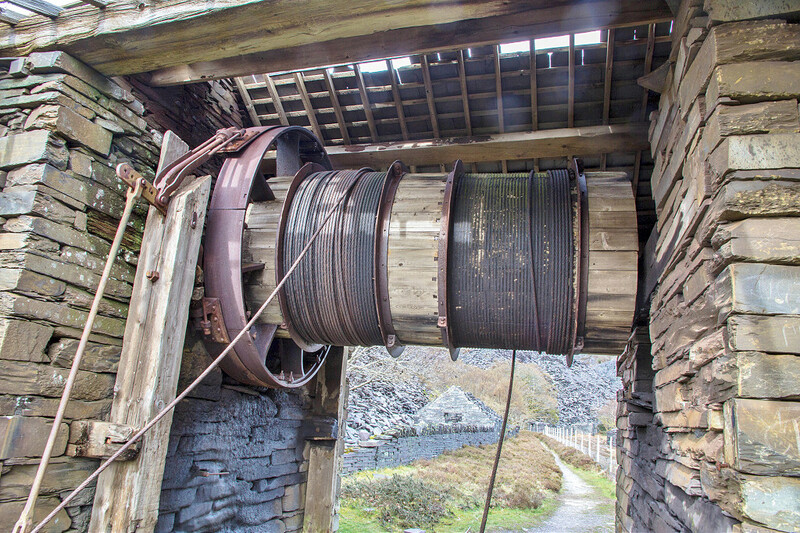 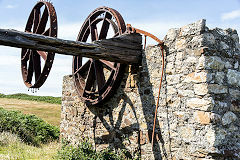 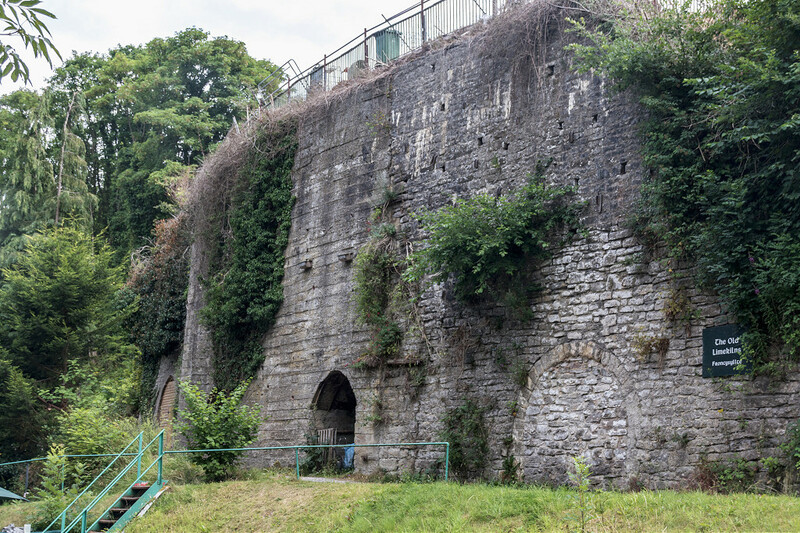 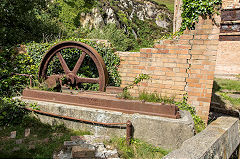 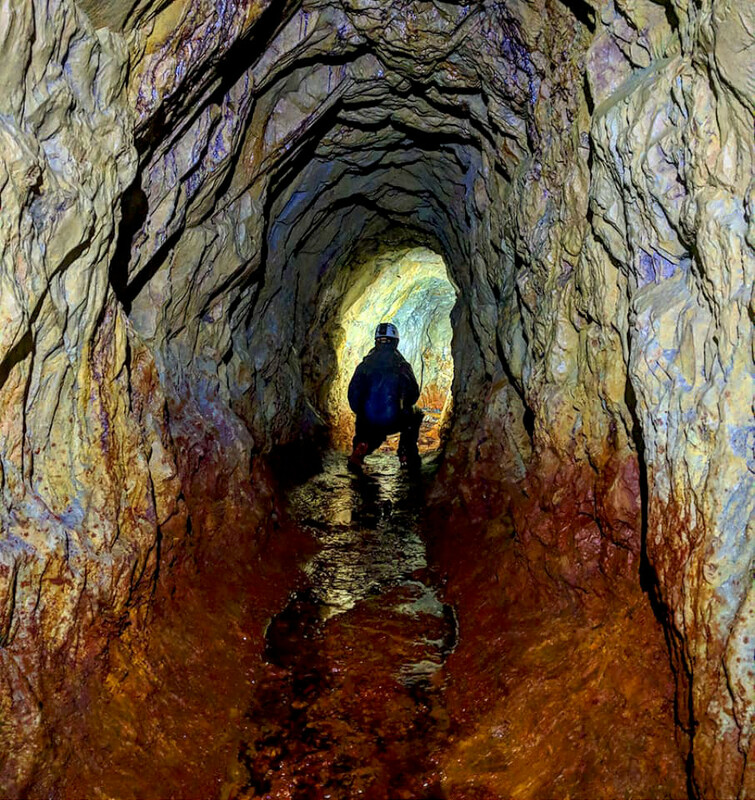 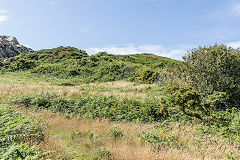 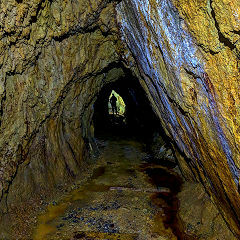 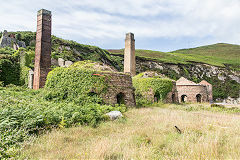 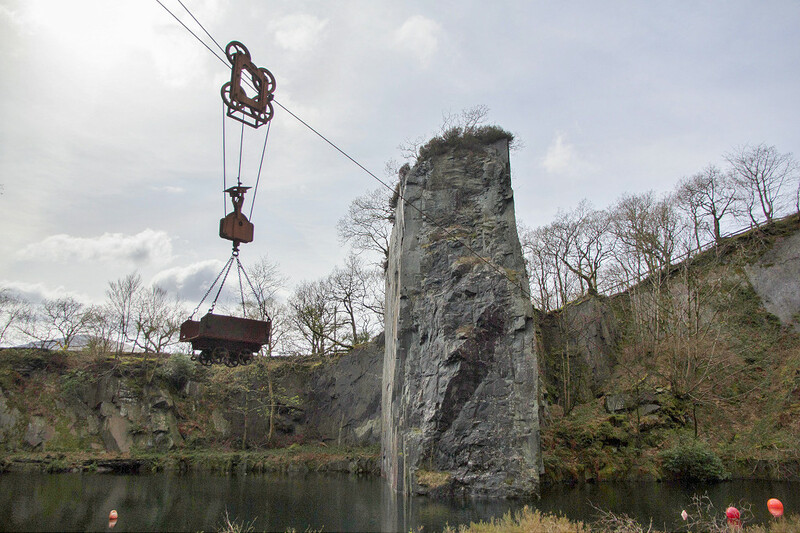 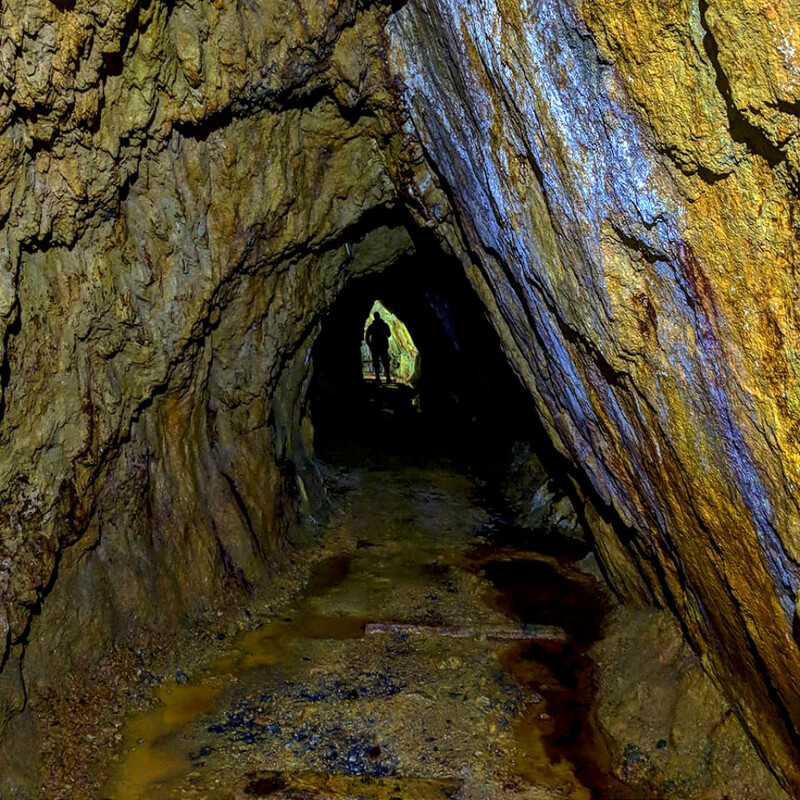 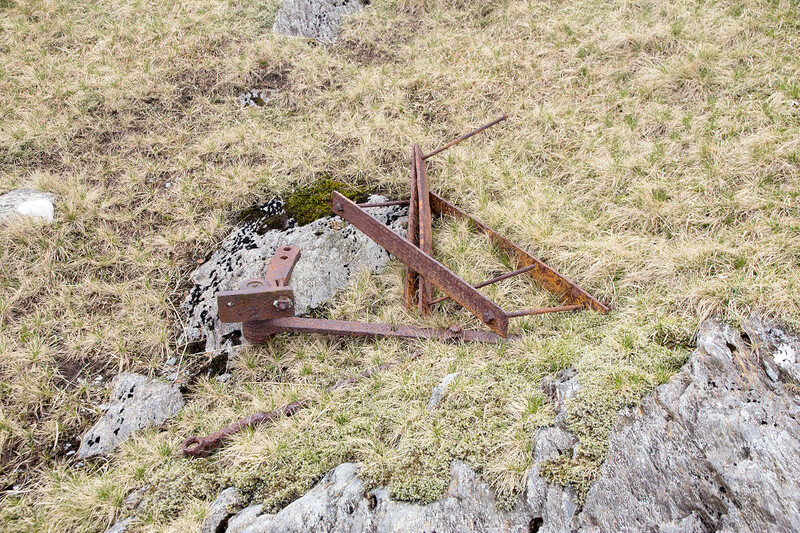 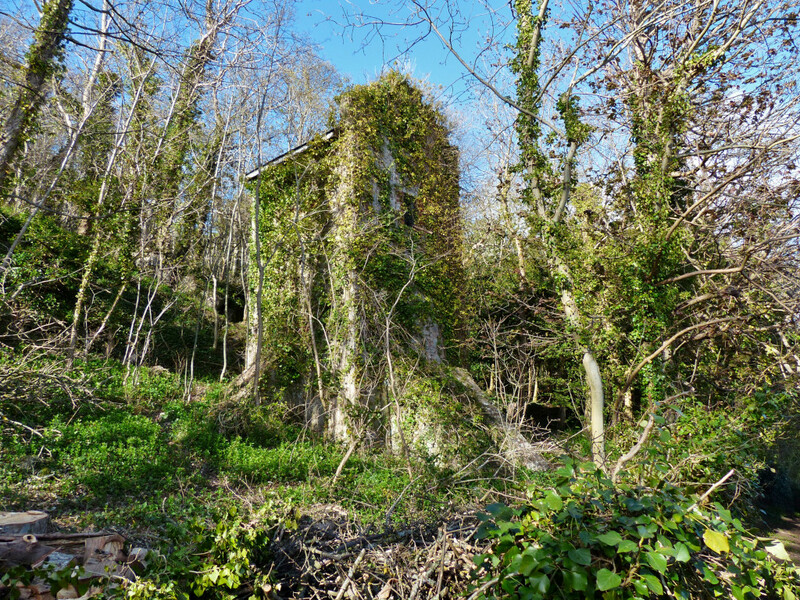 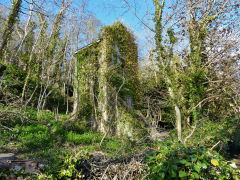 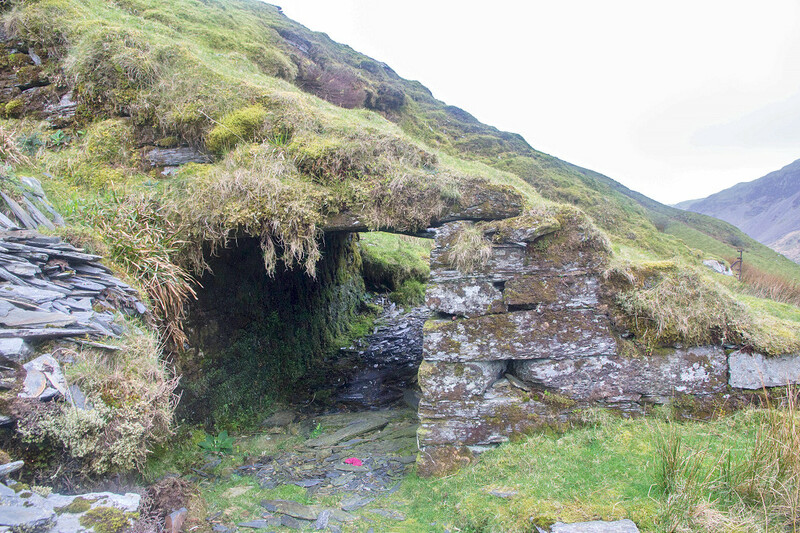 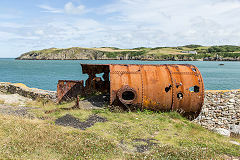 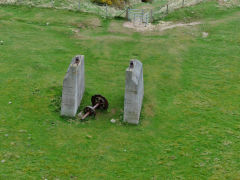 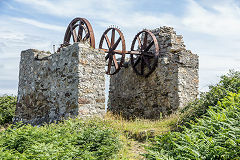 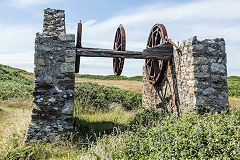 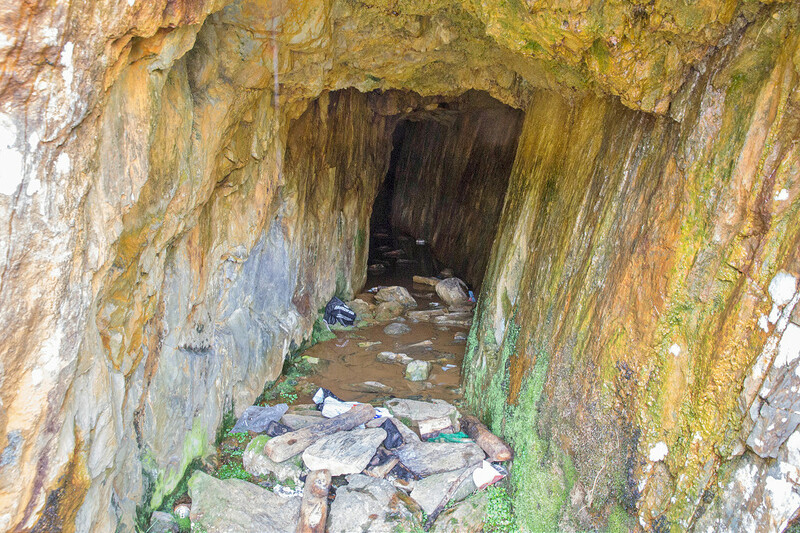 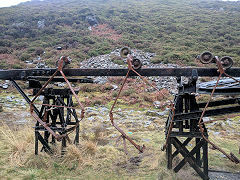 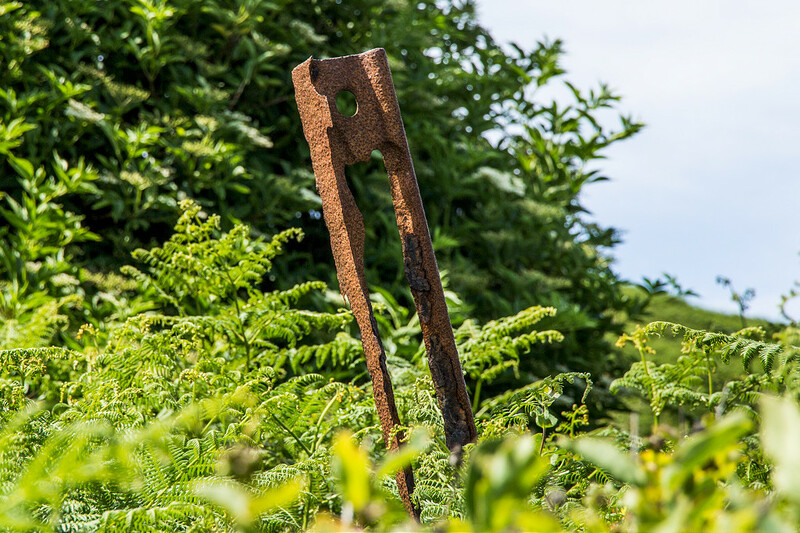 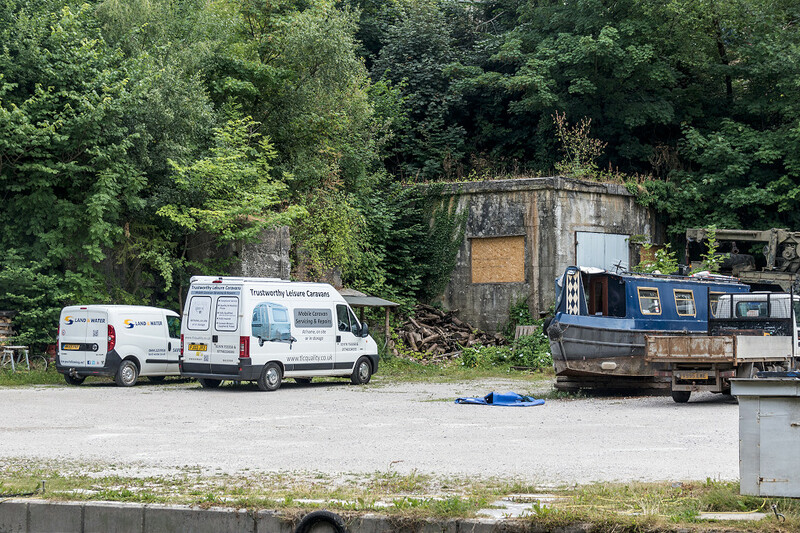 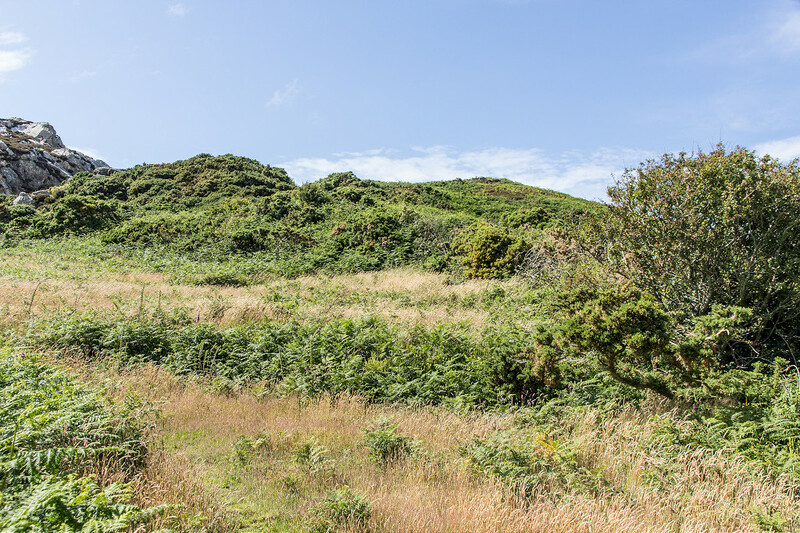 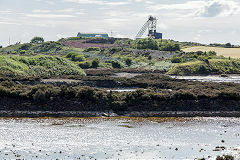 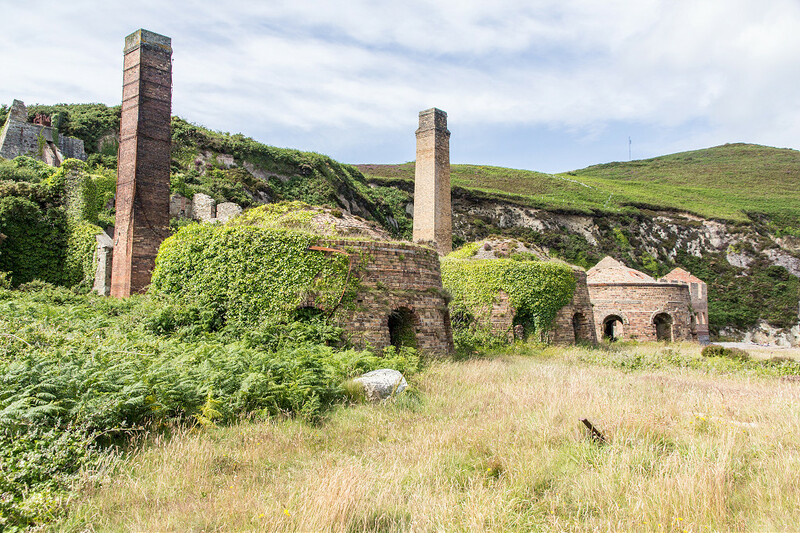 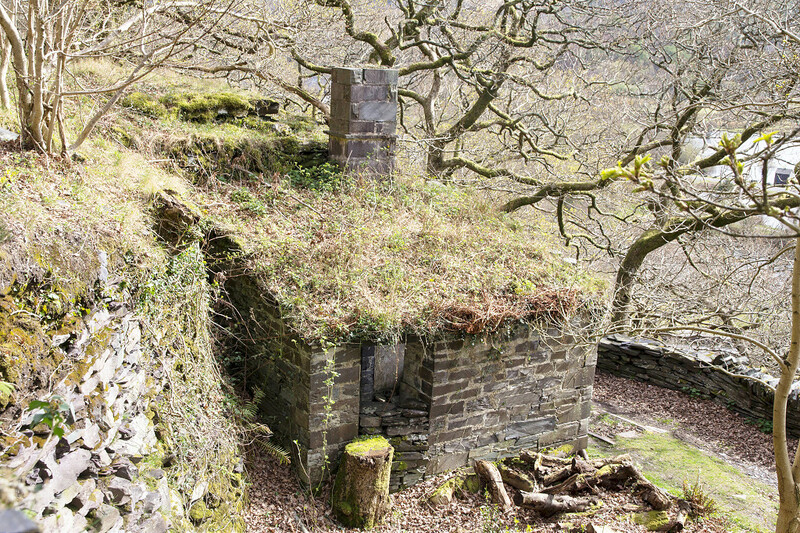 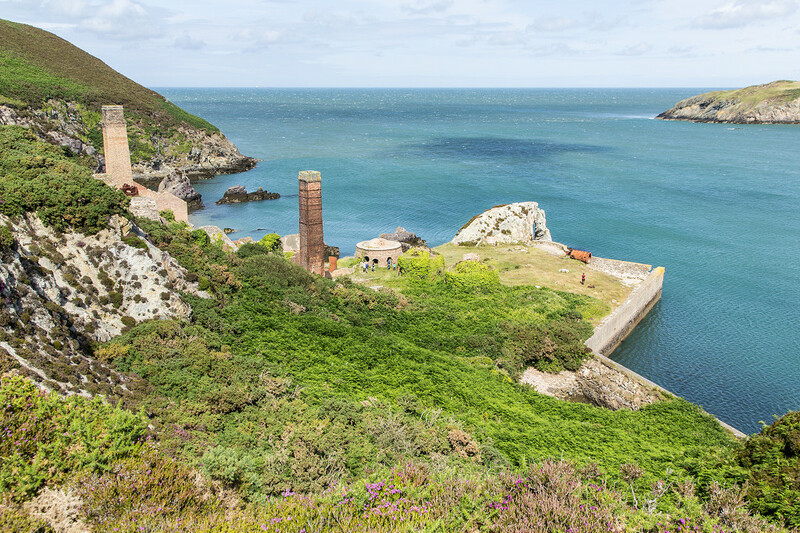 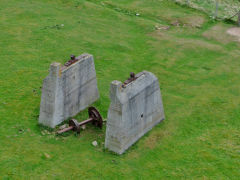 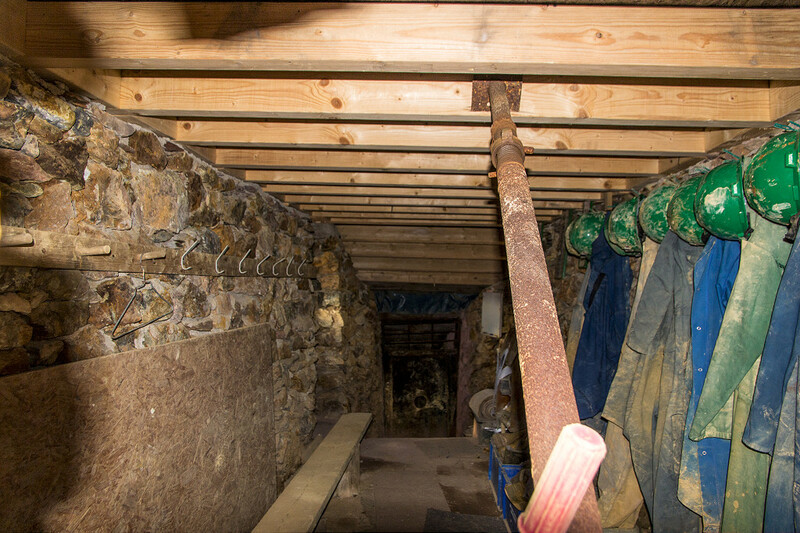 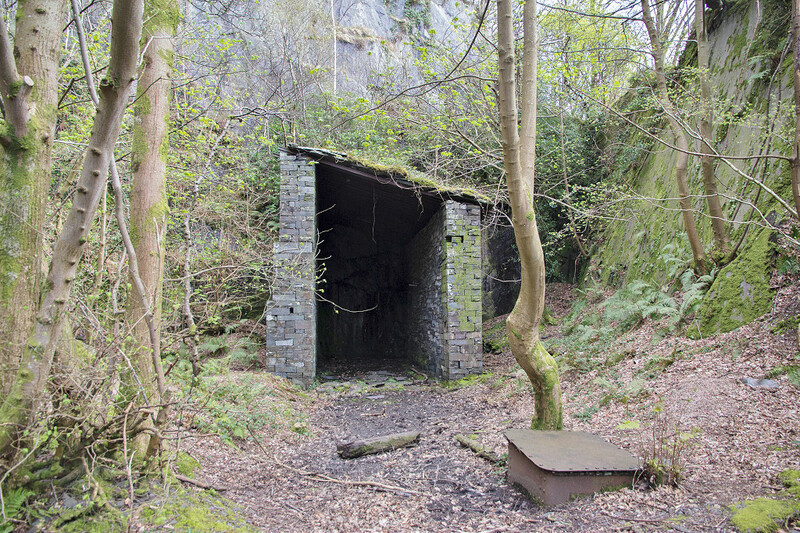 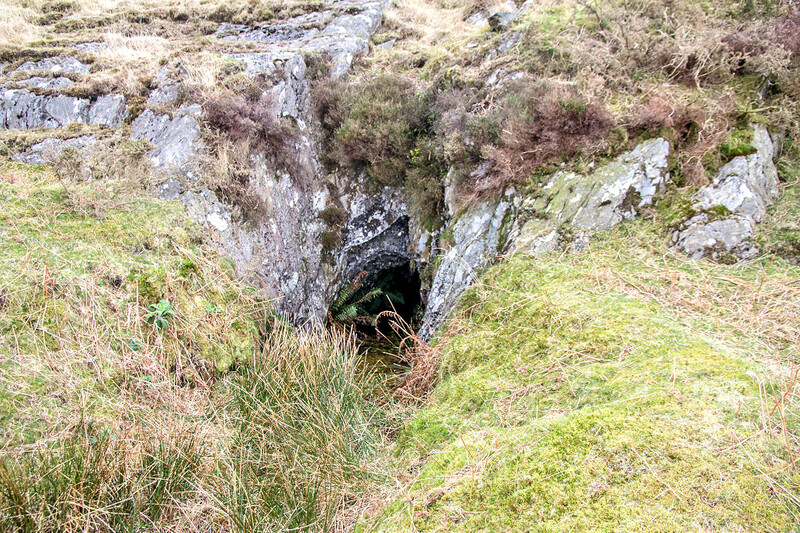 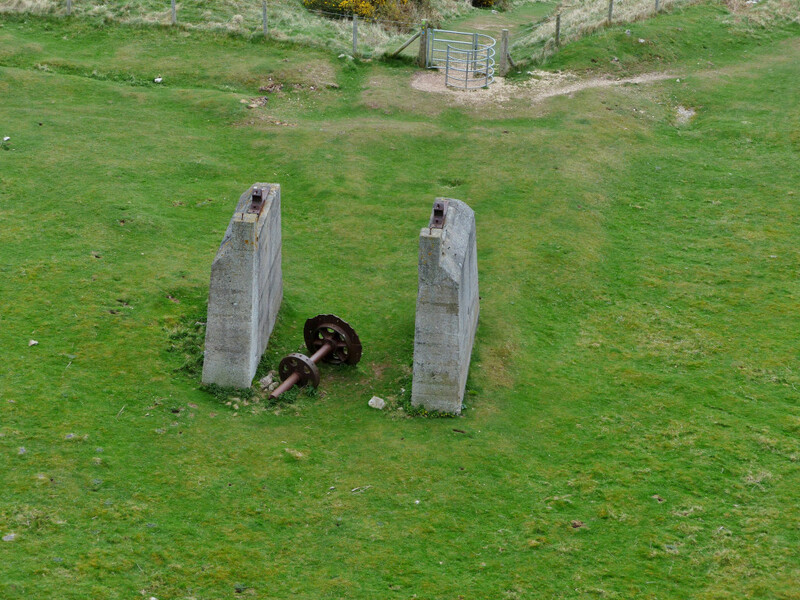 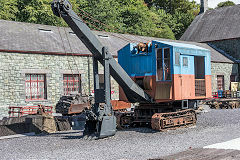 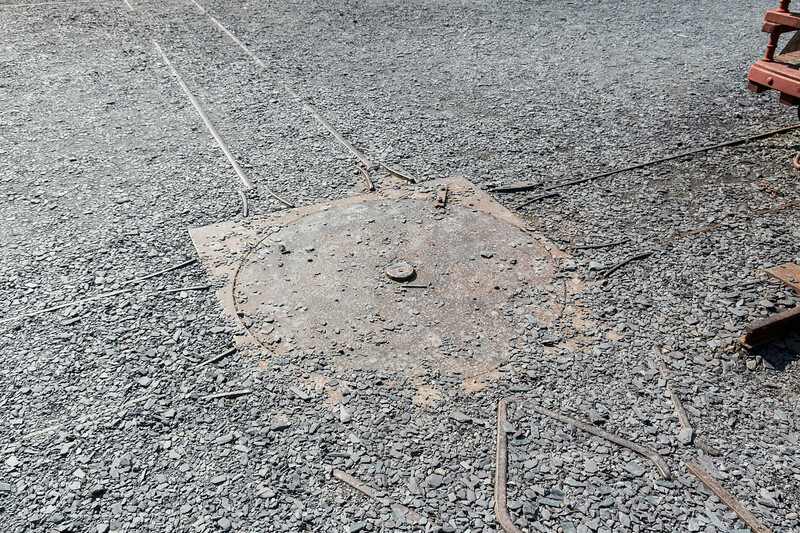 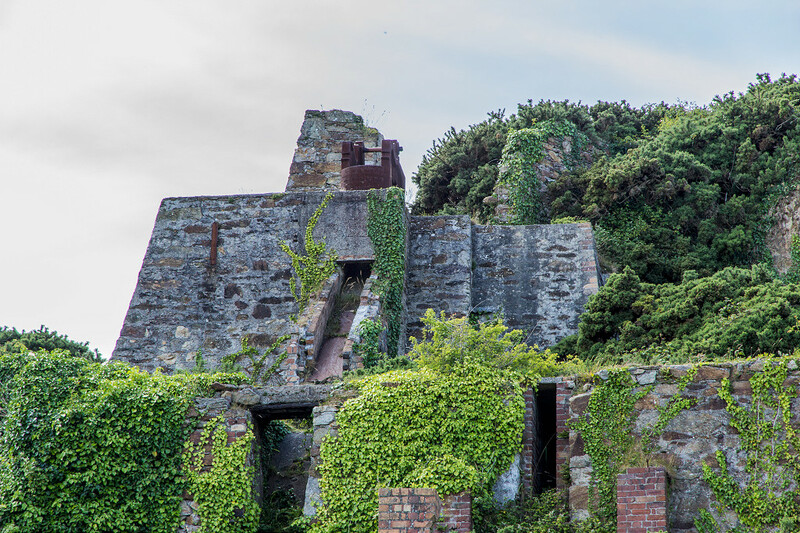 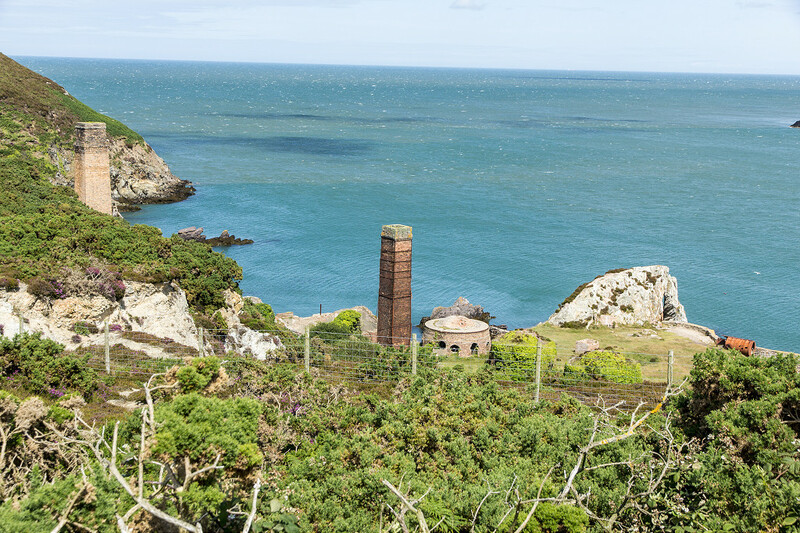 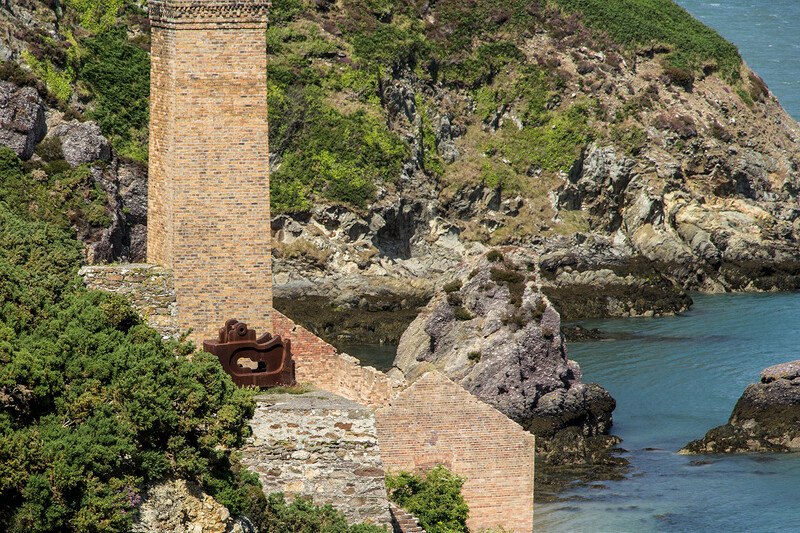 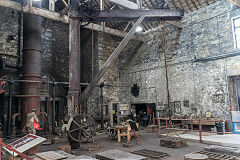 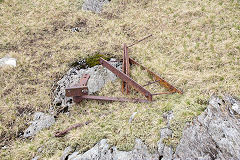 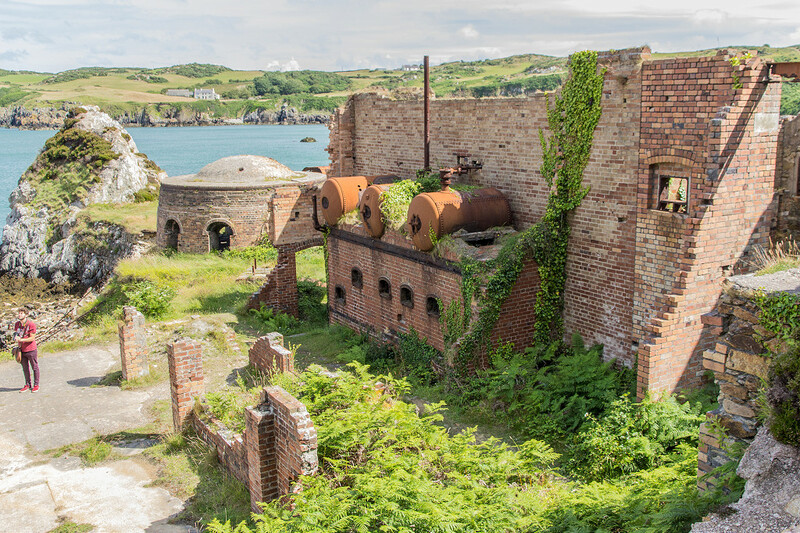 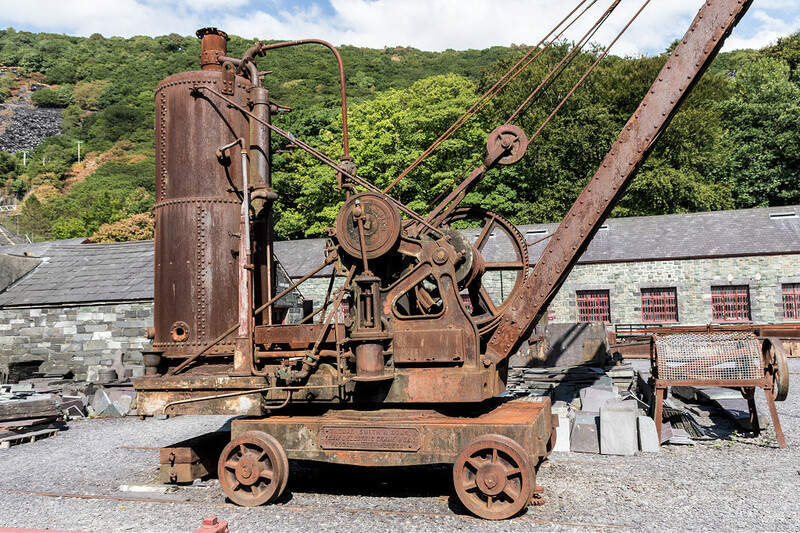 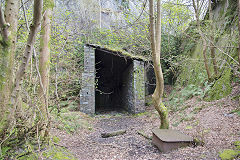 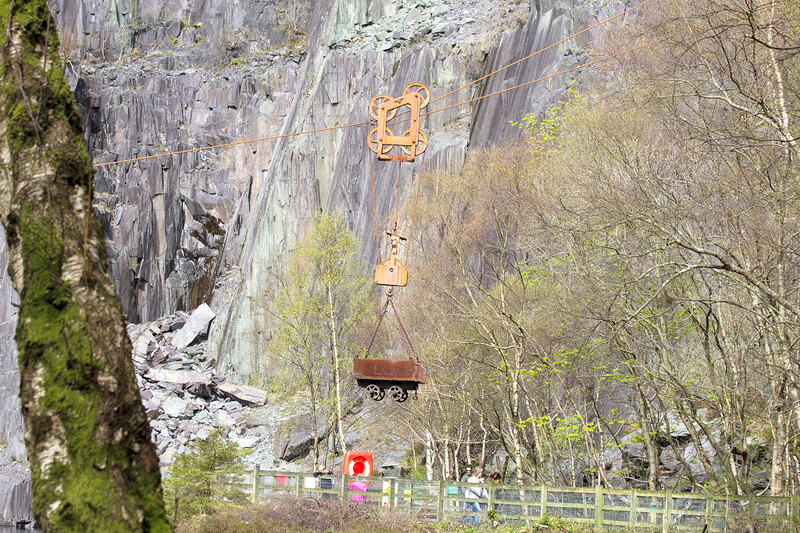 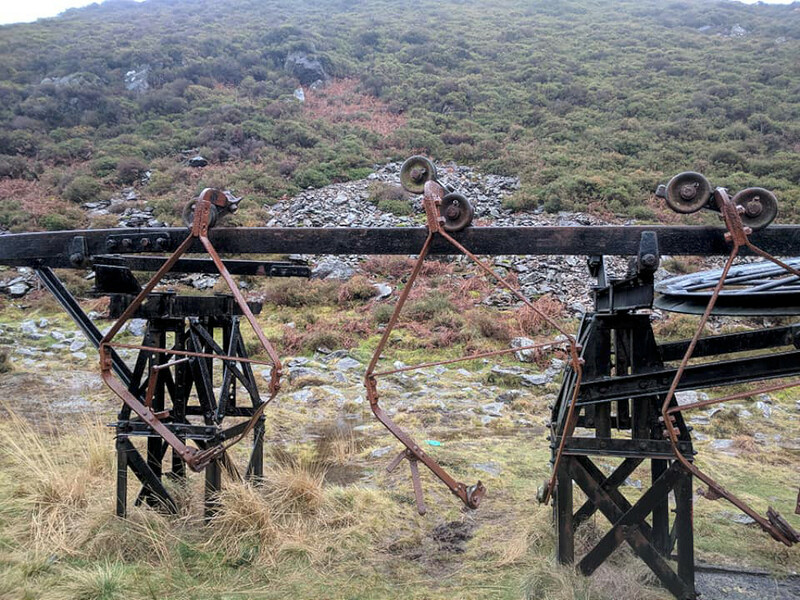 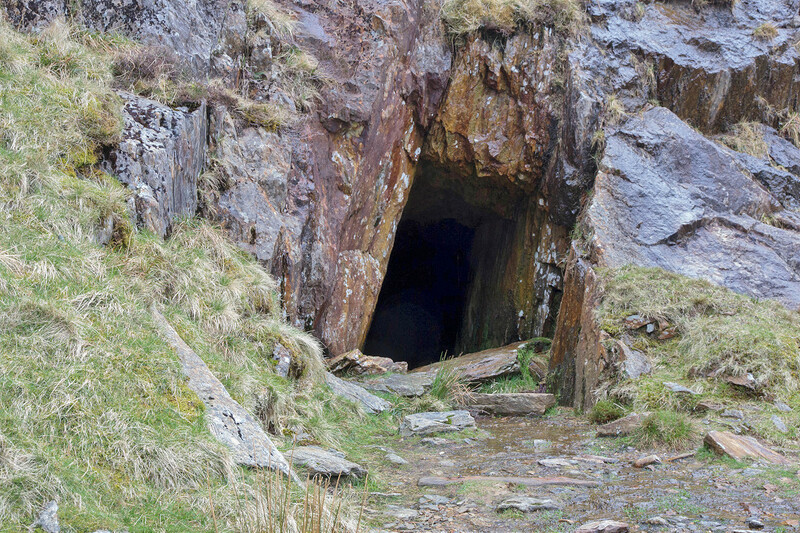 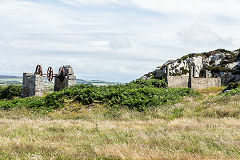 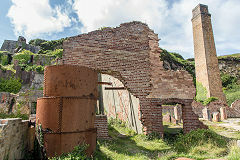 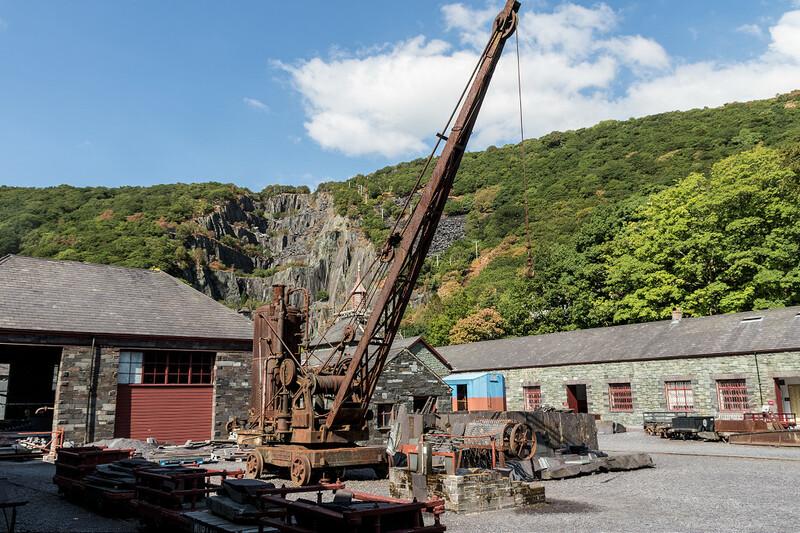 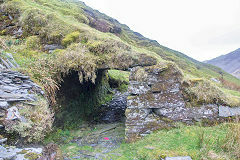 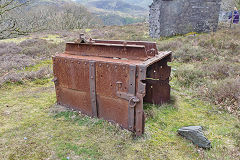 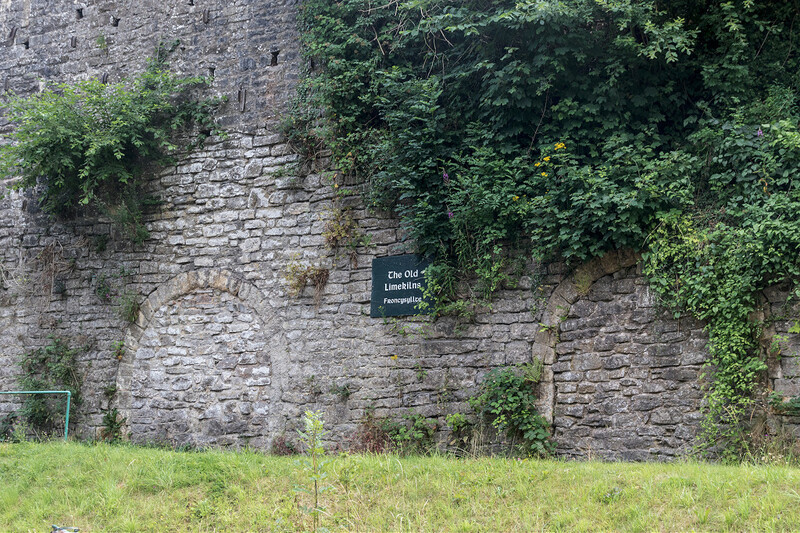 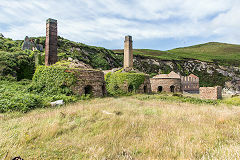 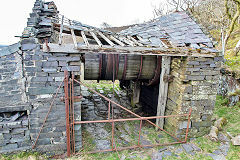 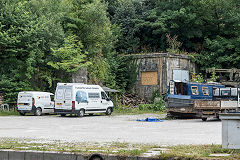 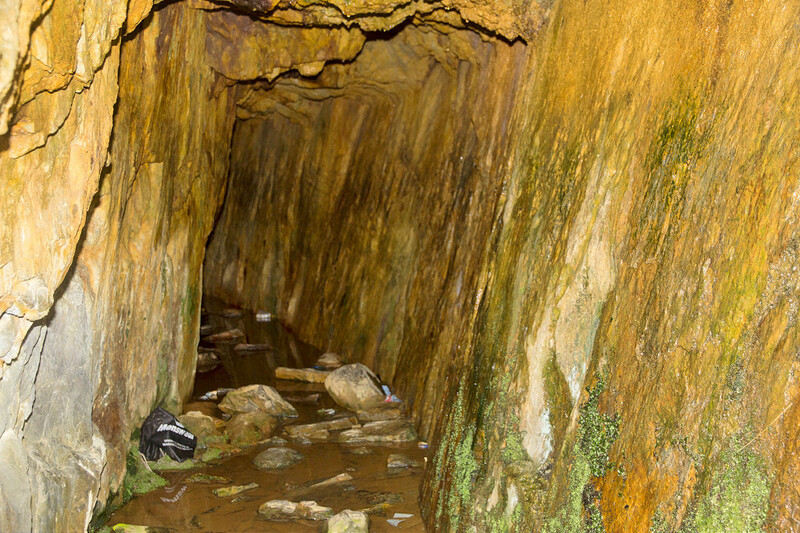 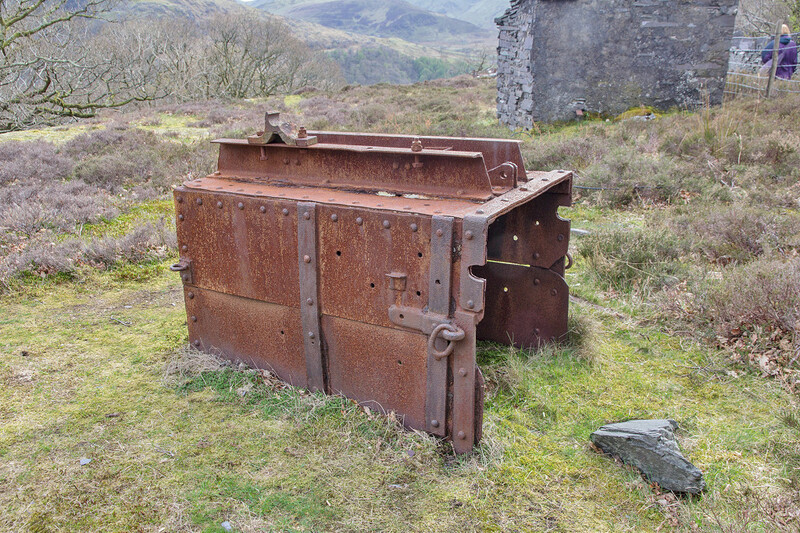 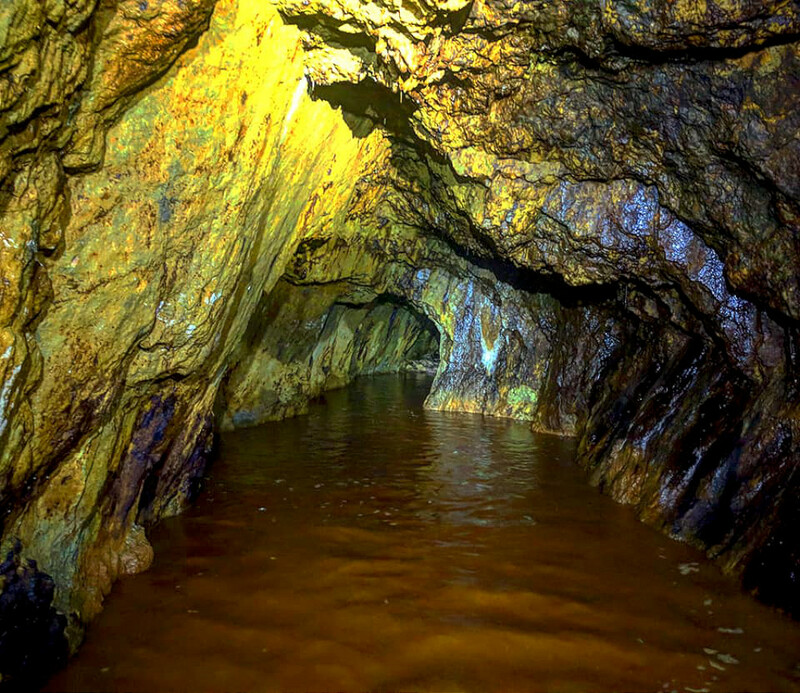 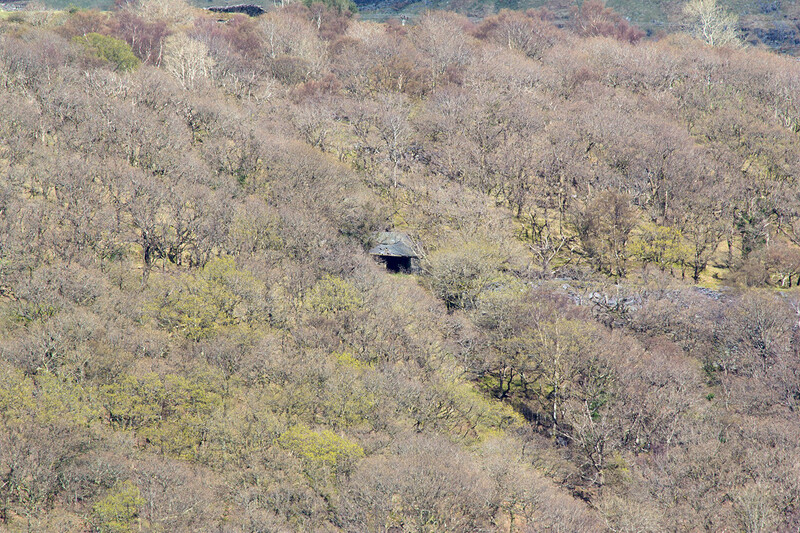 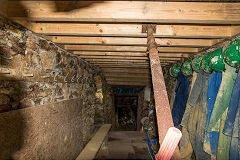 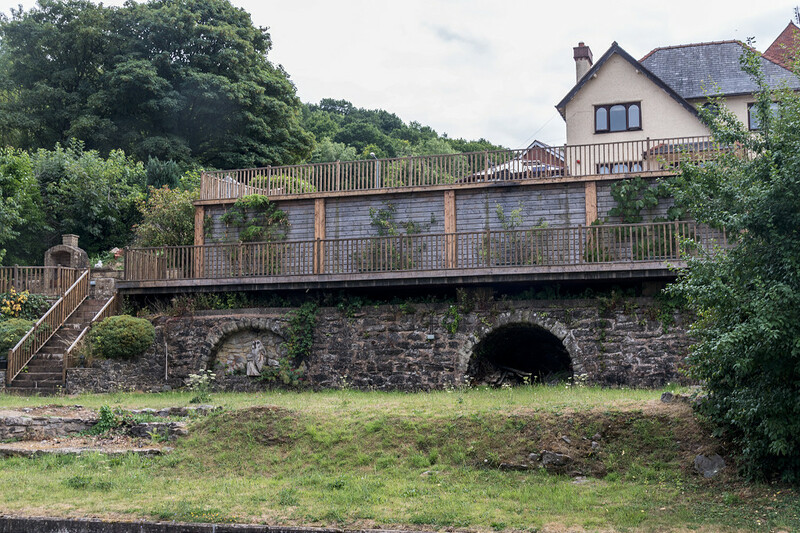 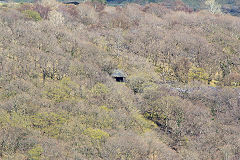 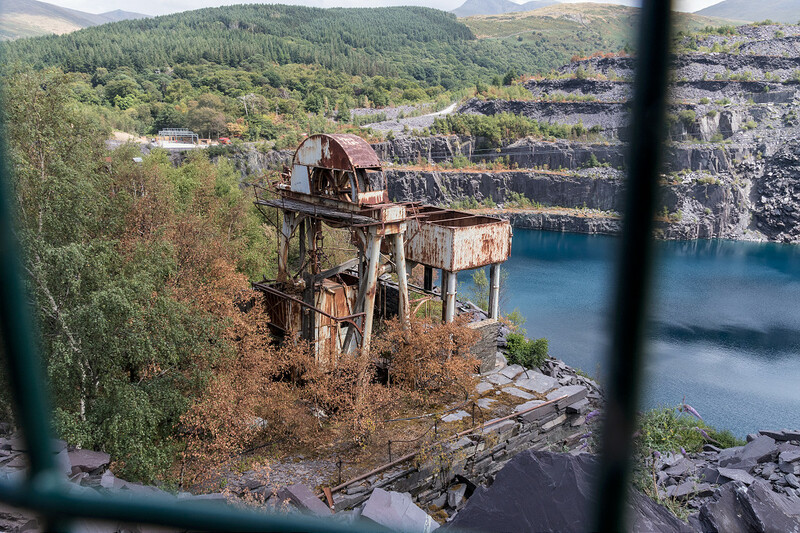 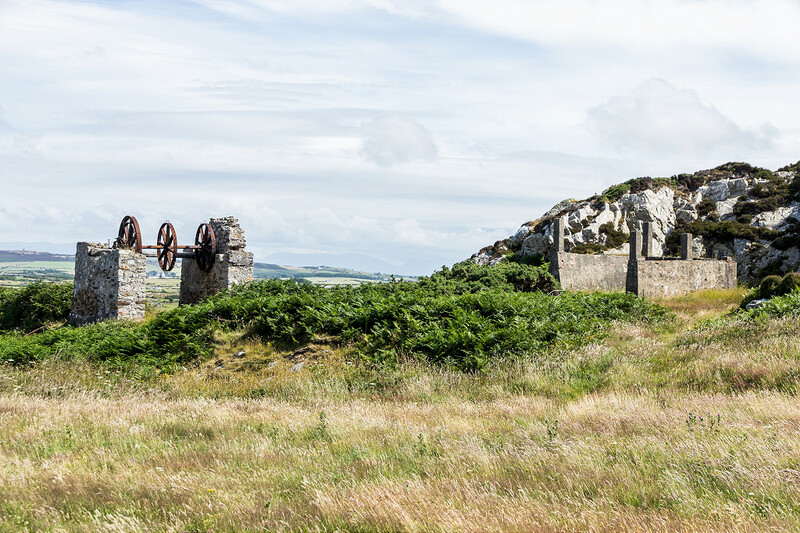 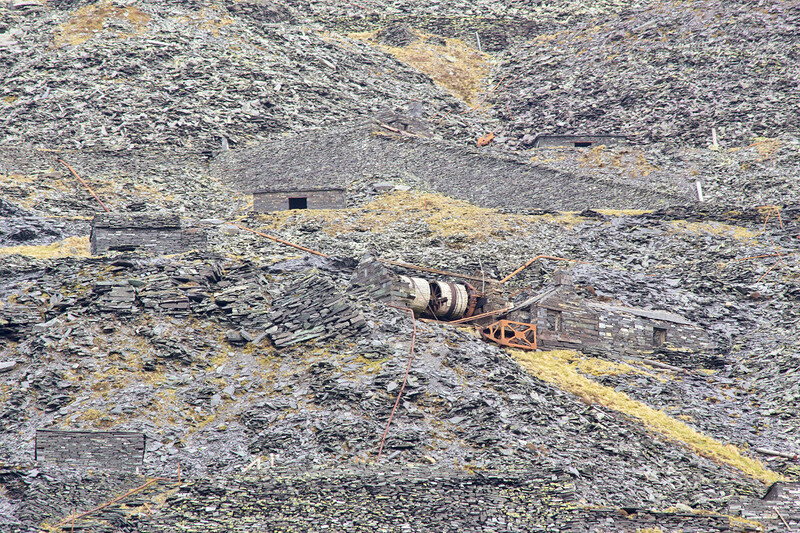 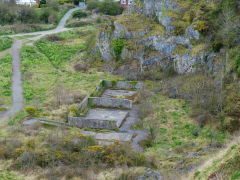 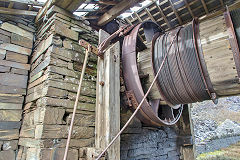 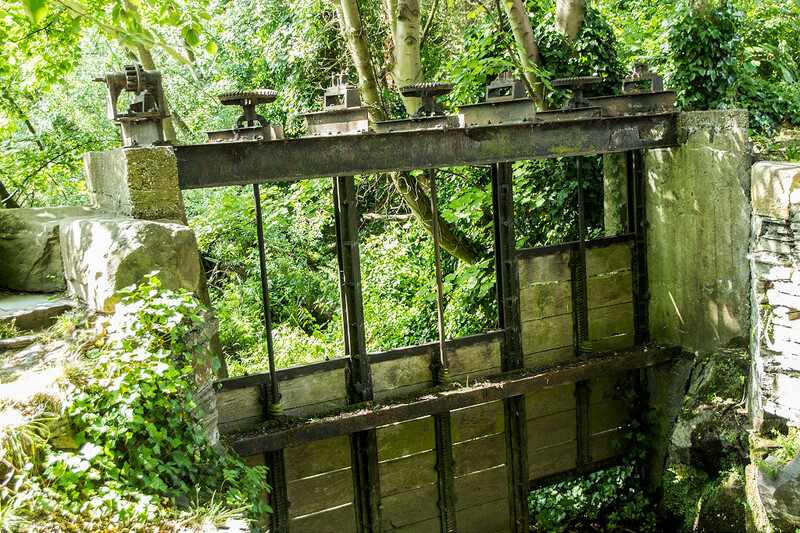 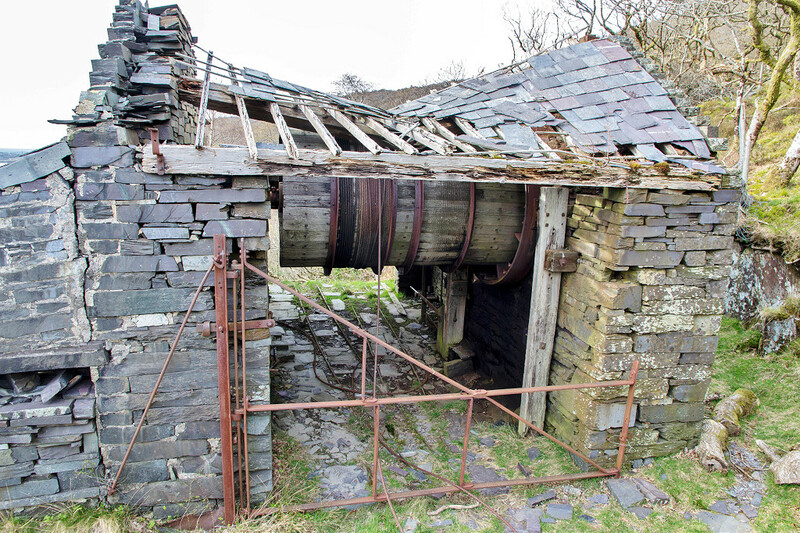 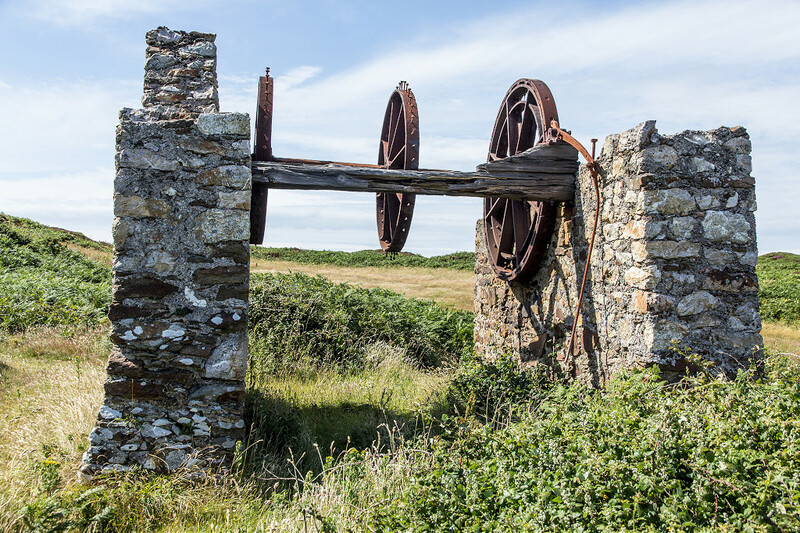 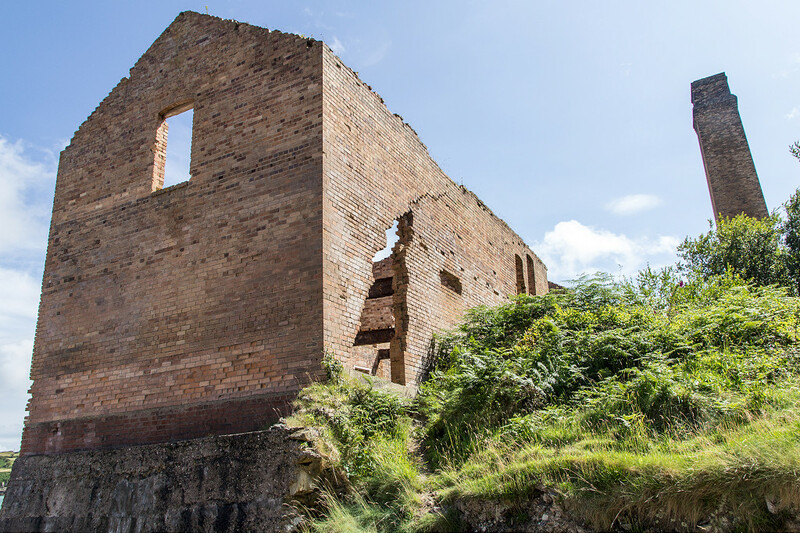 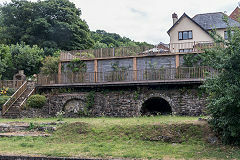 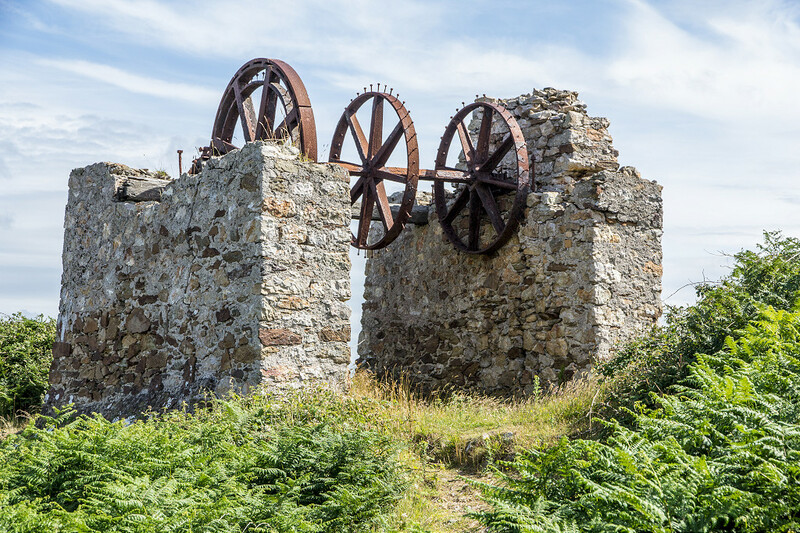 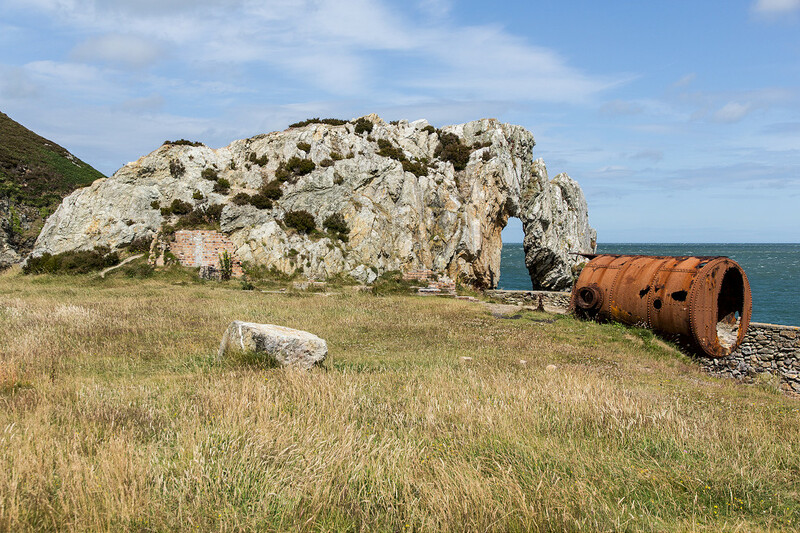 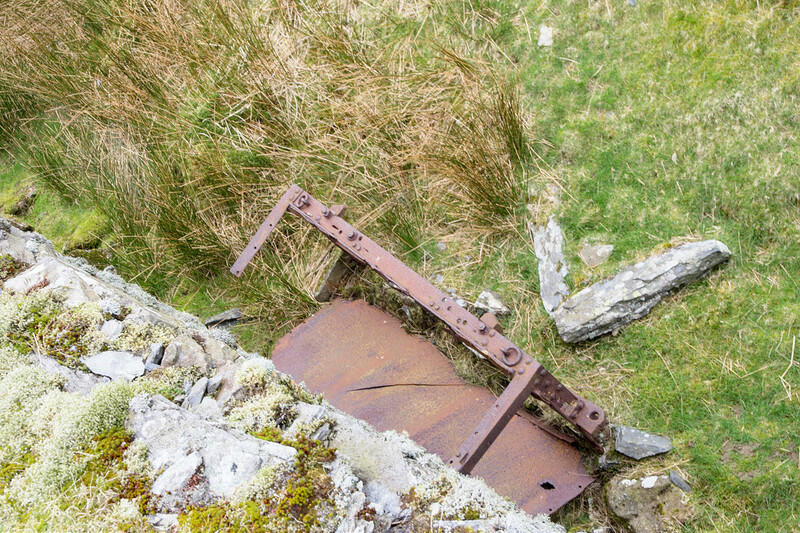 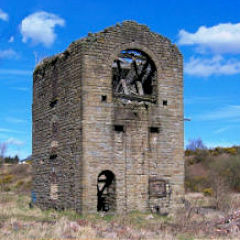 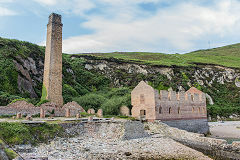 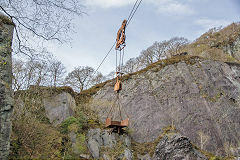 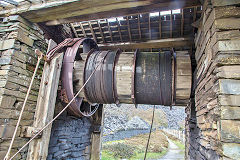 Dating from 1720, the mines at Cwm Bychan worked until c1875 but are well-known for the one-mile-long aerial ropeway that ran down to Nantmor, next to the Welsh Highland Railway. 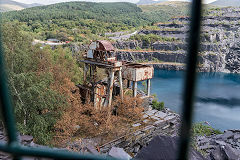 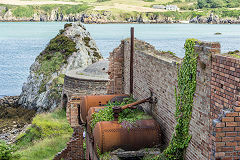 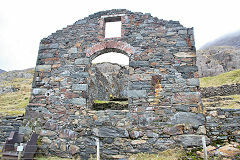 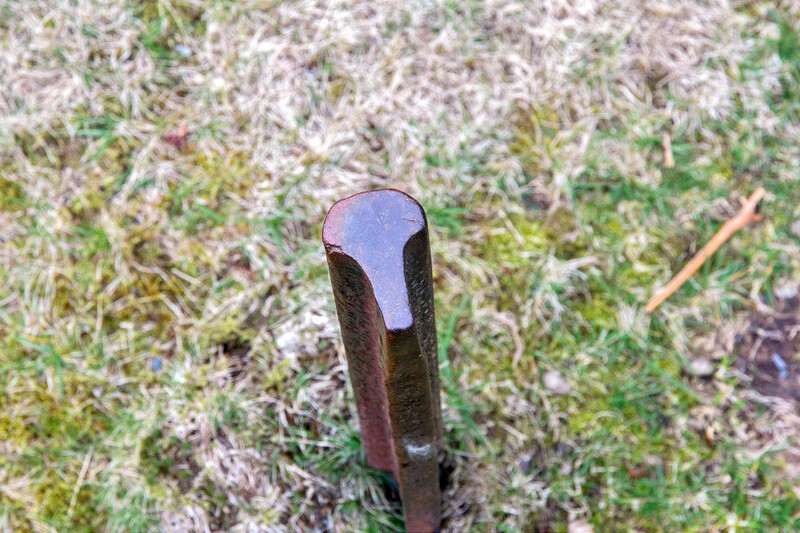 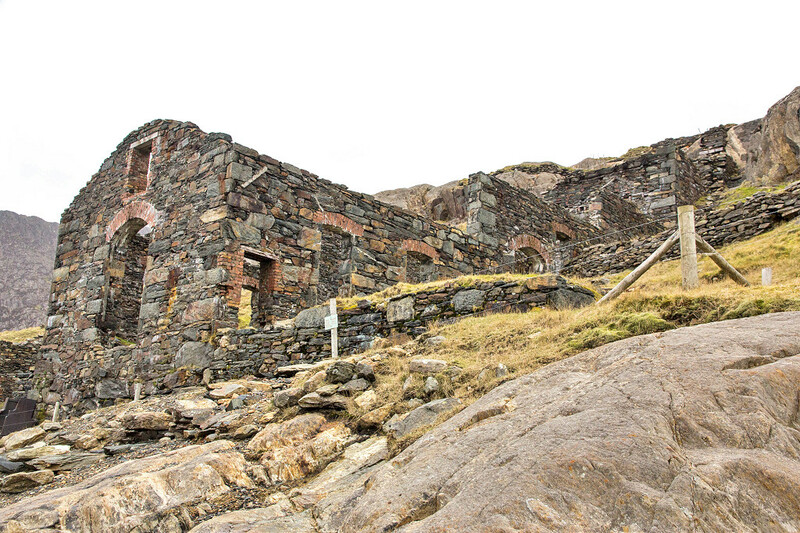 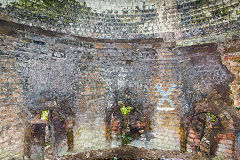 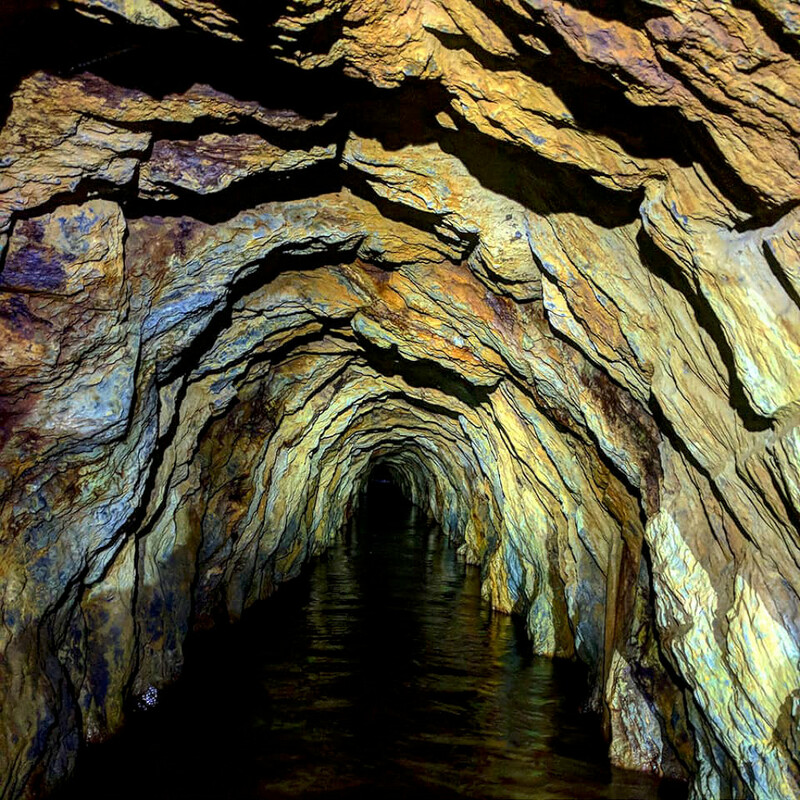 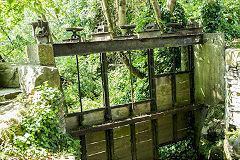 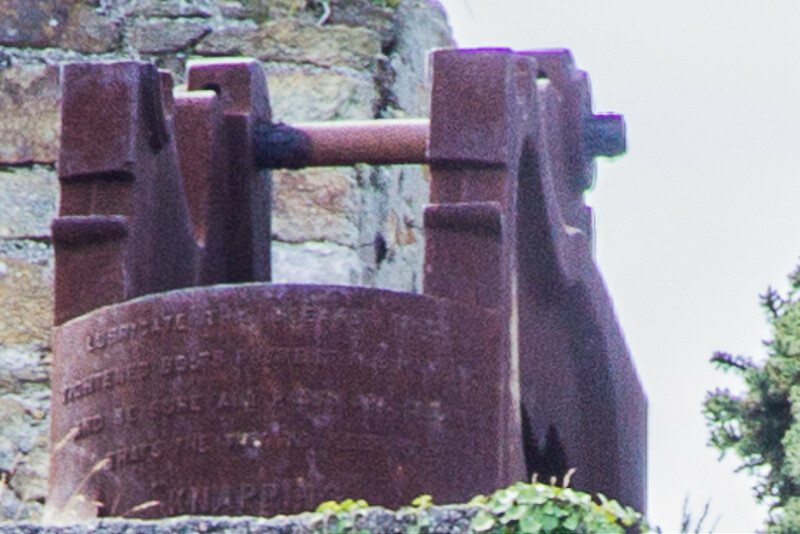 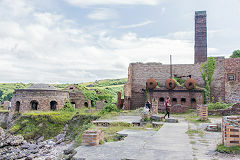 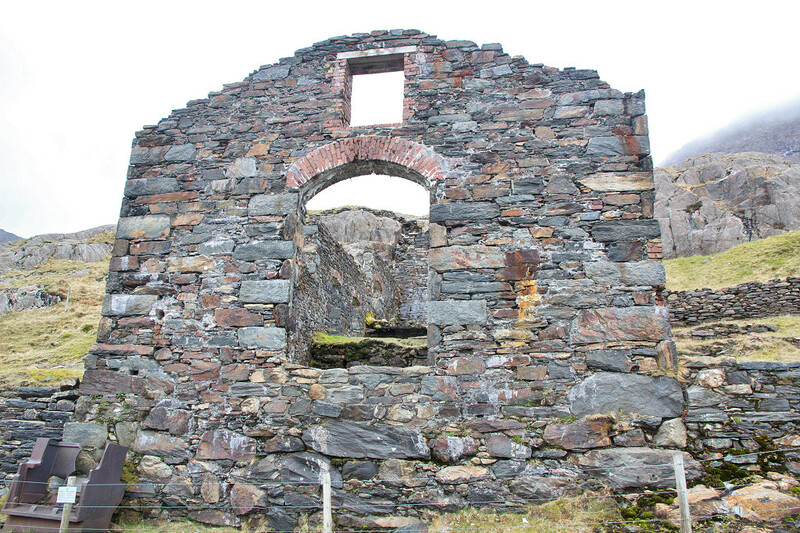 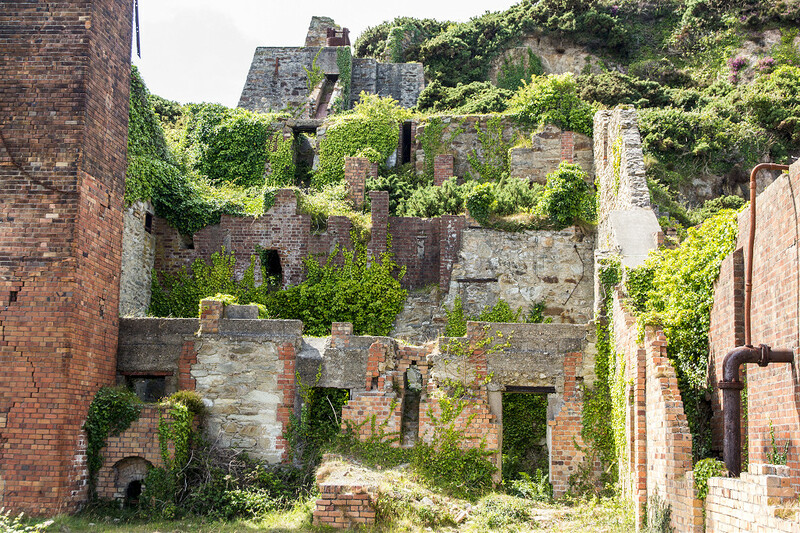 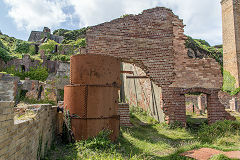 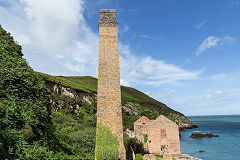 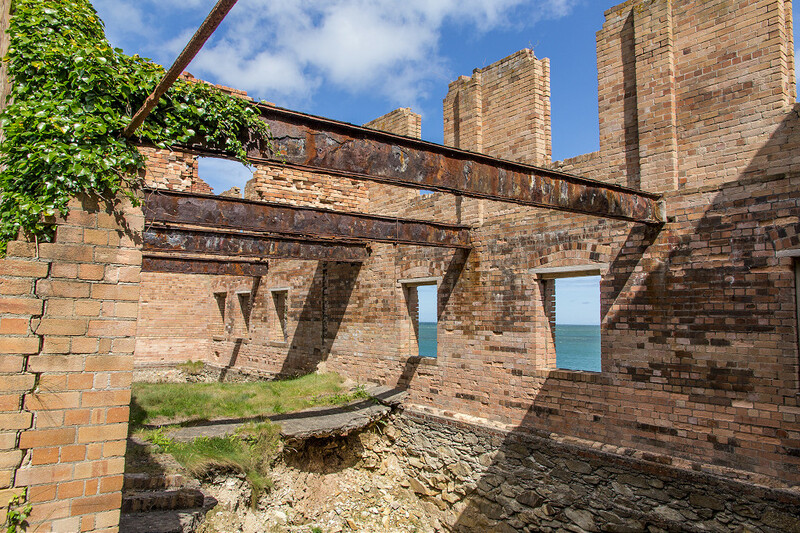 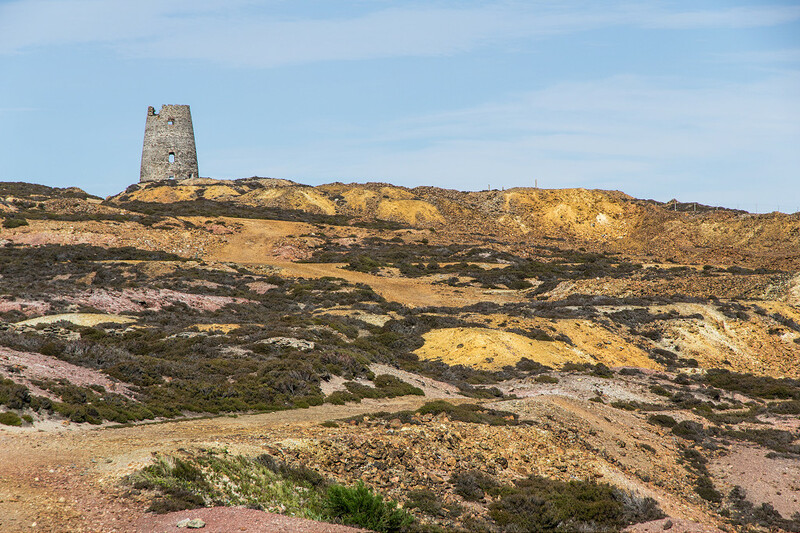 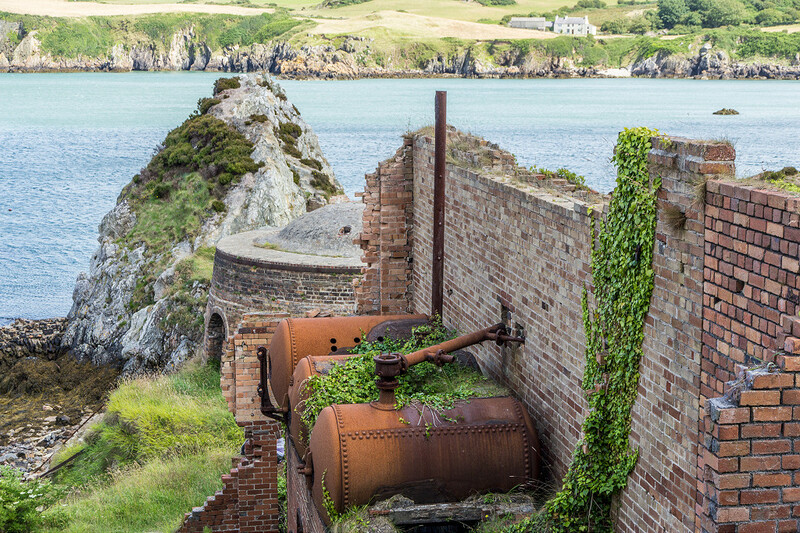 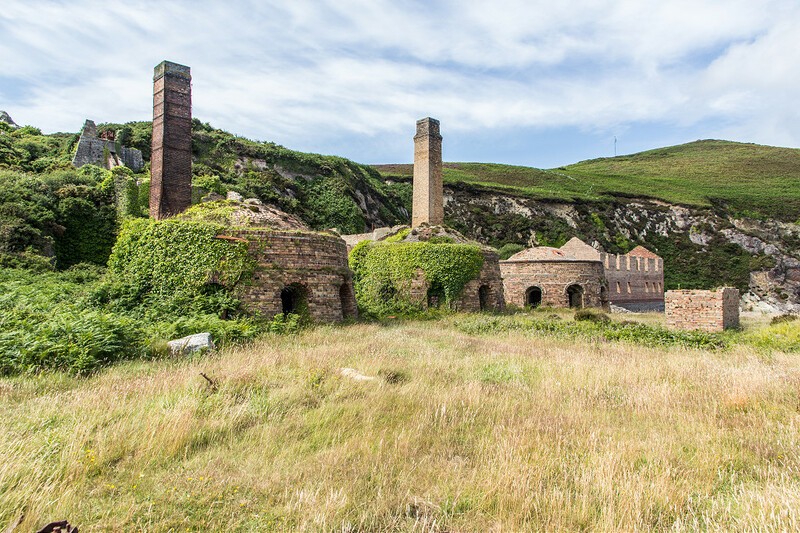 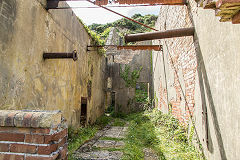 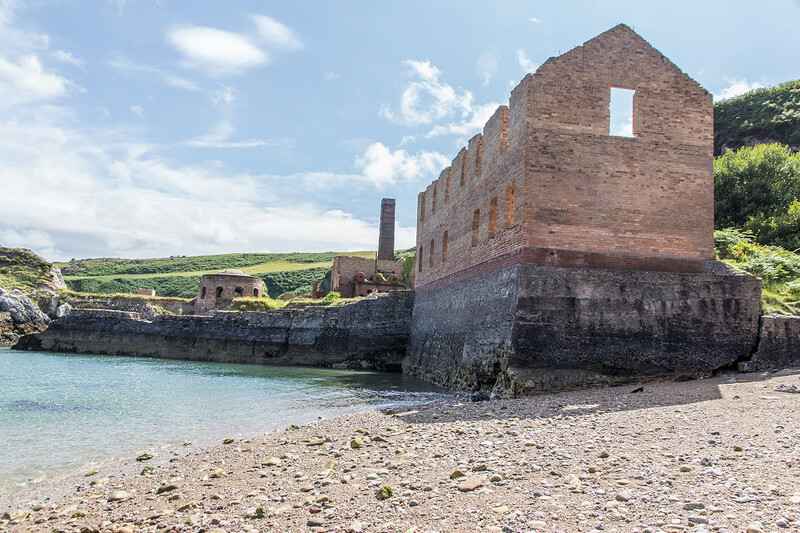 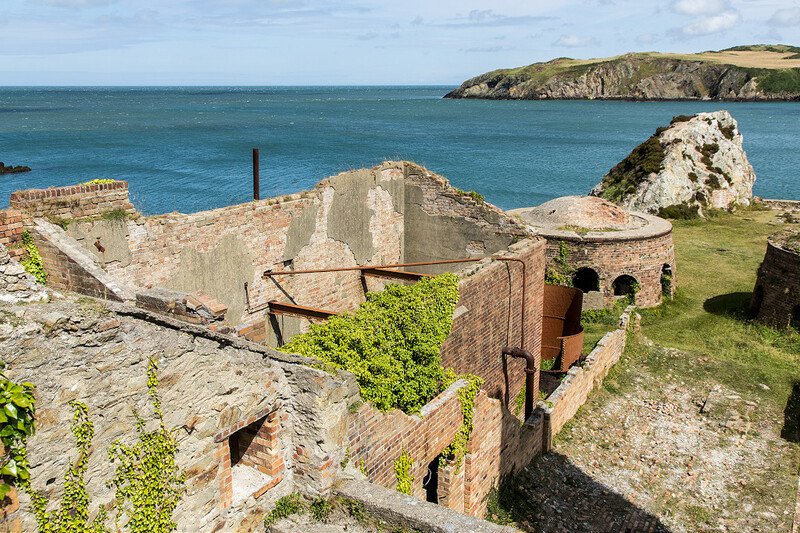 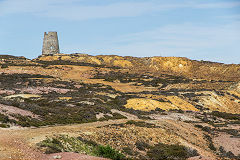 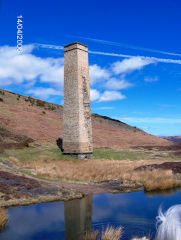 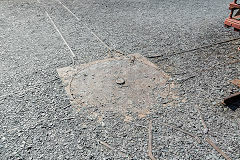 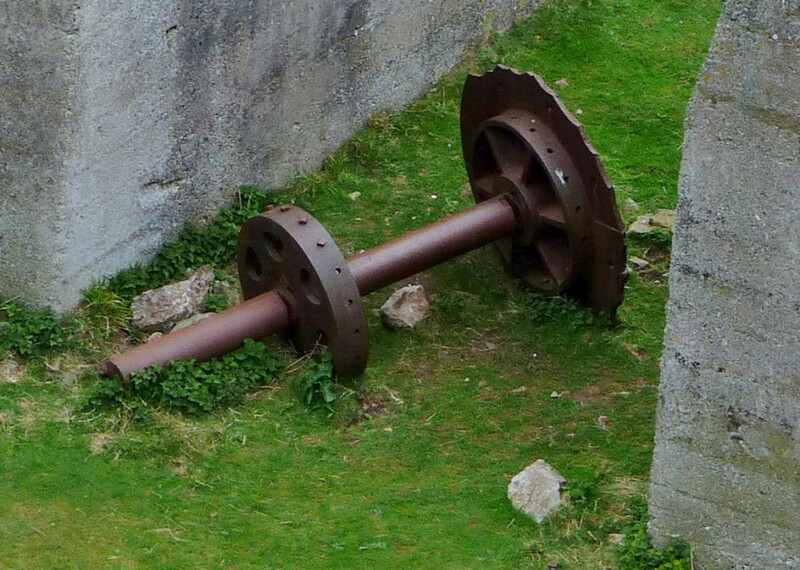 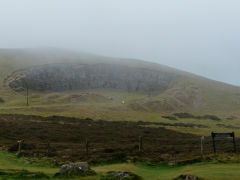 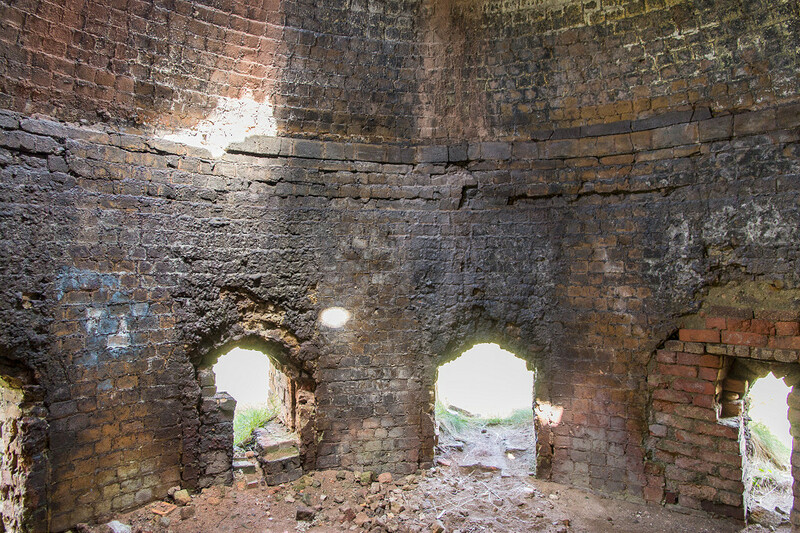 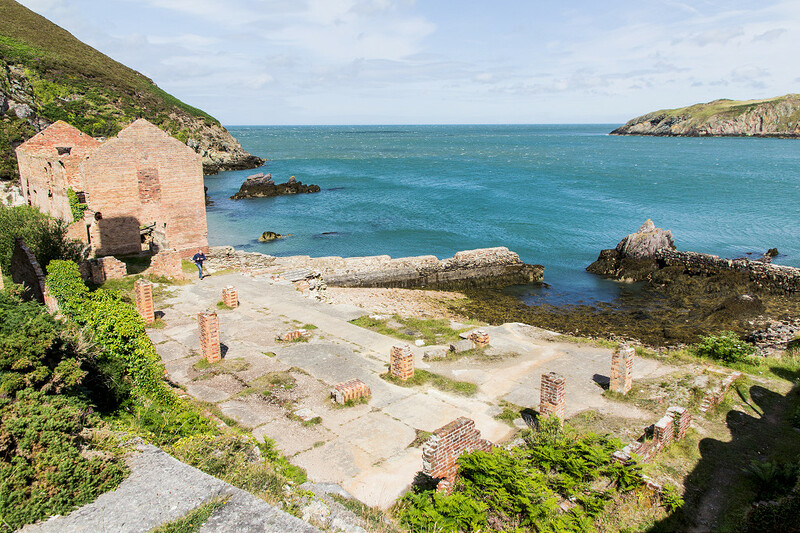 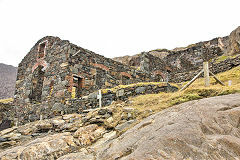 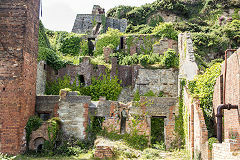 It was built c1925 for an attempted re-working of the mine but it was unsuccessful, lasting only 4 years or so. 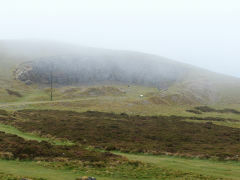 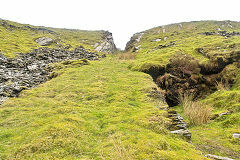 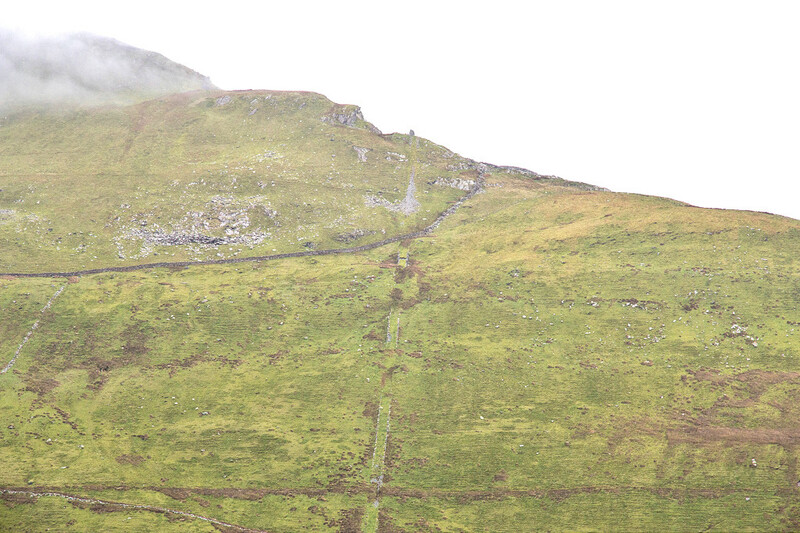 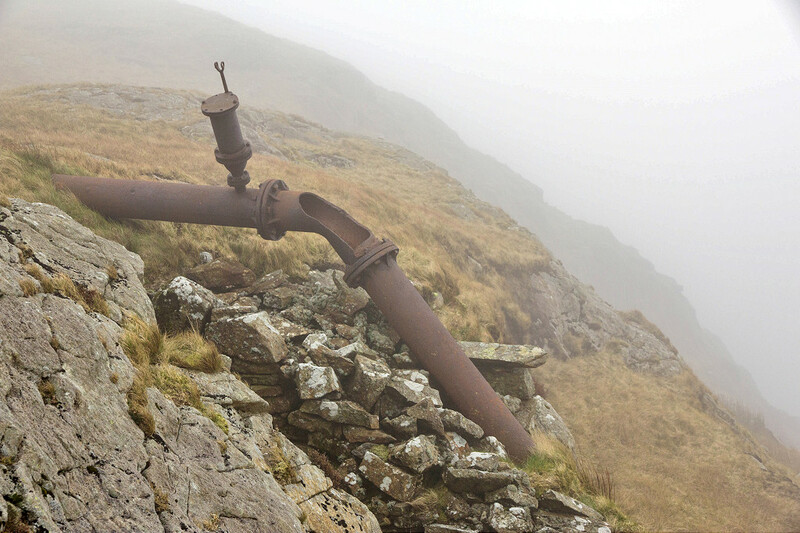 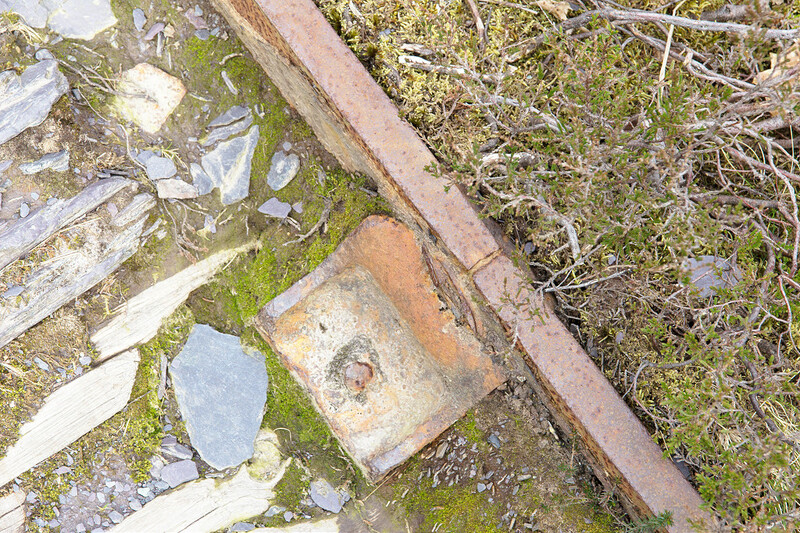 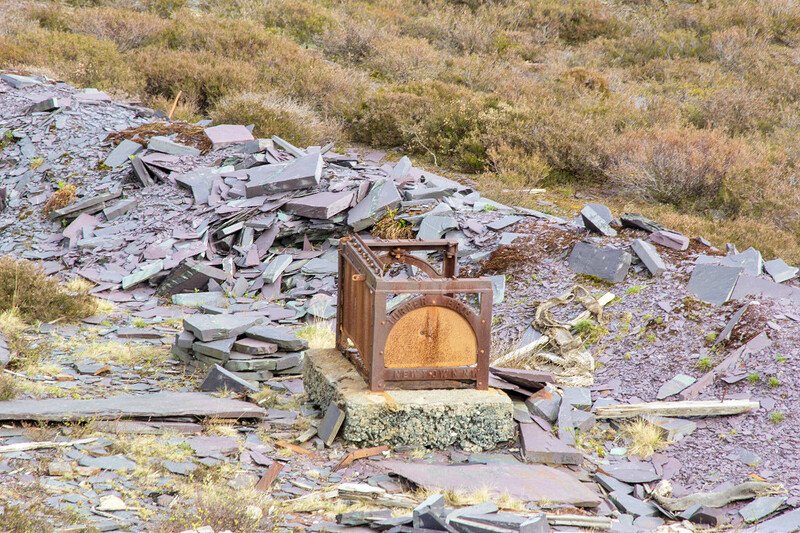 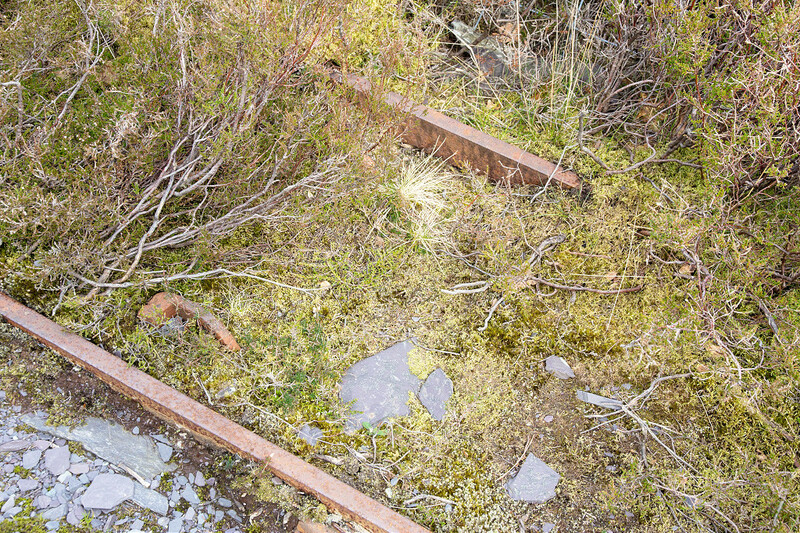 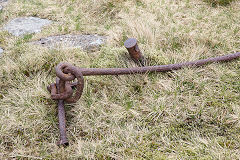 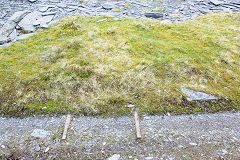 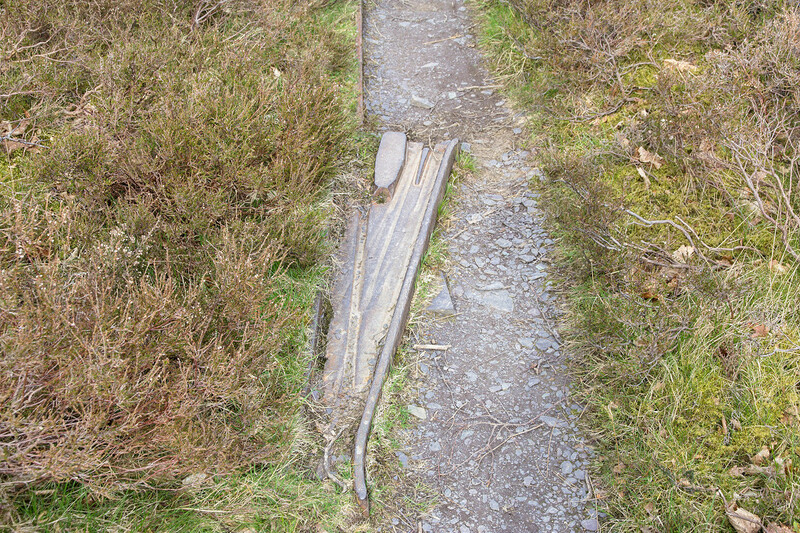 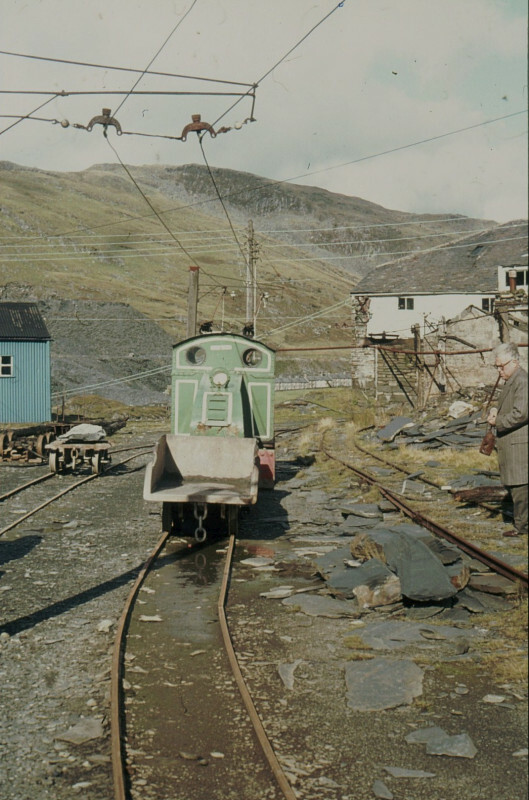 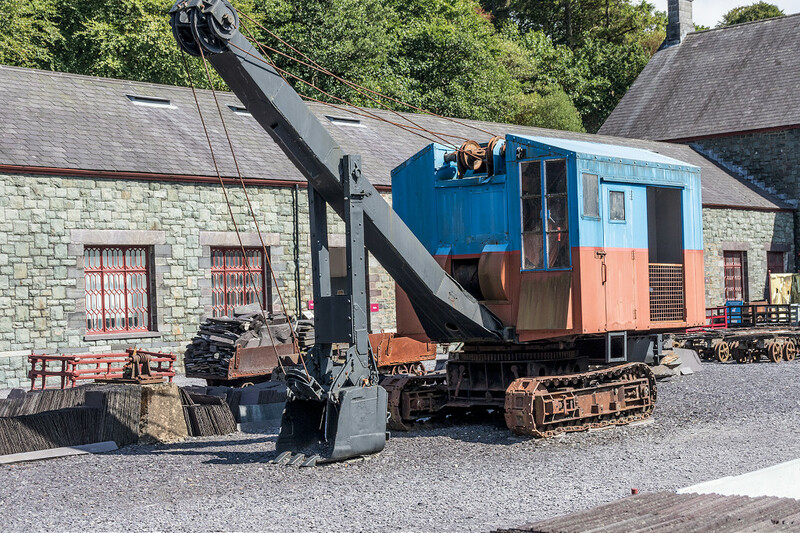 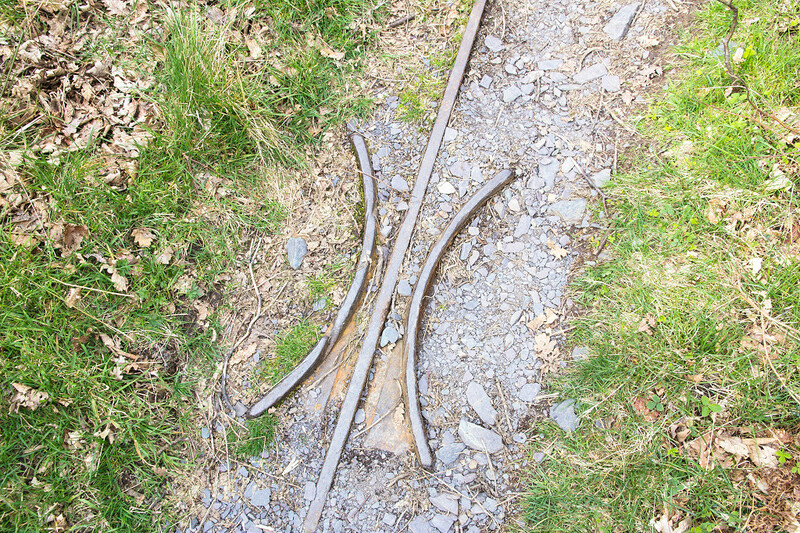 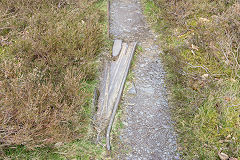 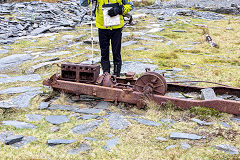 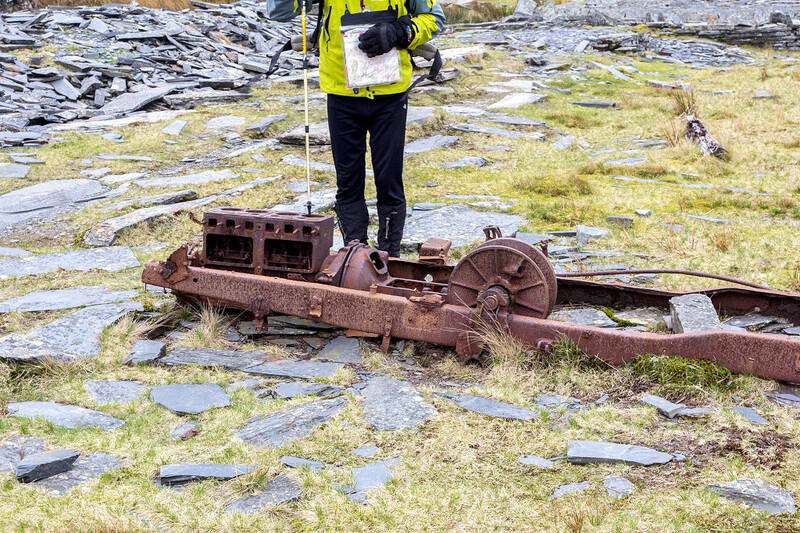 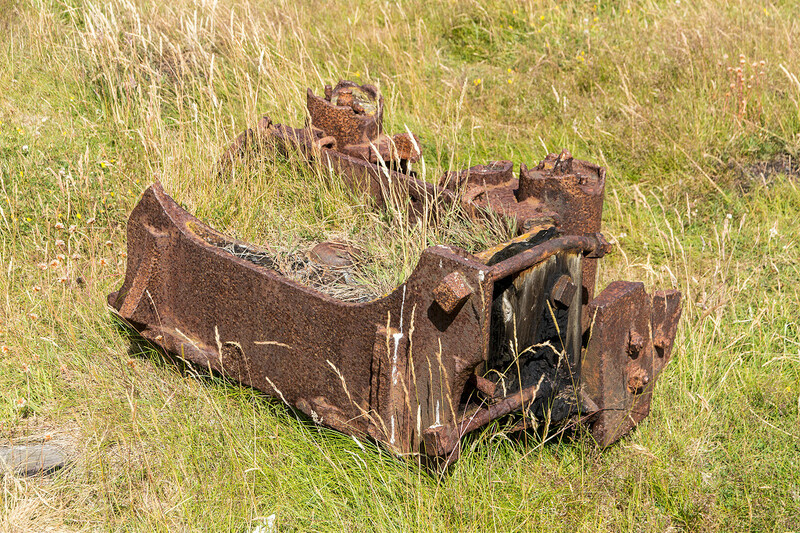 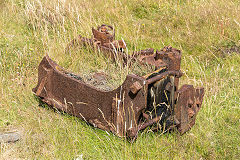 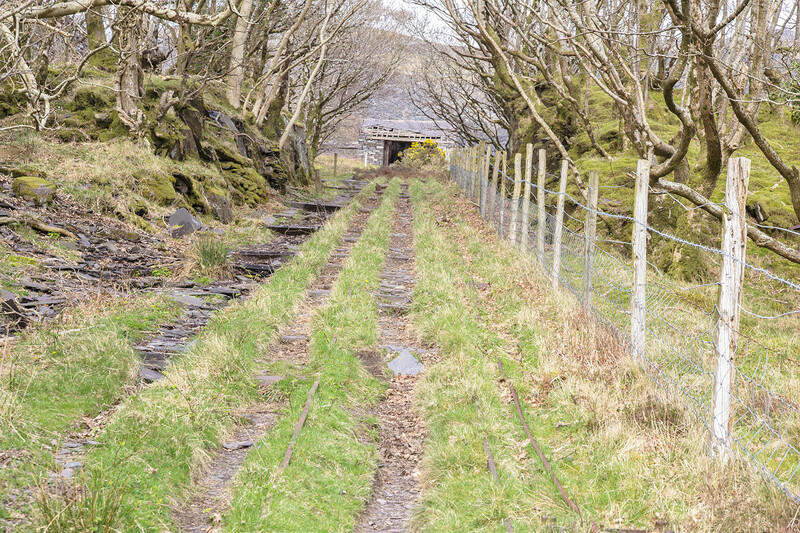 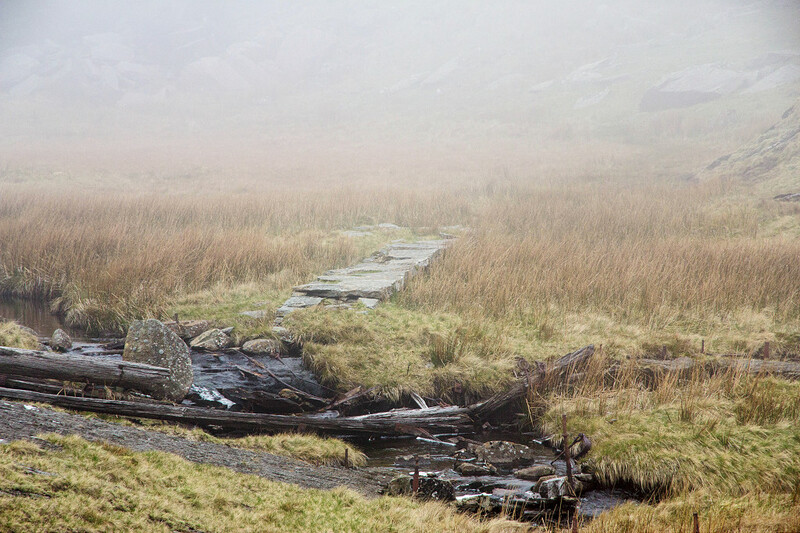 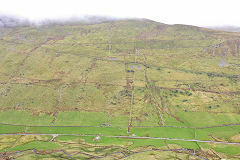 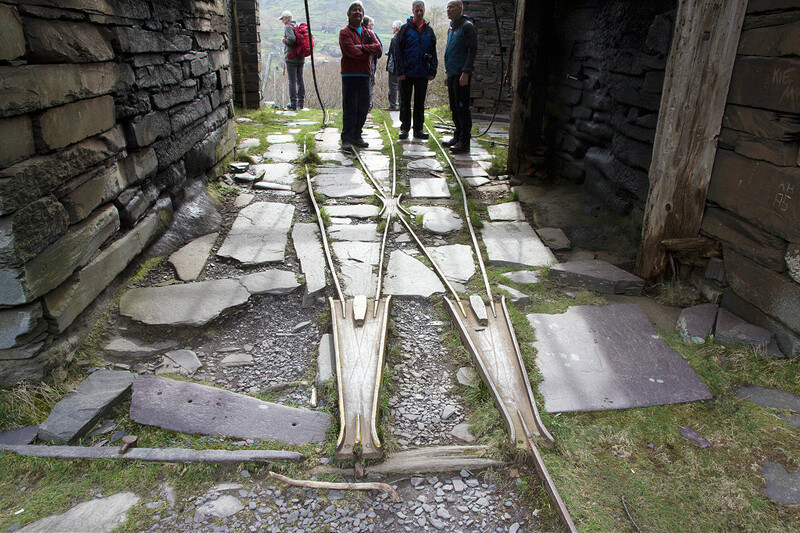 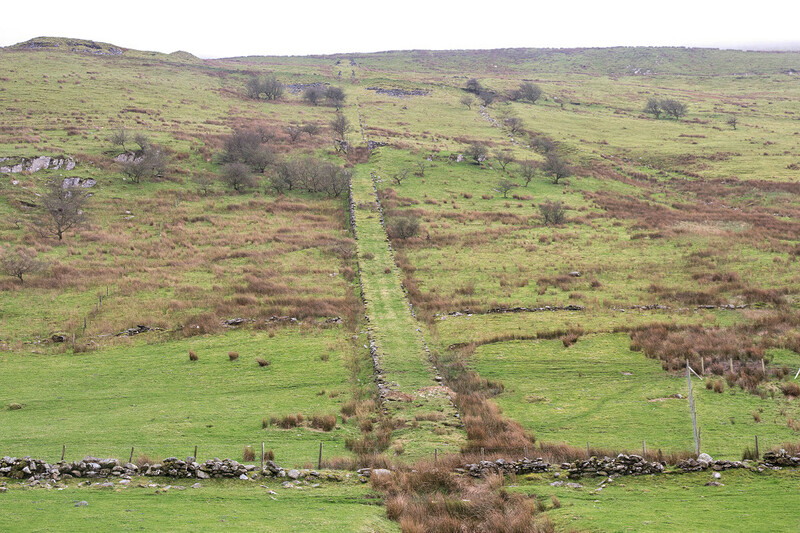 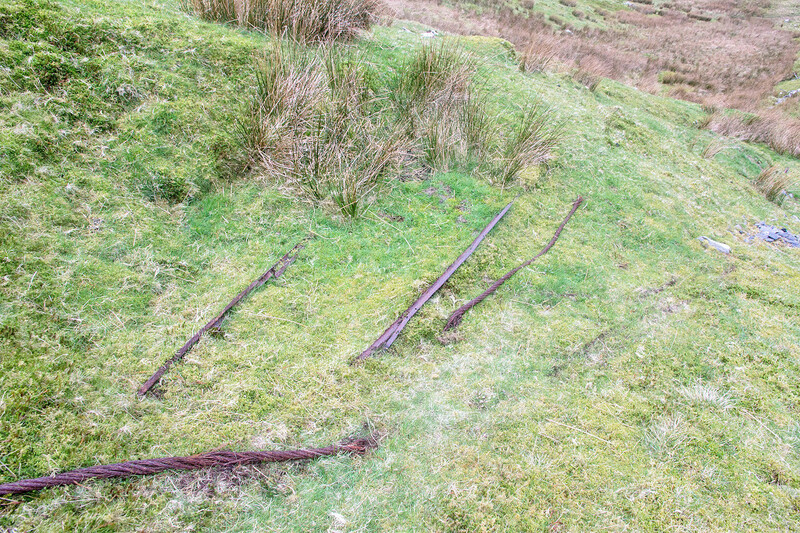 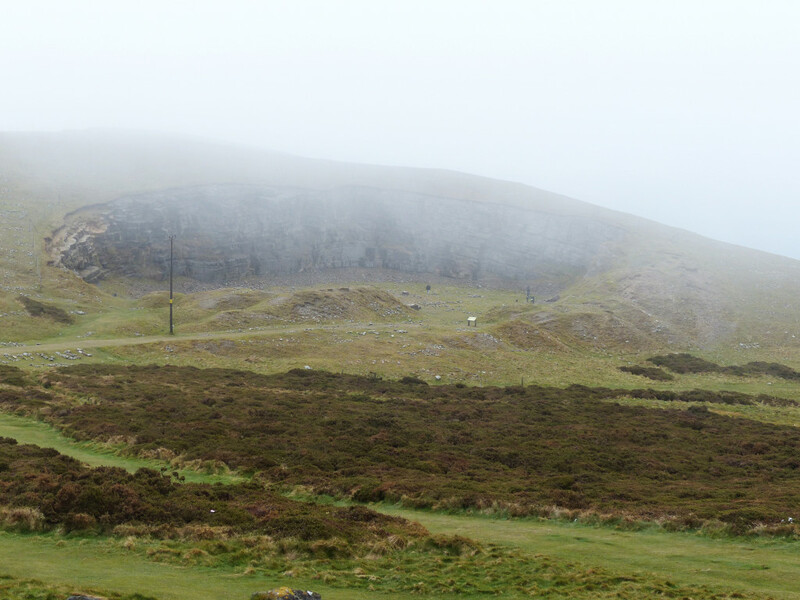 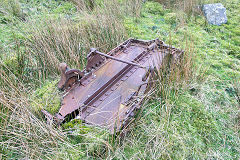 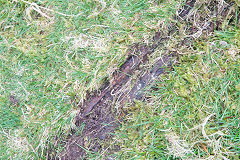 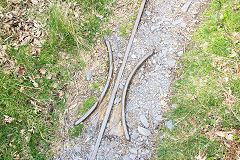 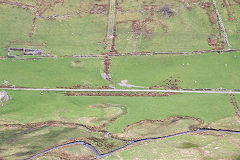 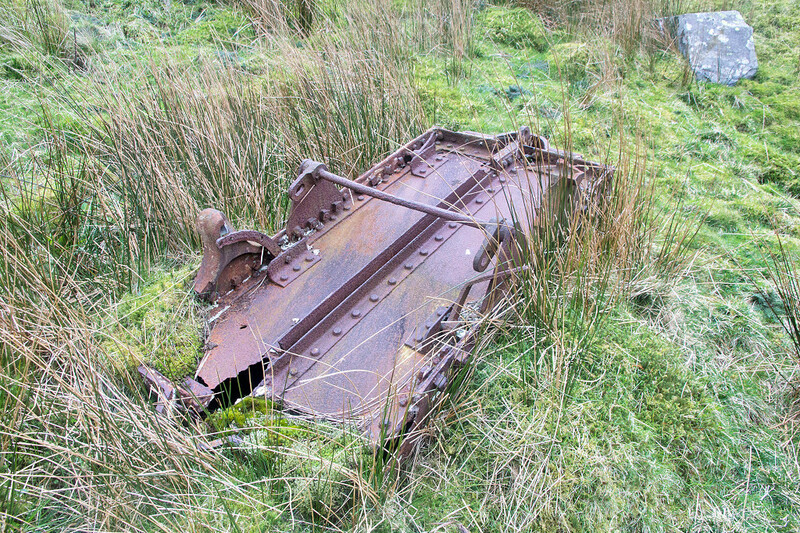 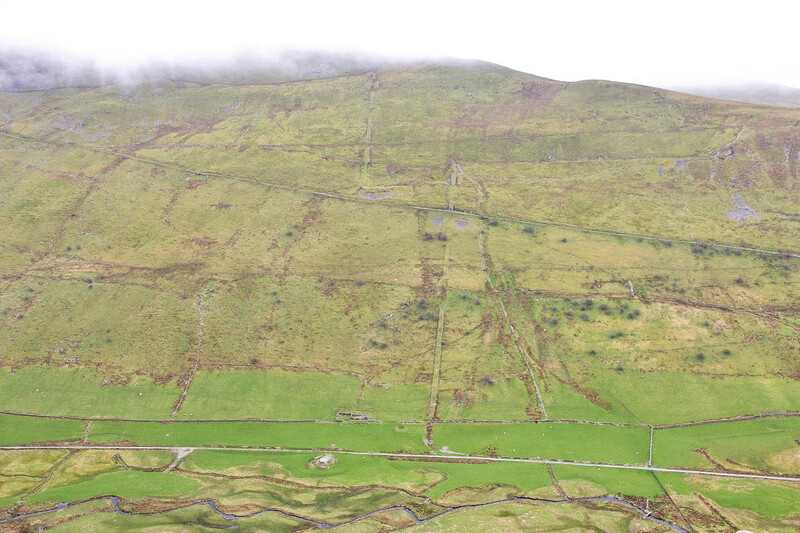 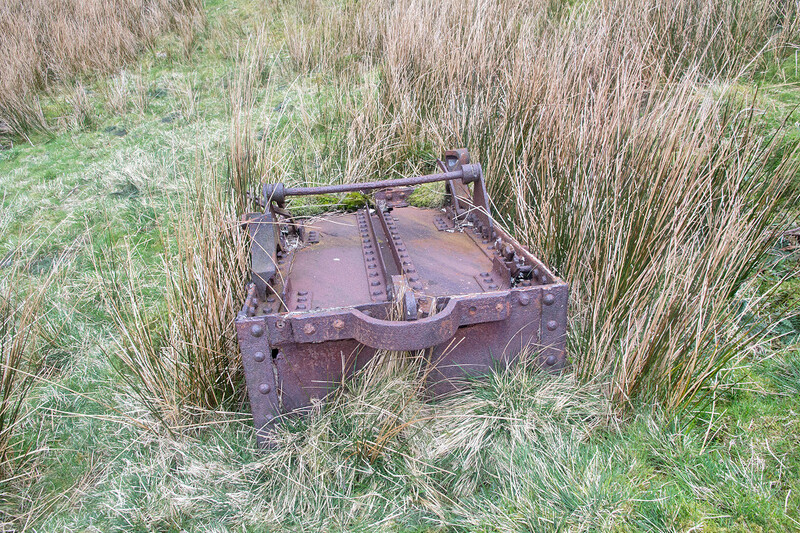 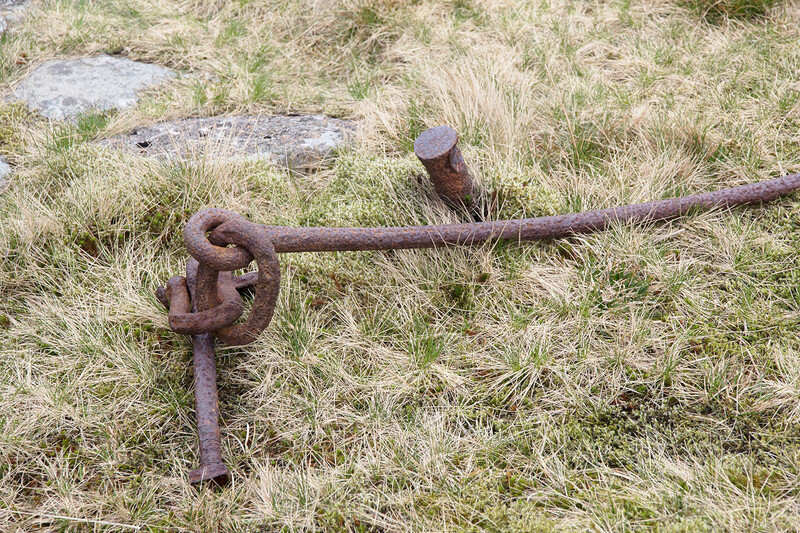 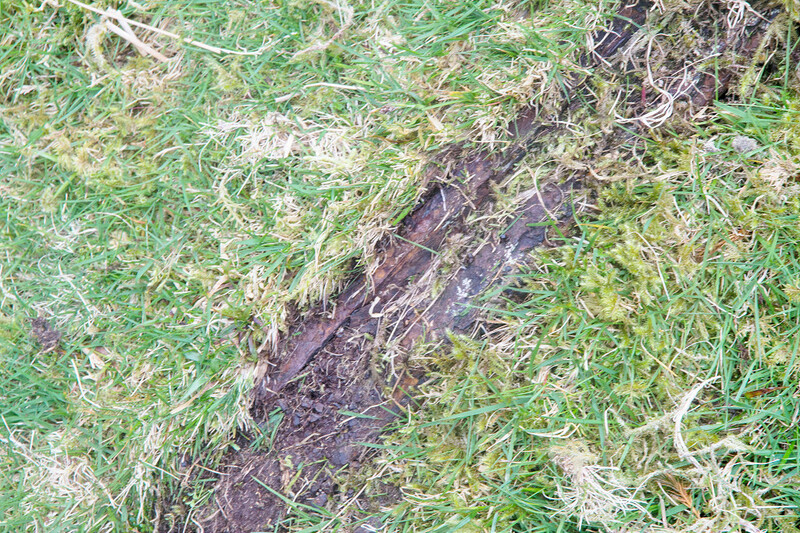 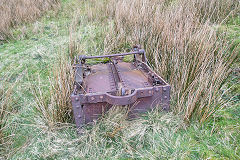 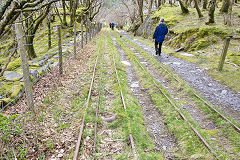 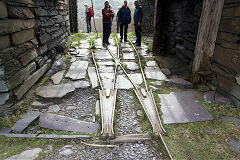 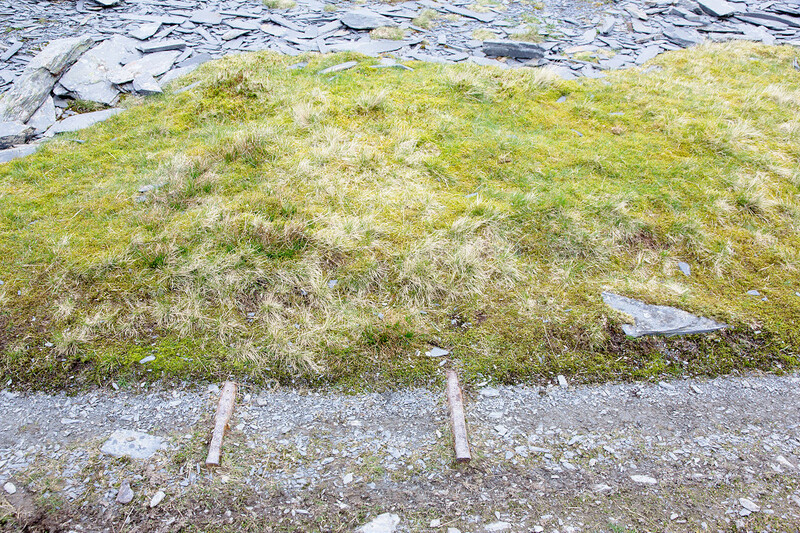 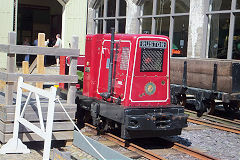 The Croesor Tramway opened in 1864 and died a slow death that lingered on into the 1950s. 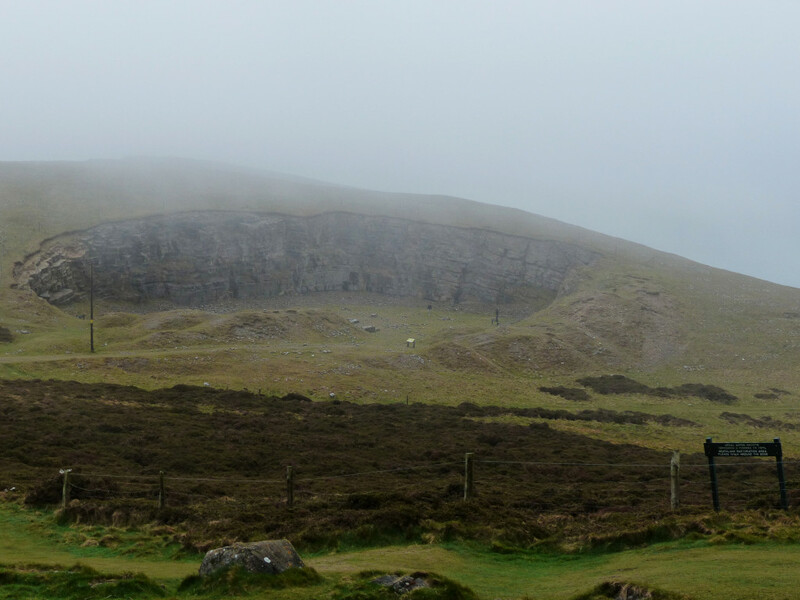 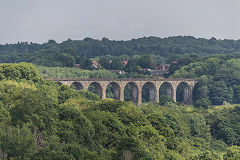 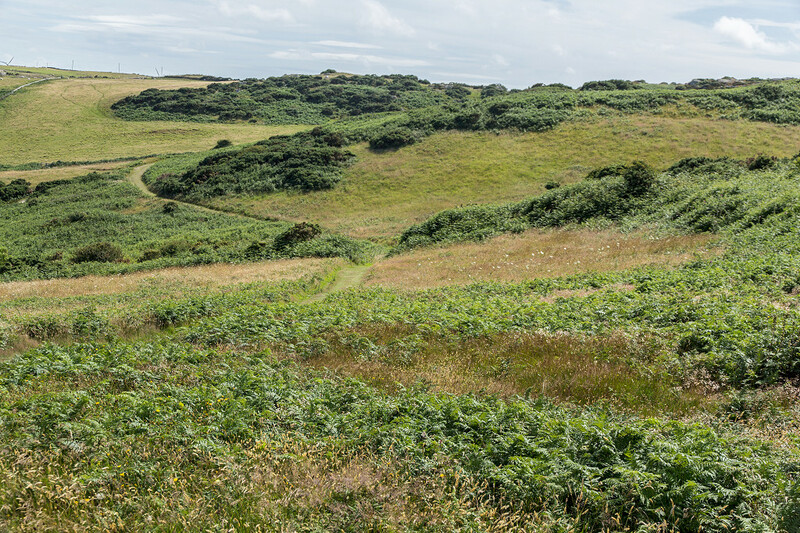 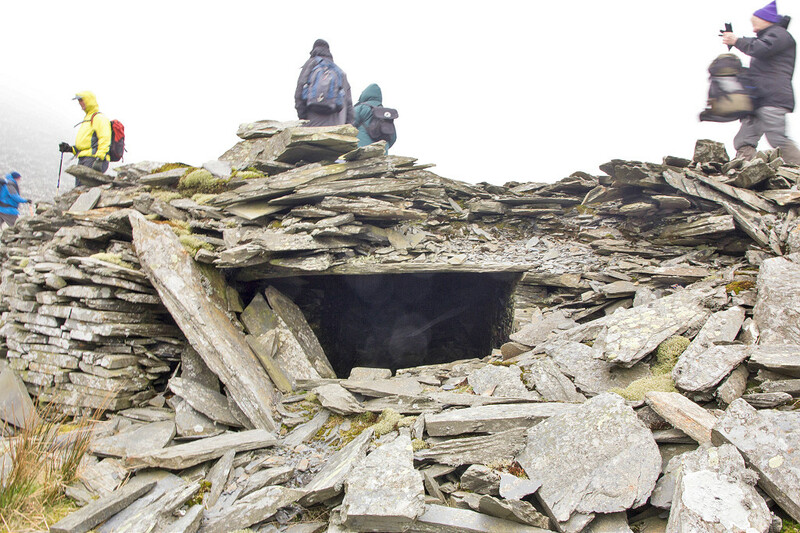 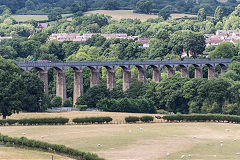 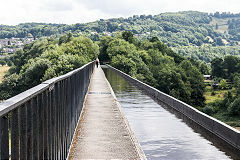 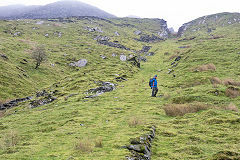 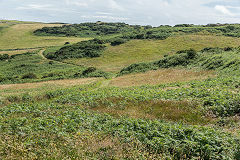 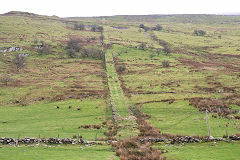 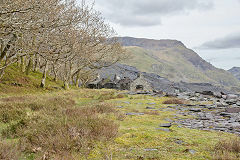 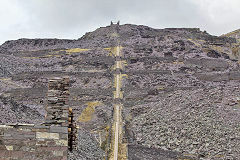 It served quarries on the ridges either side, Croesor, Rhosydd and Pantmawr using long, steep inclines and a tunnel to Fron-boeth. 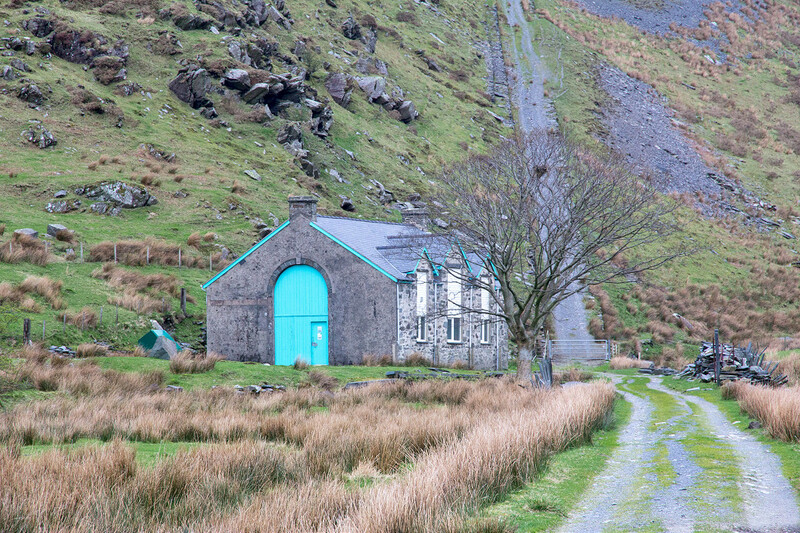 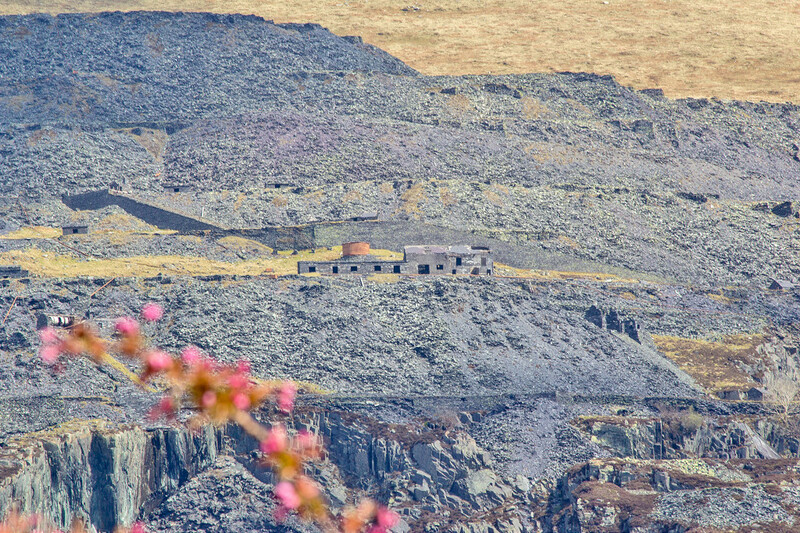 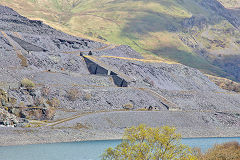 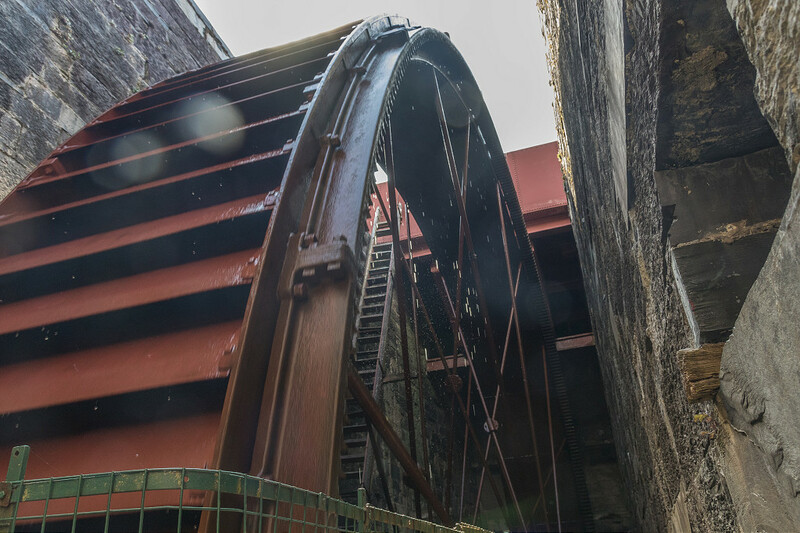 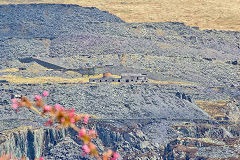 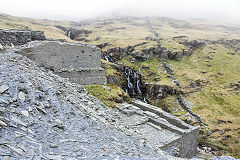 Blaencwm hydro-electric power station was built in 1904 to provide power to Croesor quarry. 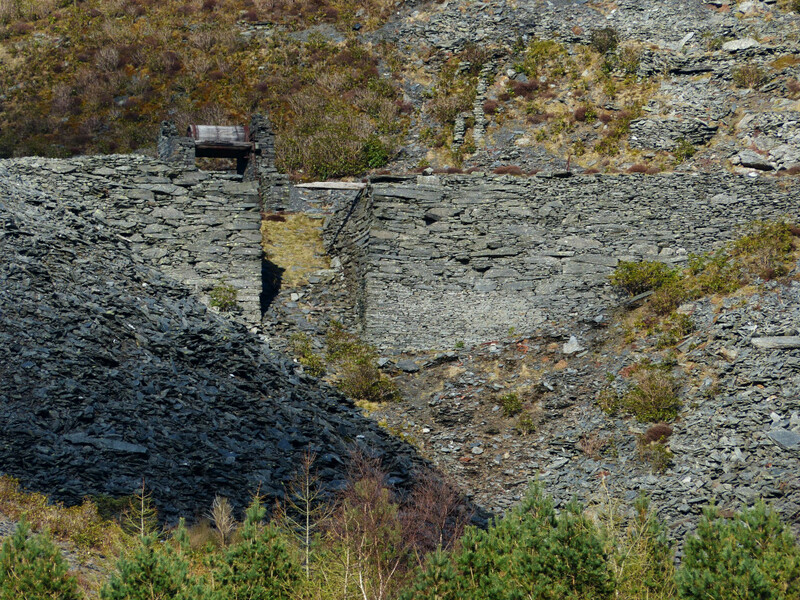 Pantmawr Quarry opened in 1864, the connection to the Croesor Tramway opened in 1879 via the two-stage incline and the quarry was disused from 1913. 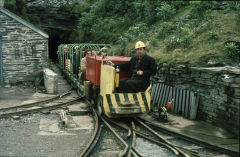 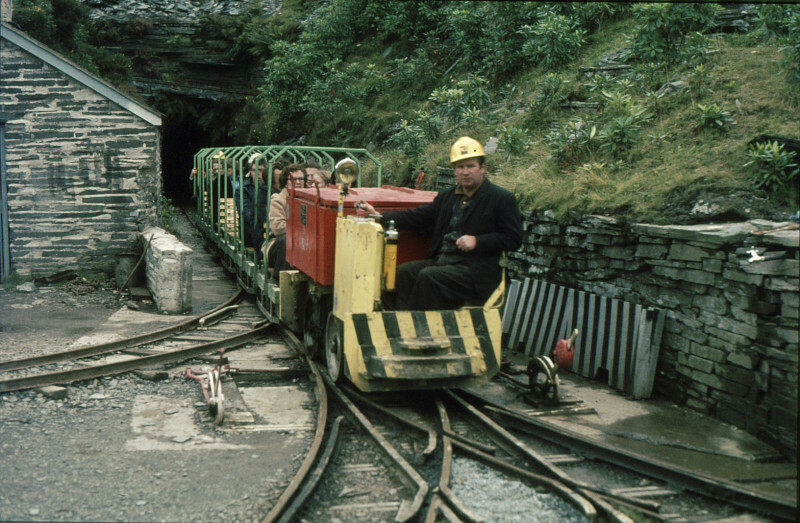 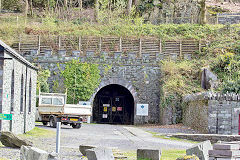 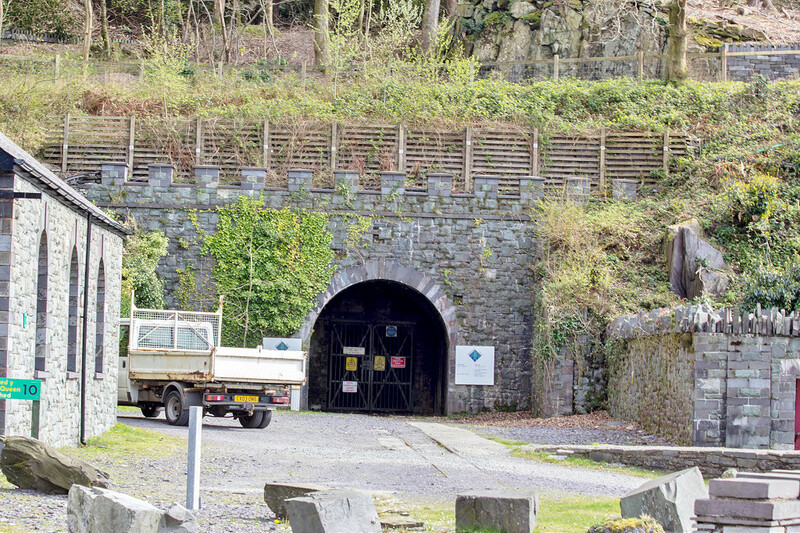 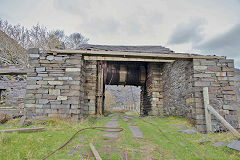 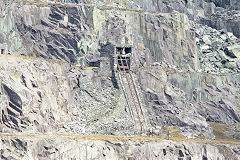 The extension to Fron-Boeth Quarry was built in 1889 via the tunnel, one of the few in North Wales on a tramway 'mainline'. 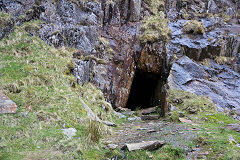 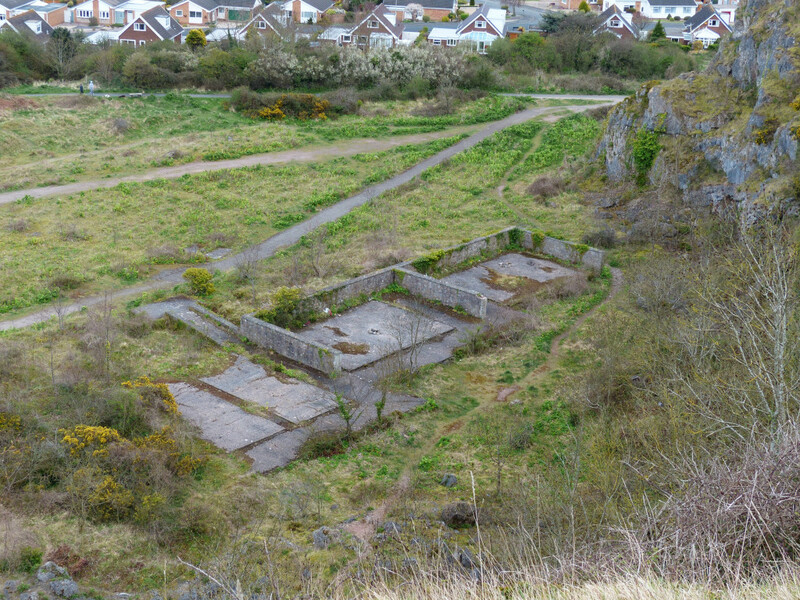 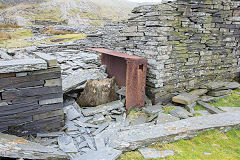 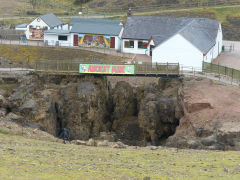 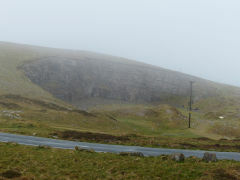 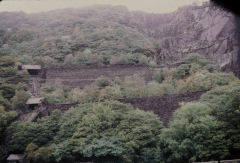 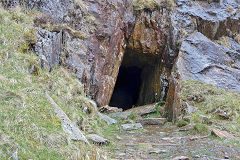 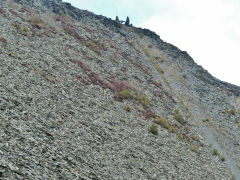 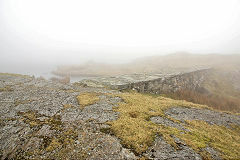 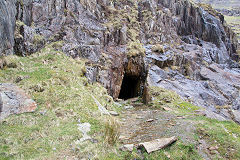 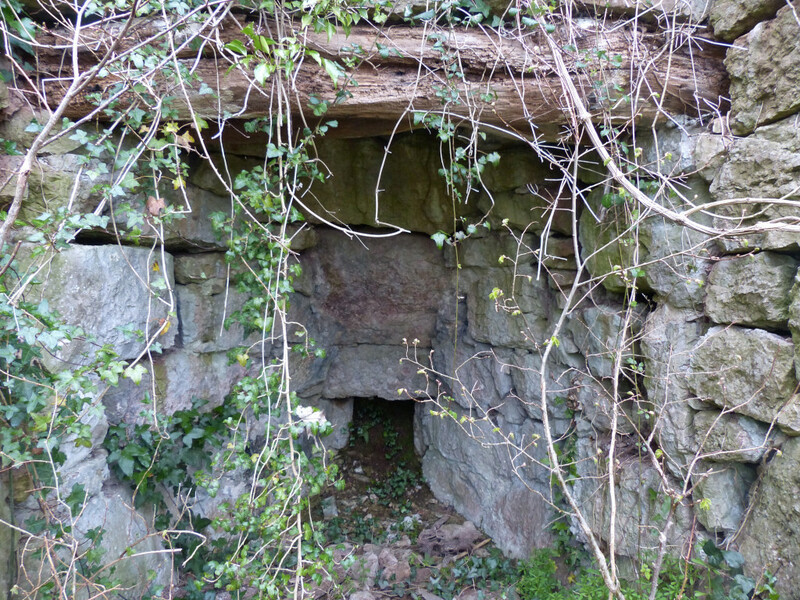 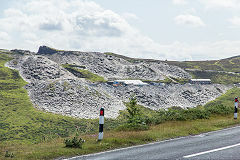 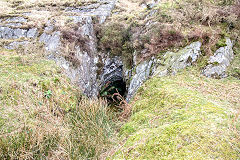 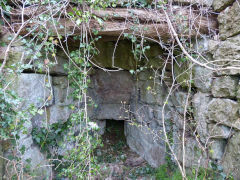 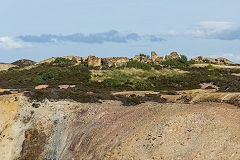 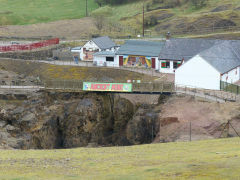 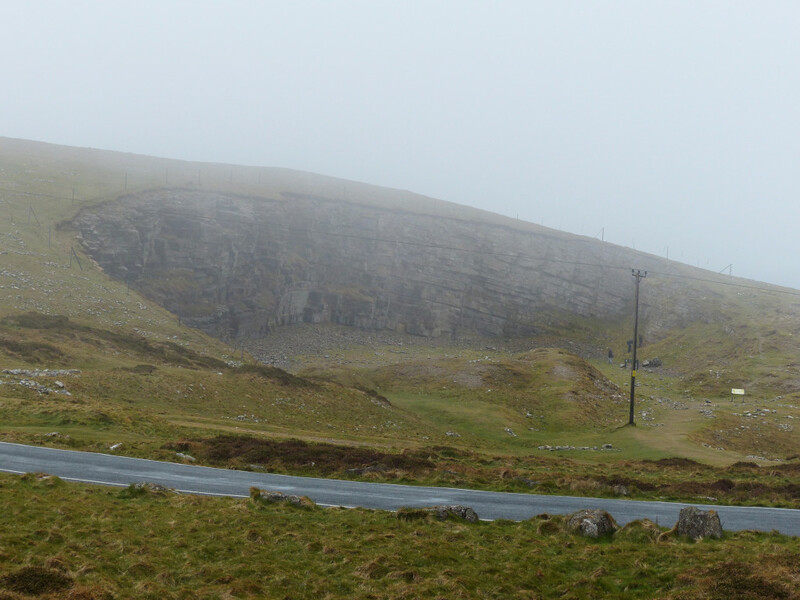 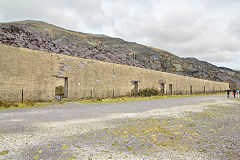 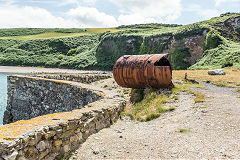 Fron-Boeth Quarry had closed by 1908. 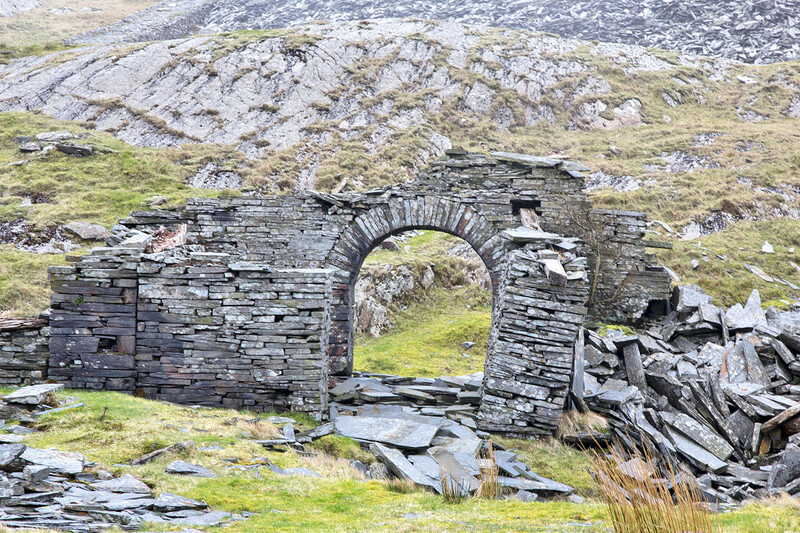 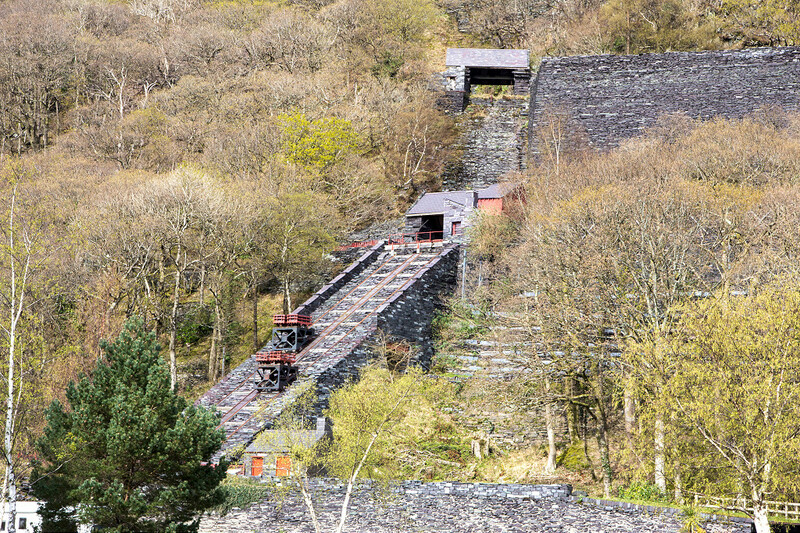 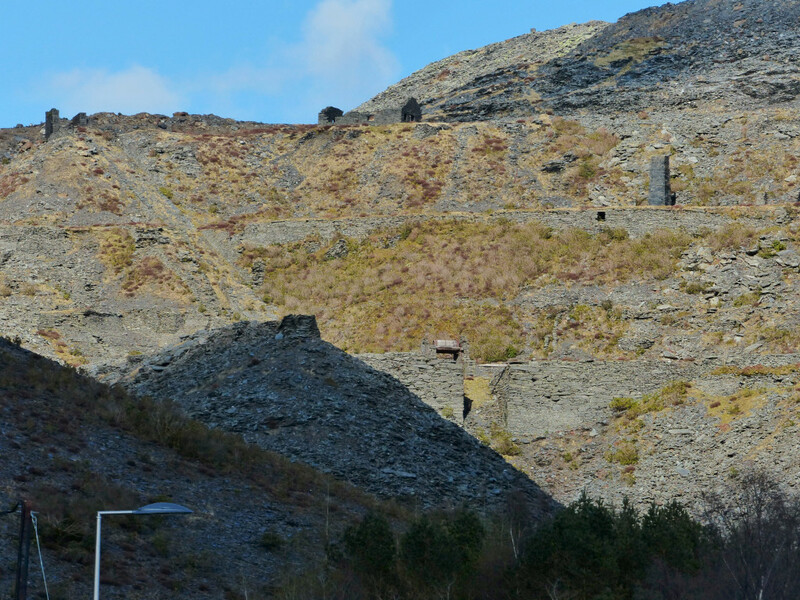 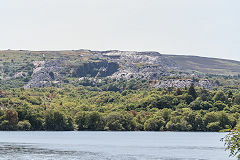 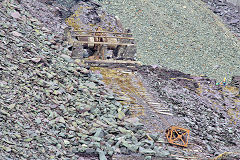 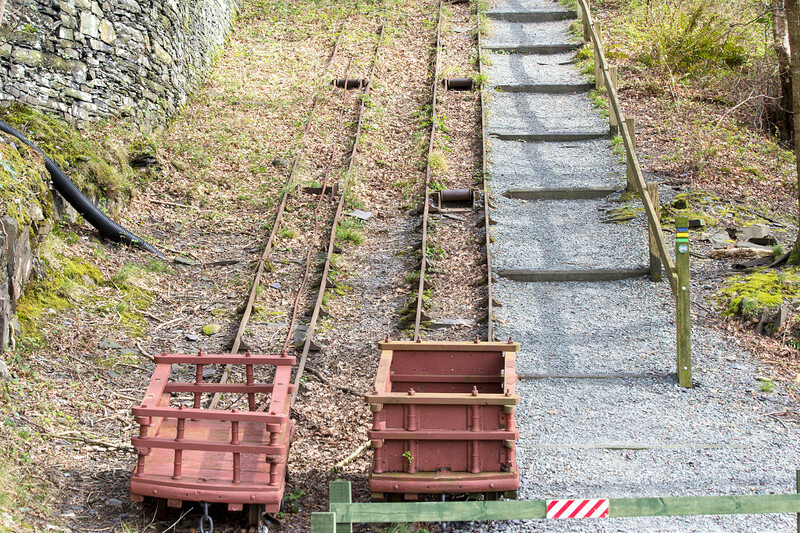 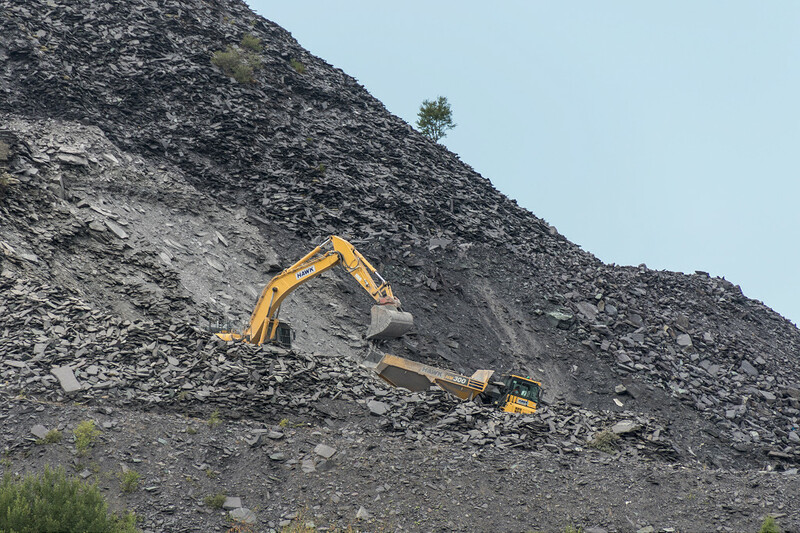 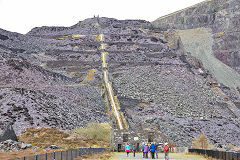 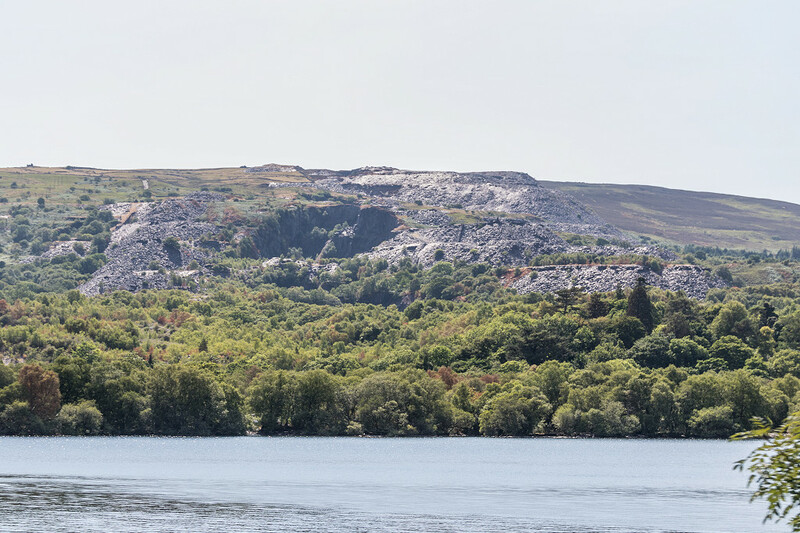 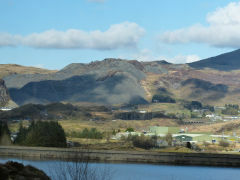 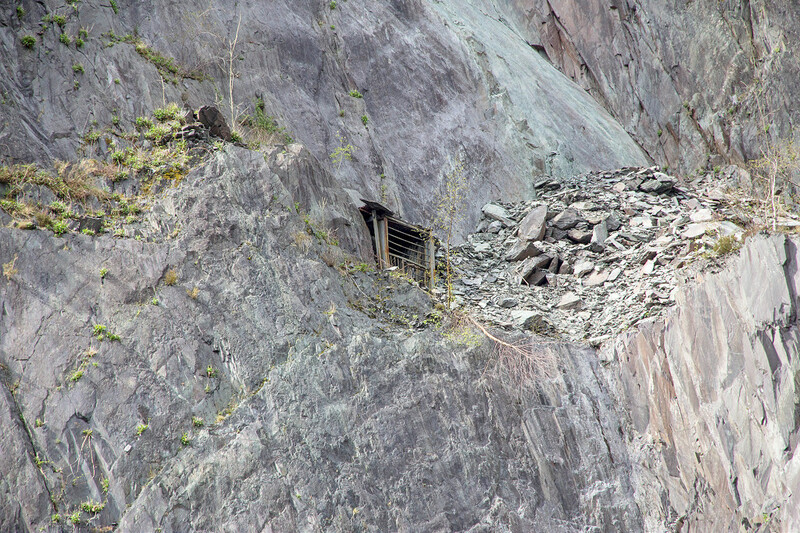 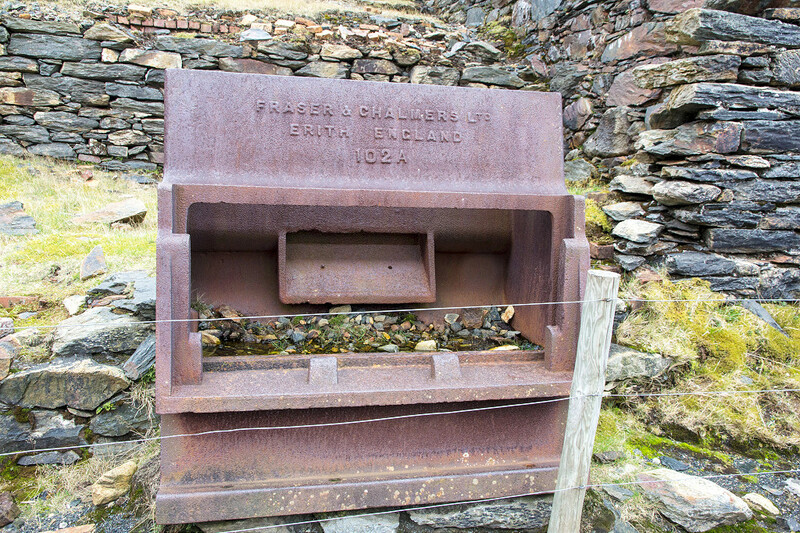 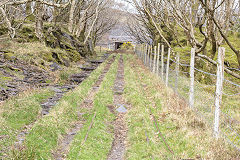 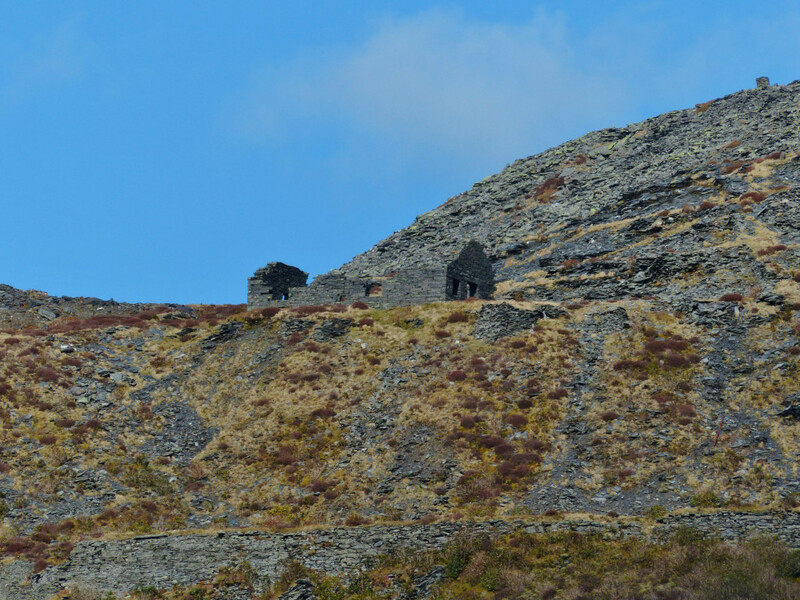 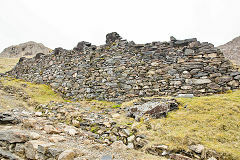 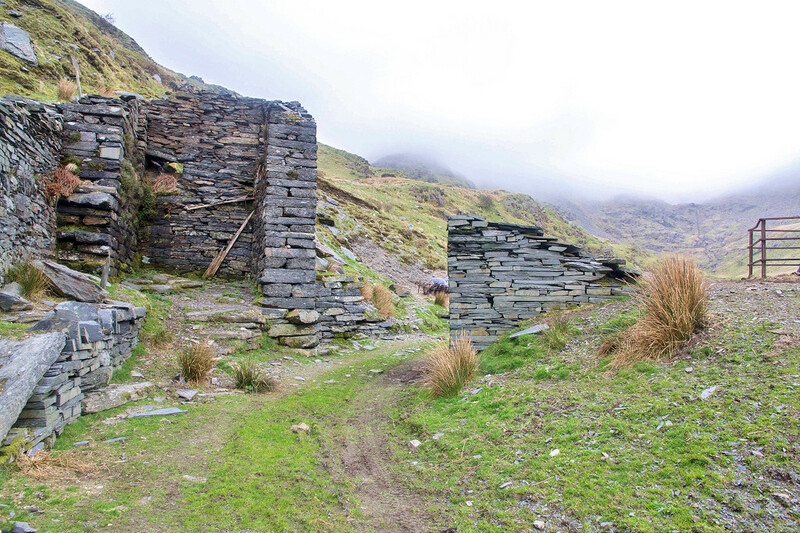 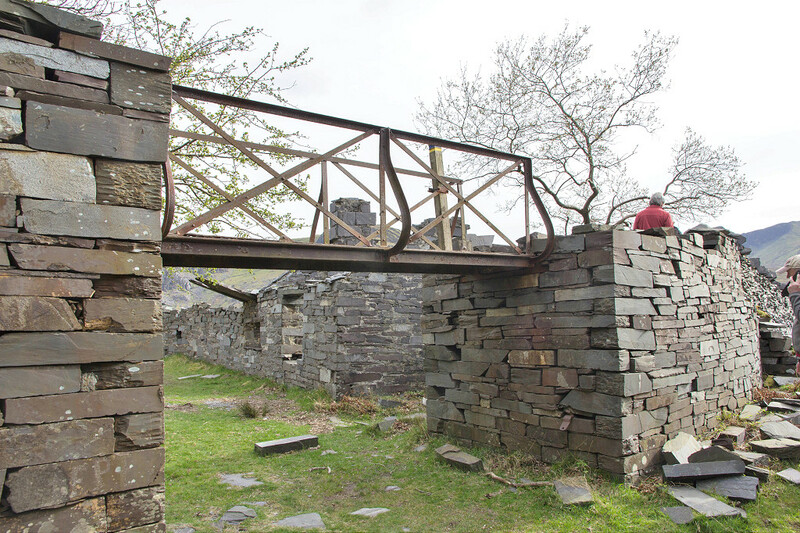 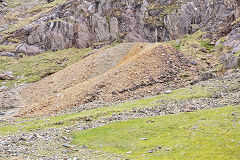 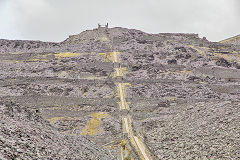 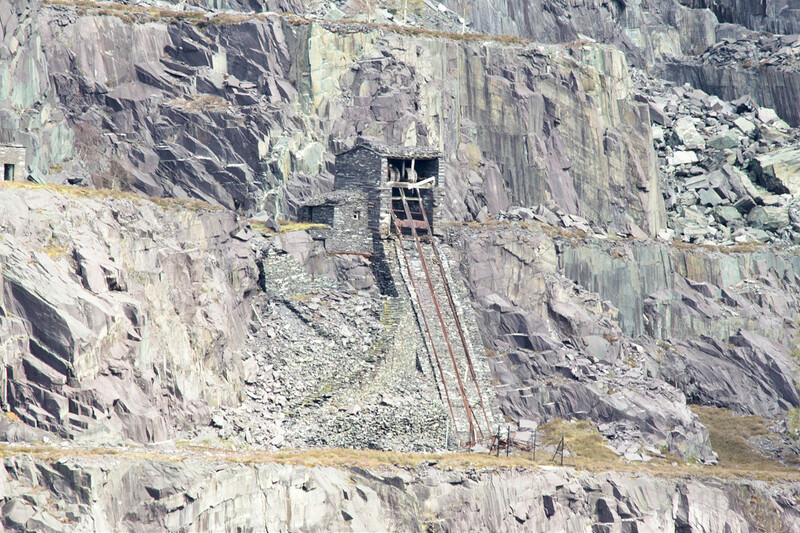 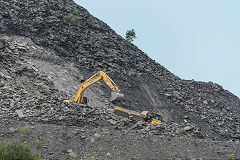 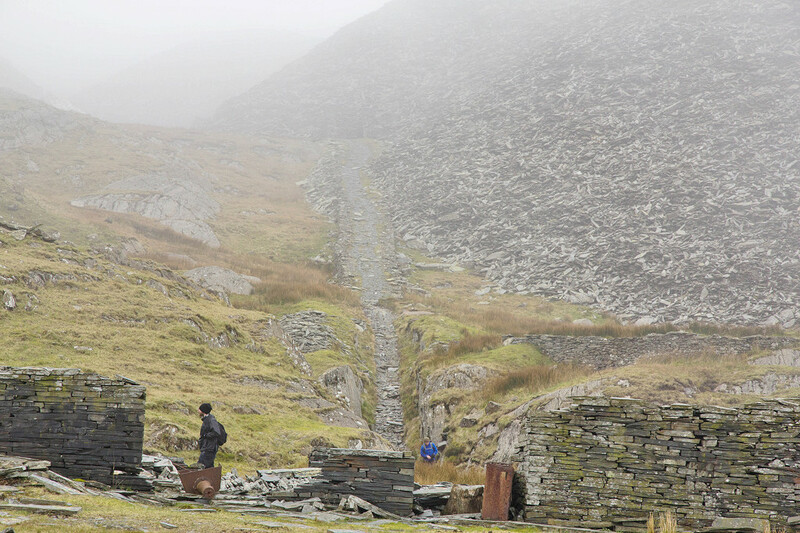 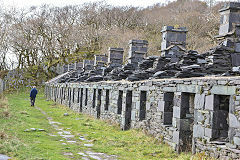 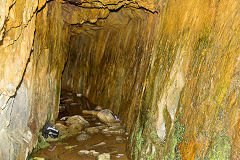 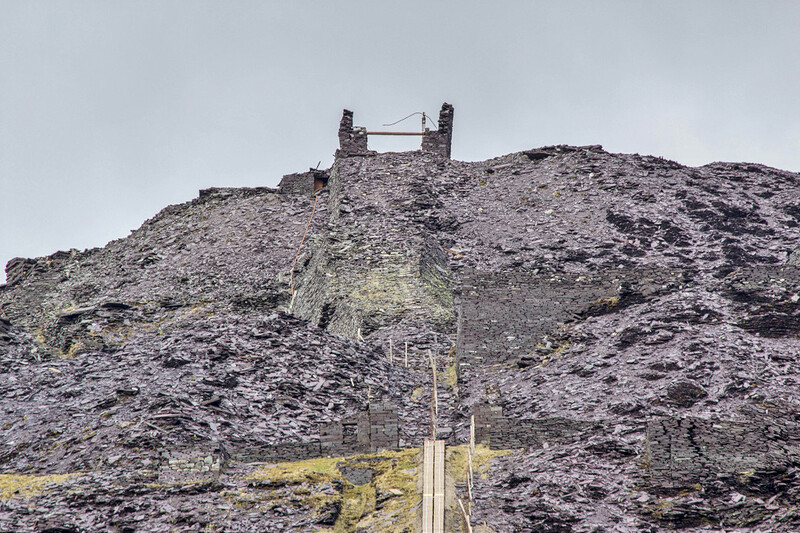 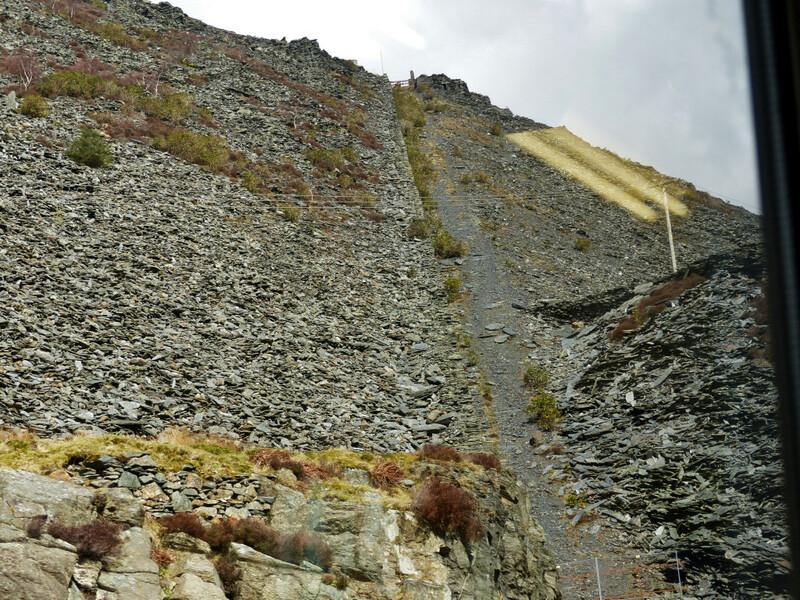 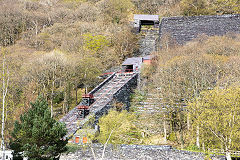 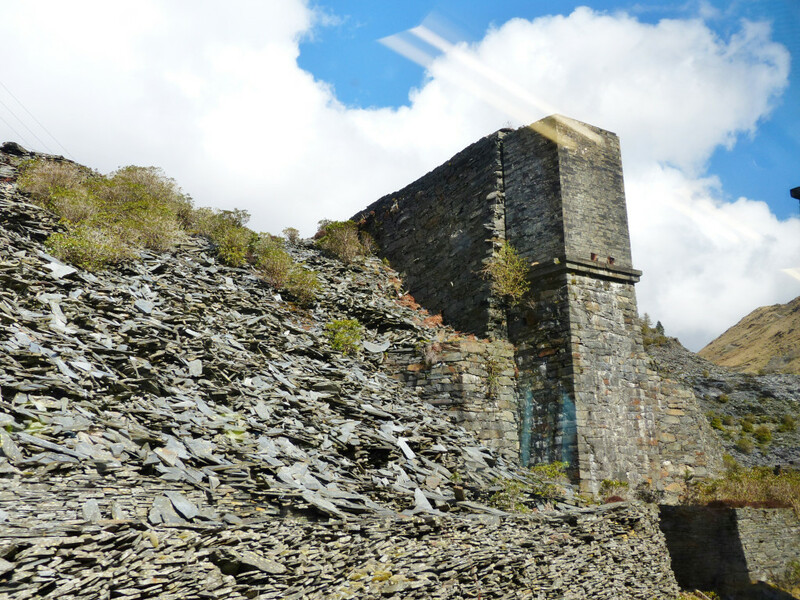 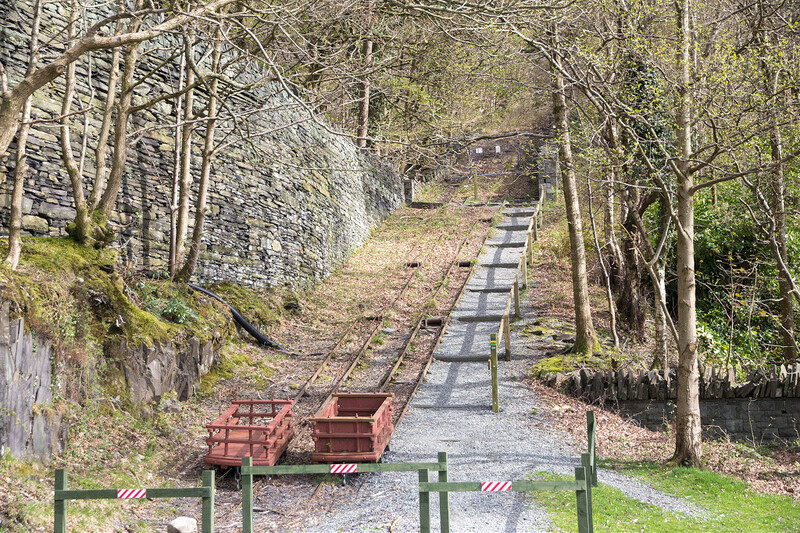 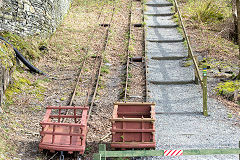 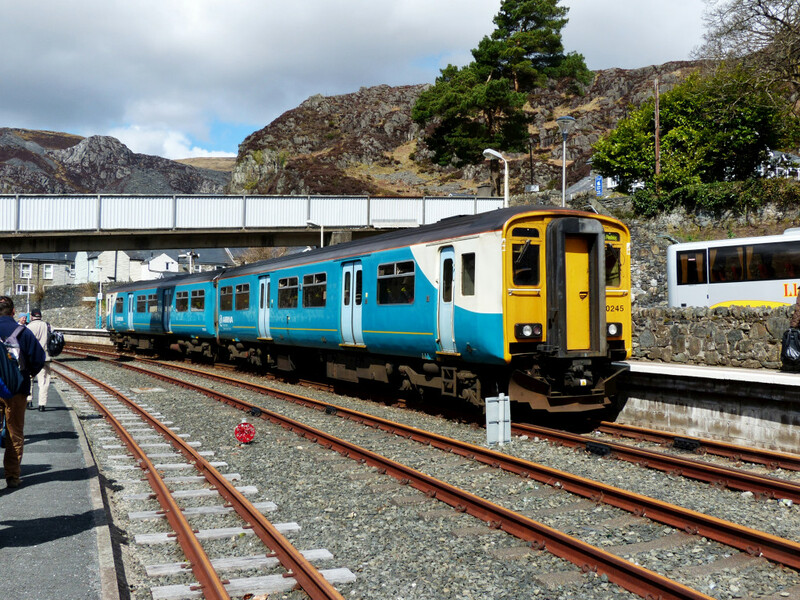 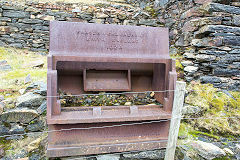 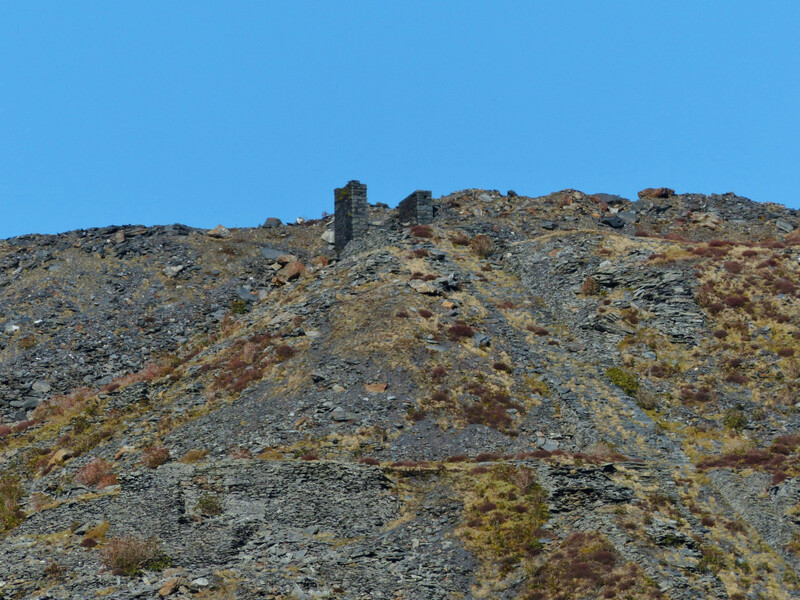 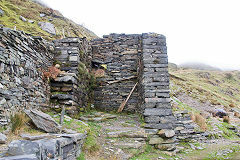 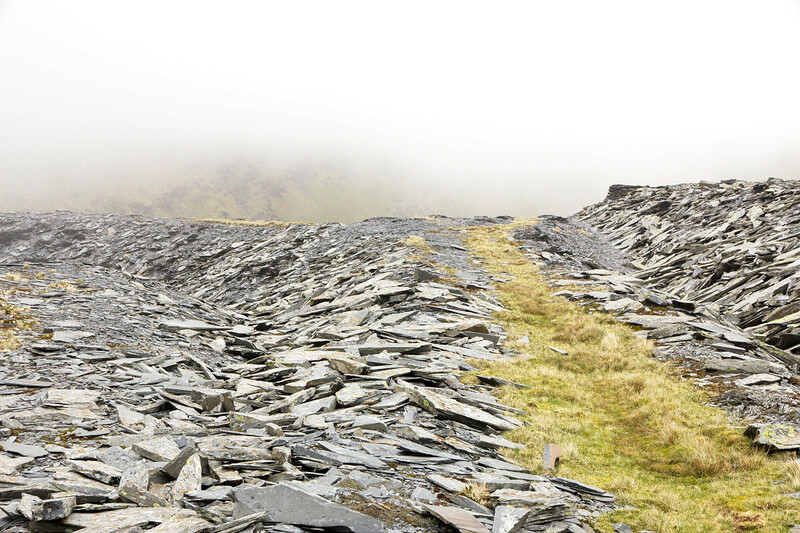 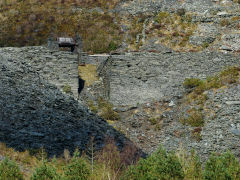 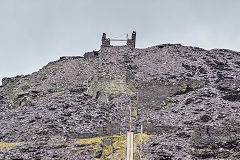 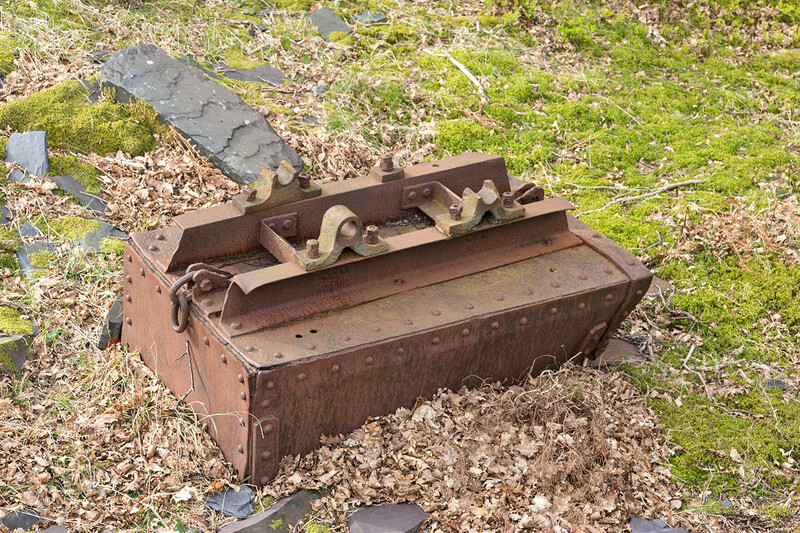 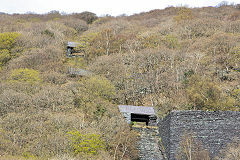 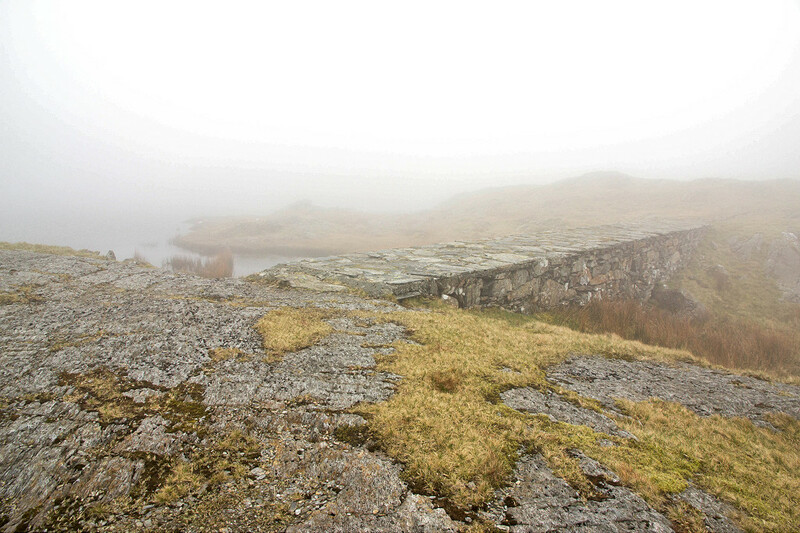 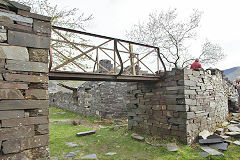 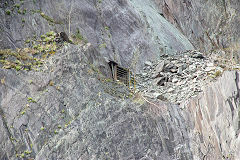 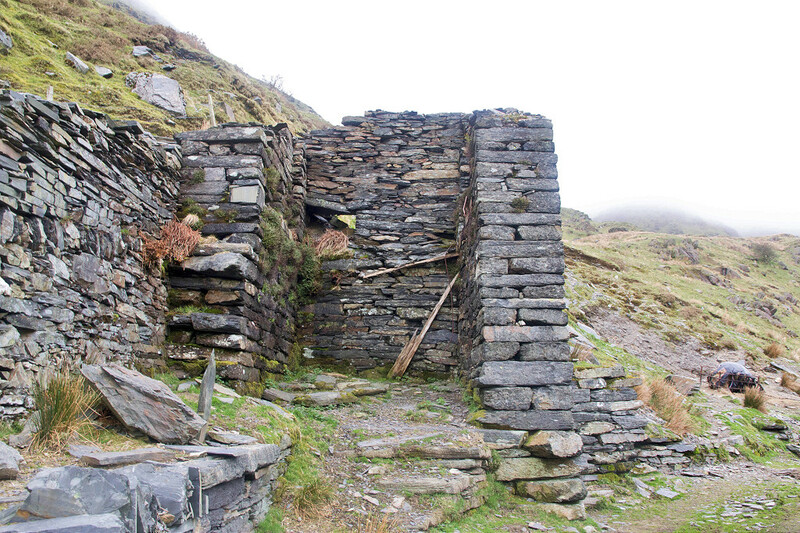 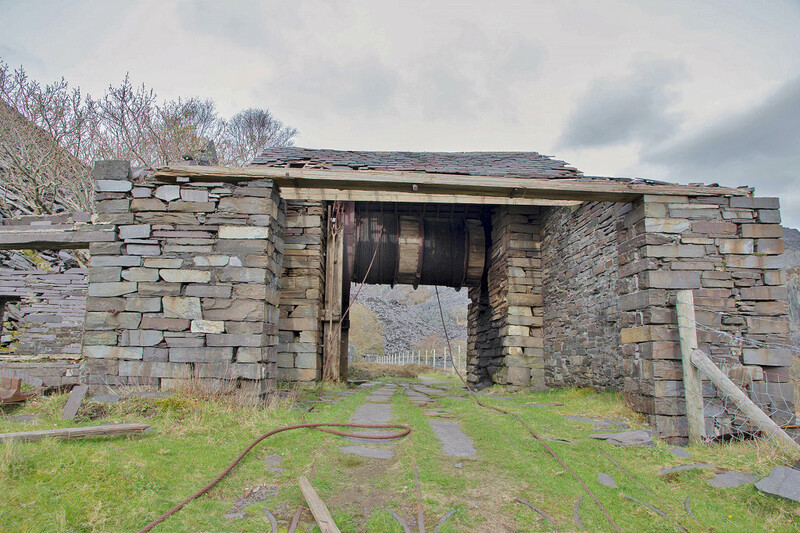 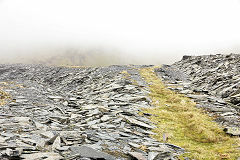 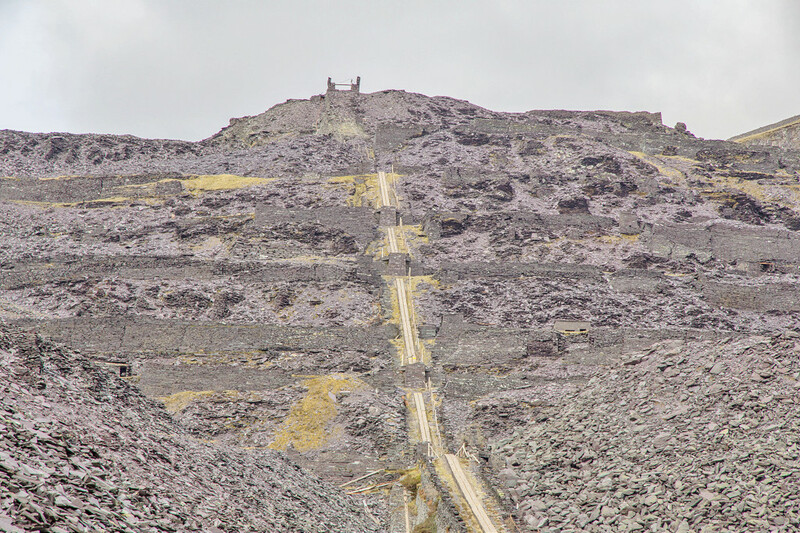 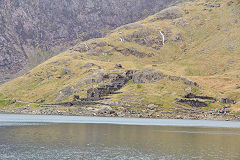 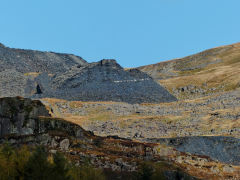 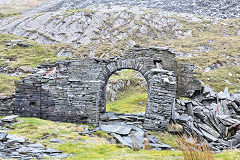 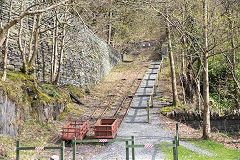 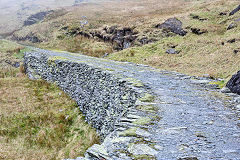 Work on Croesor Quarry began in 1854, the incline opening in 1864. 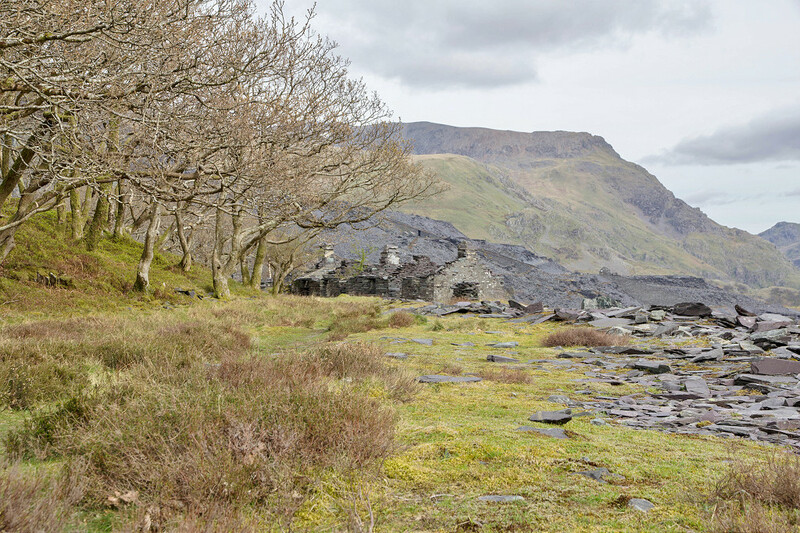 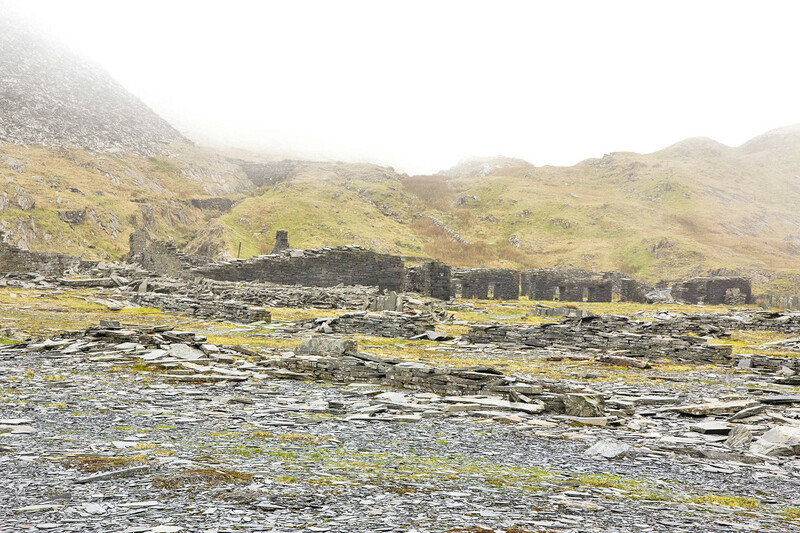 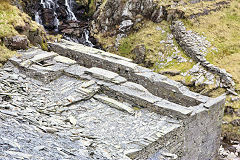 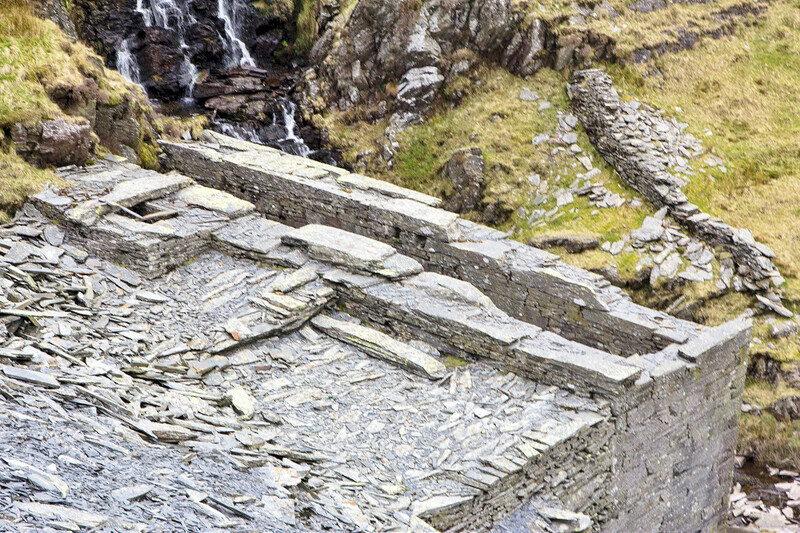 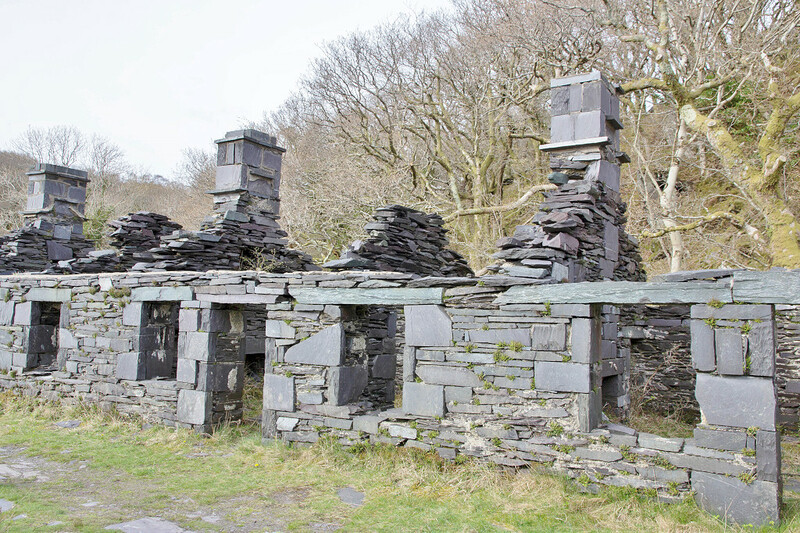 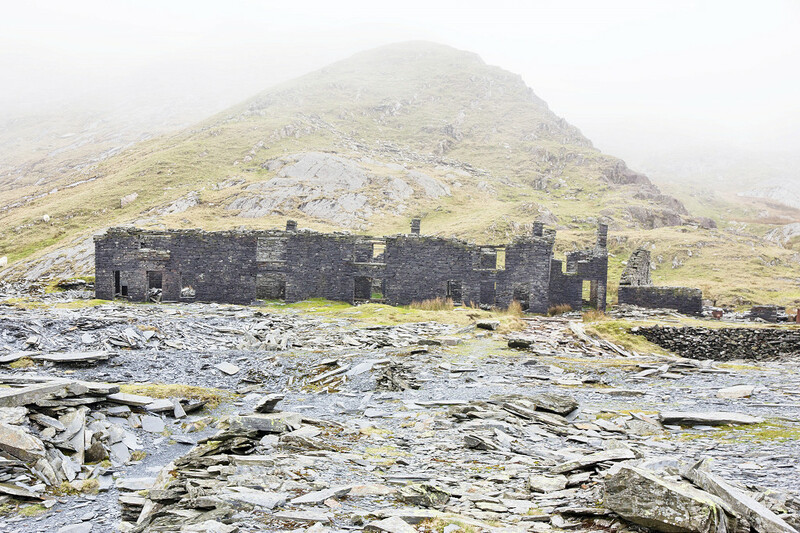 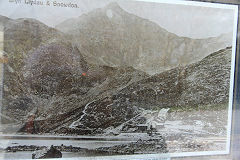 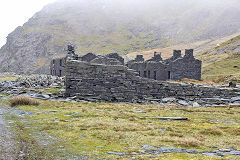 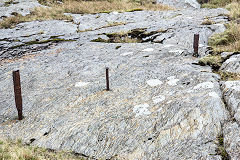 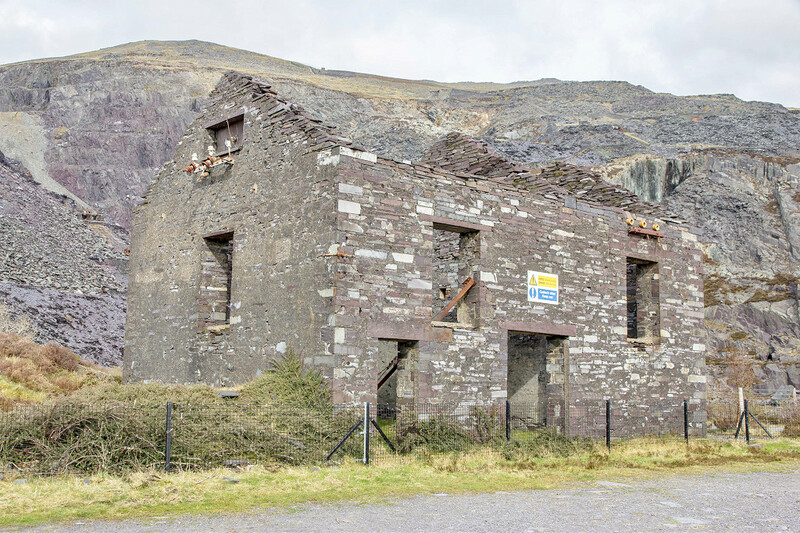 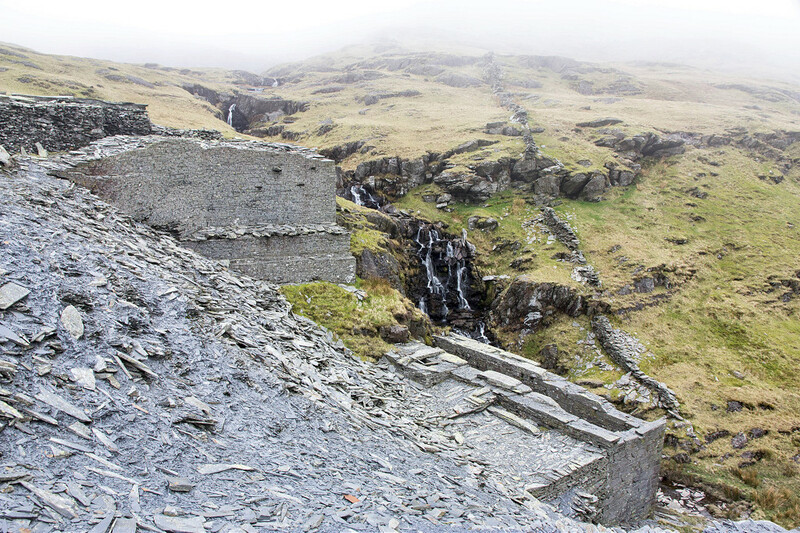 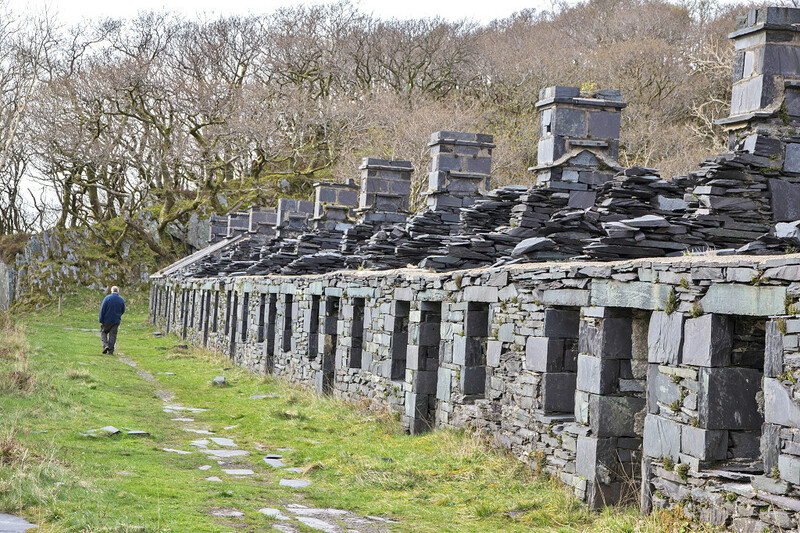 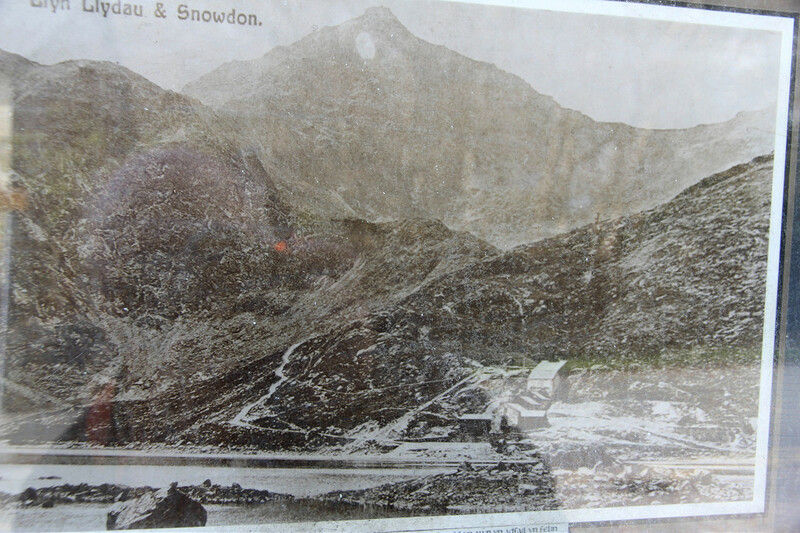 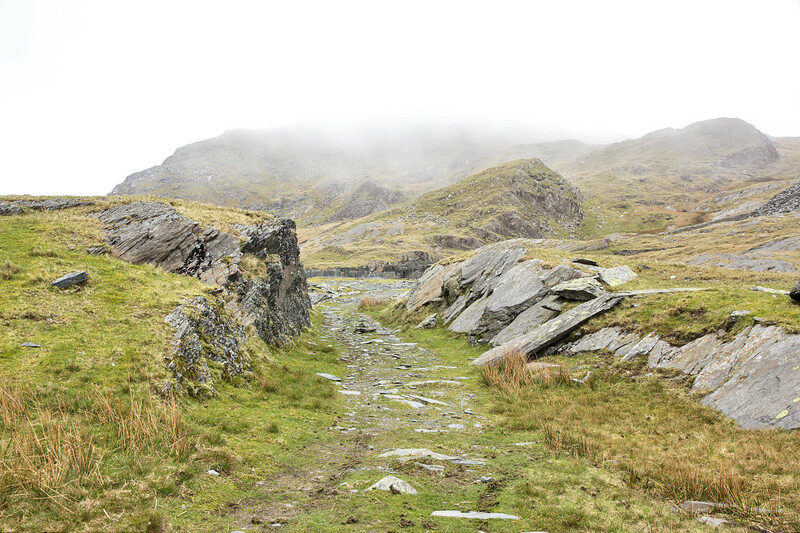 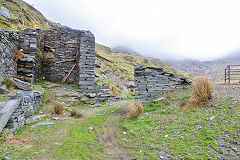 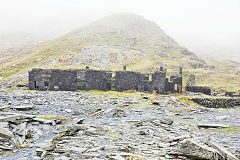 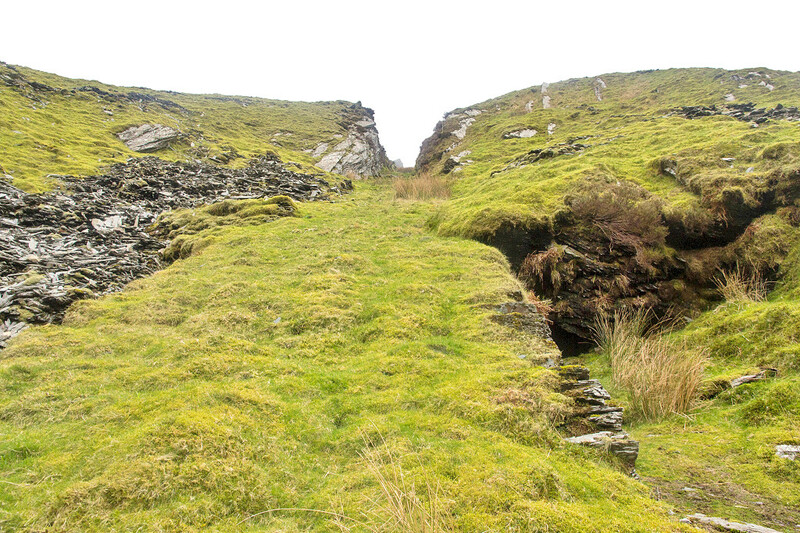 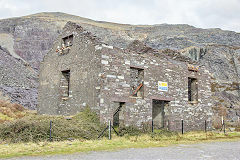 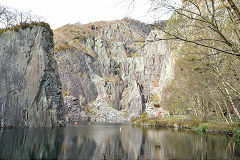 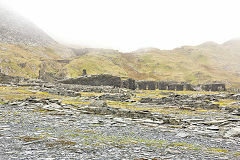 Croesor Quarry was an early convert to hydro-electricity in 1904 but closed by 1930. 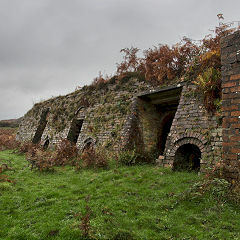 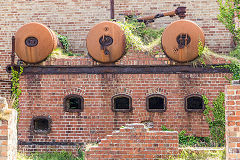 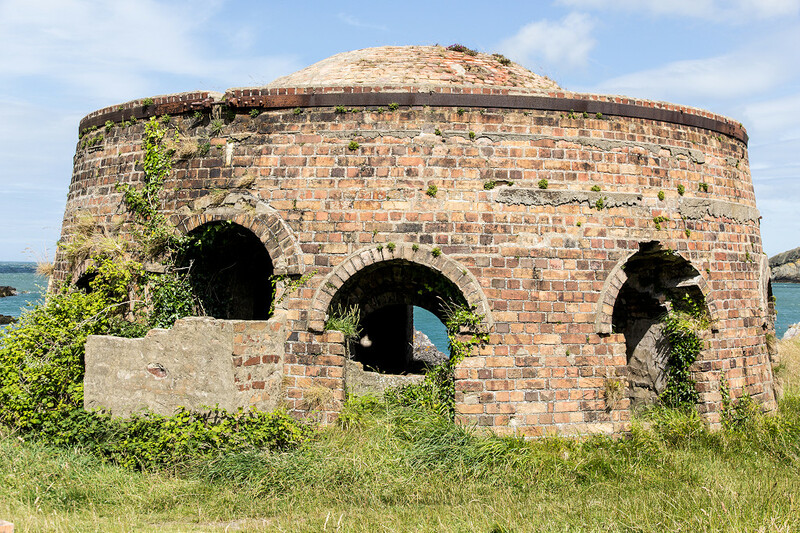 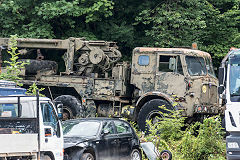 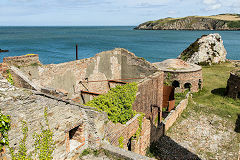 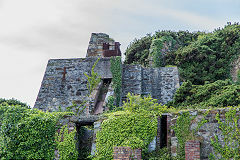 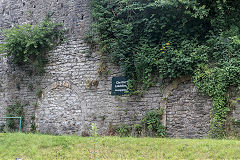 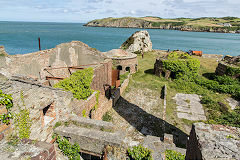 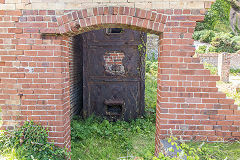 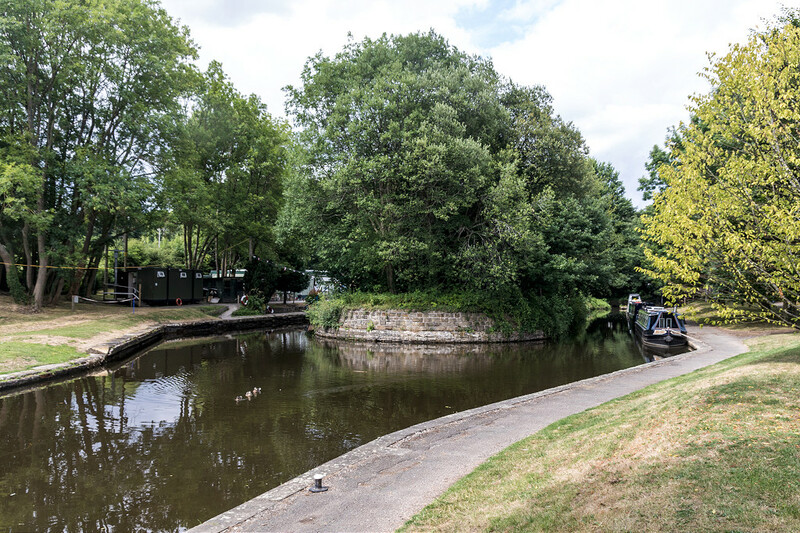 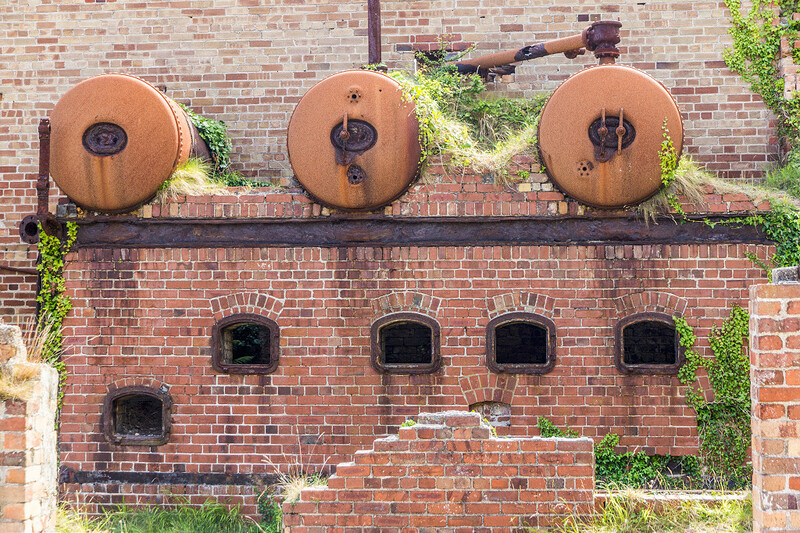 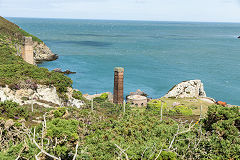 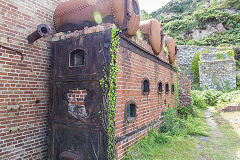 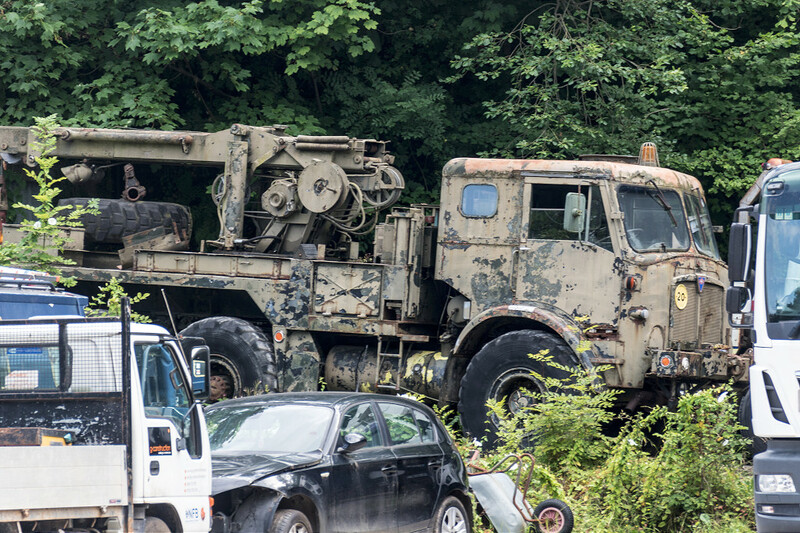 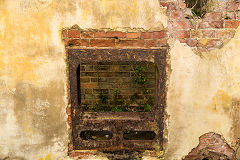 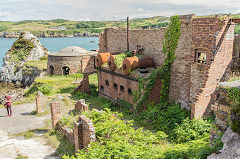 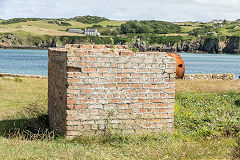 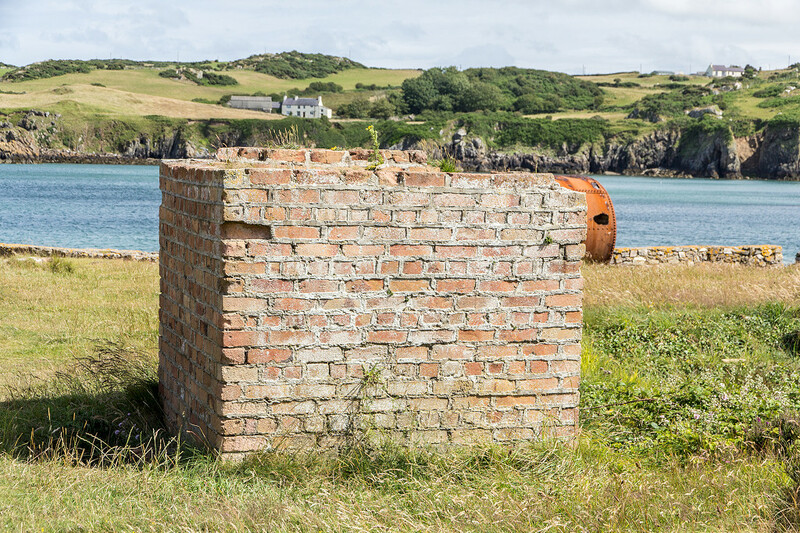 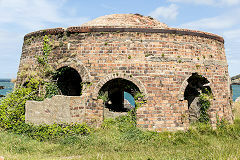 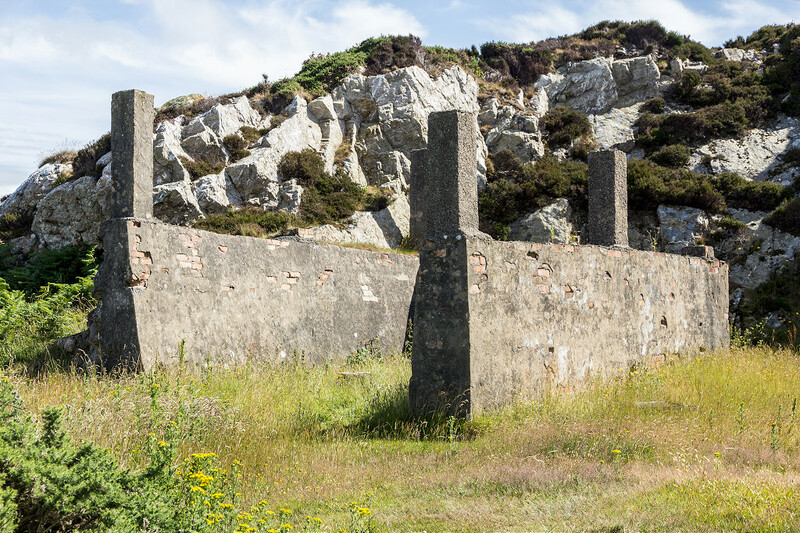 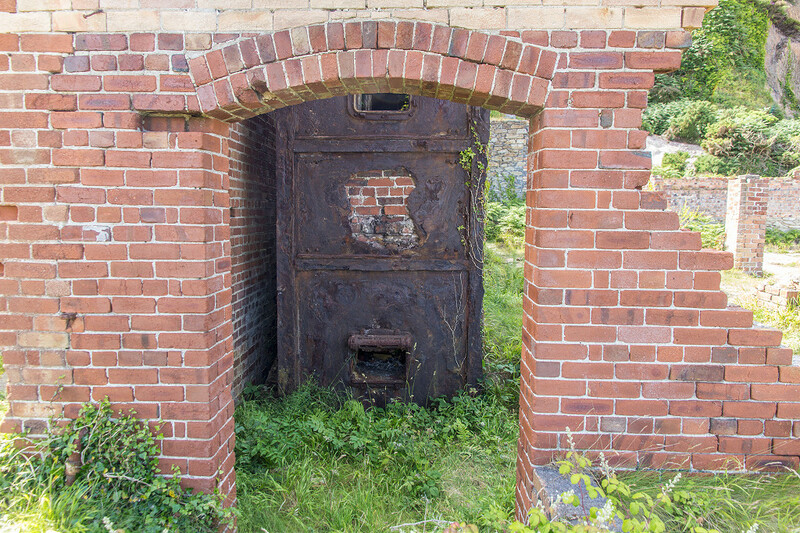 However it had a second life from 1942 as an explosives store. 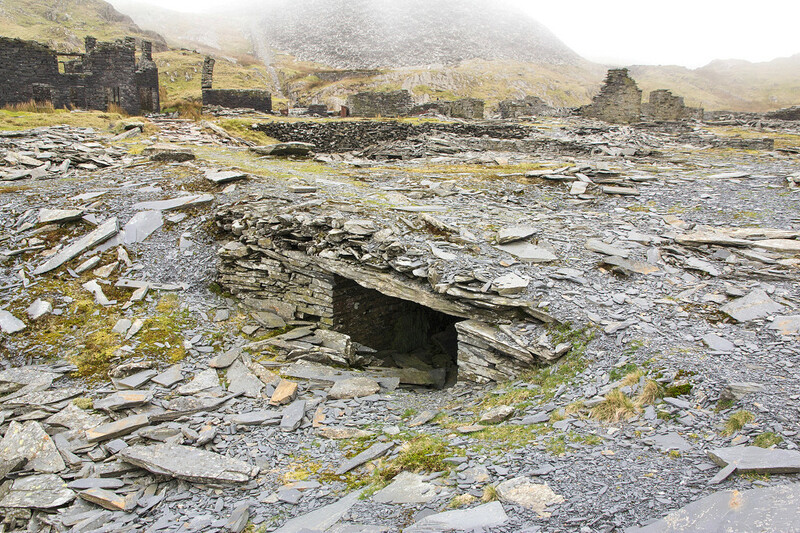 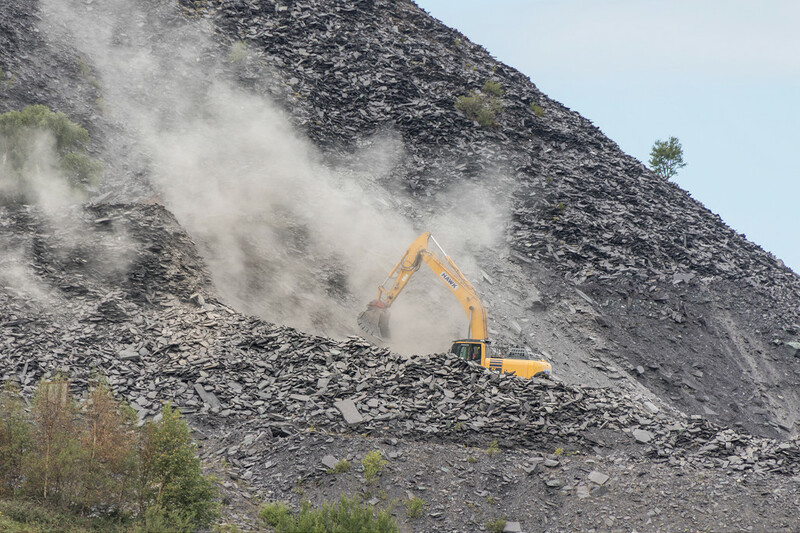 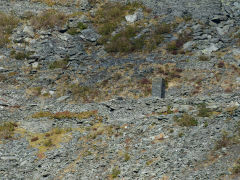 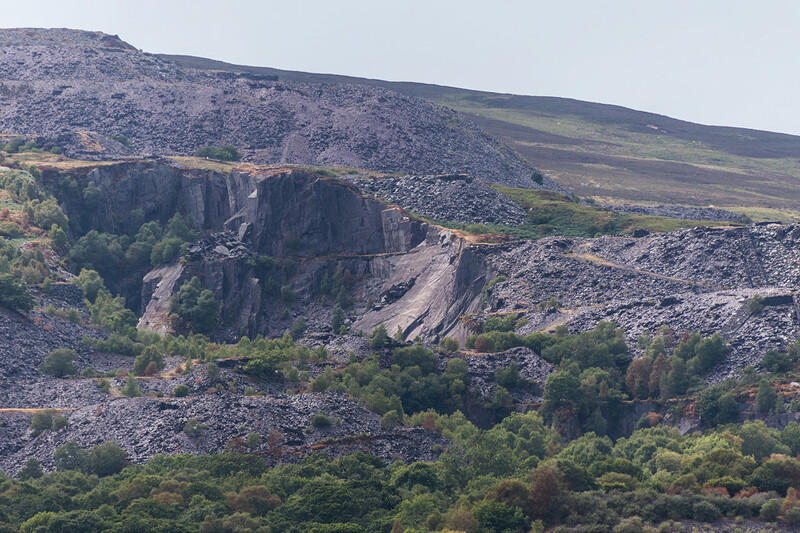 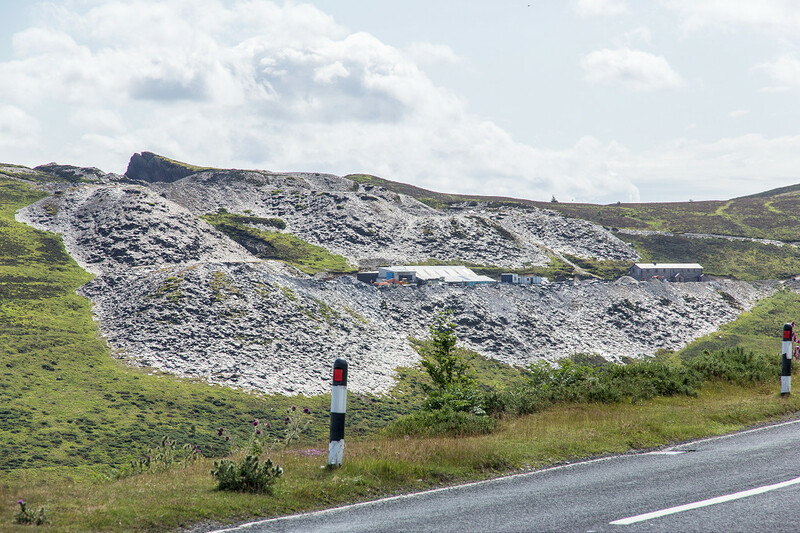 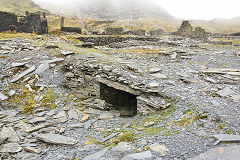 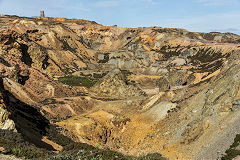 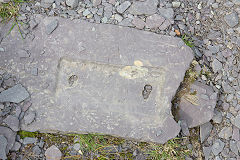 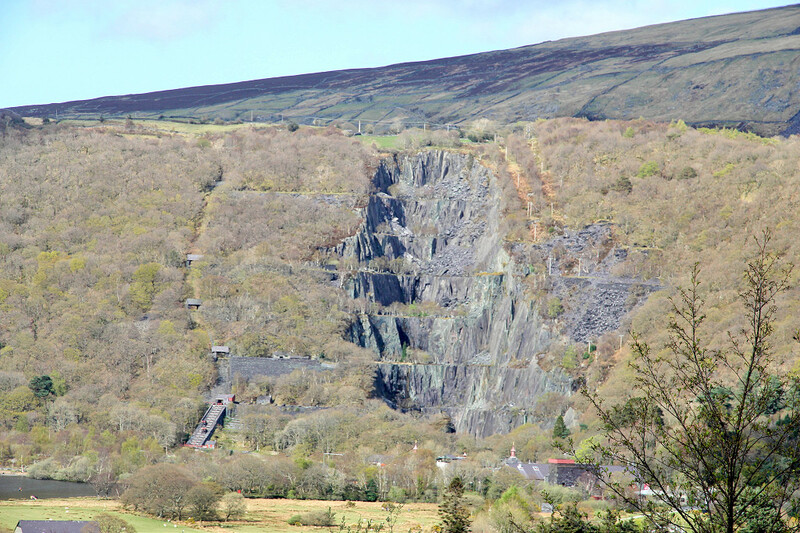 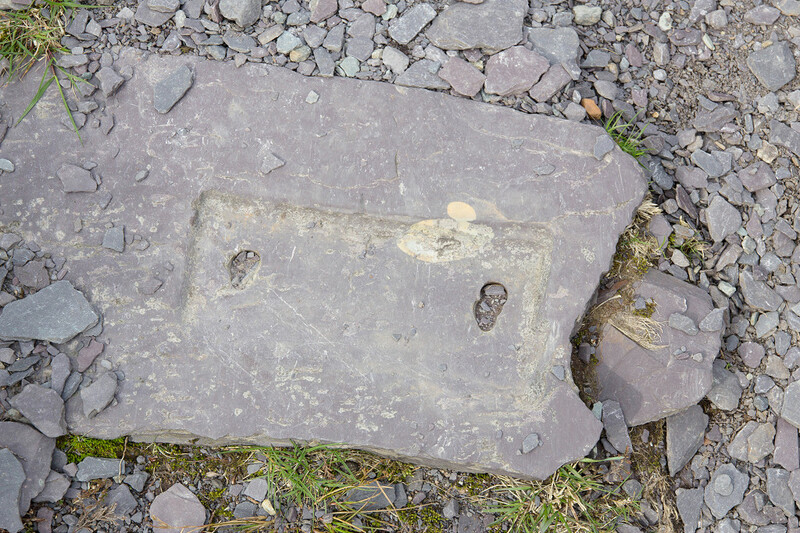 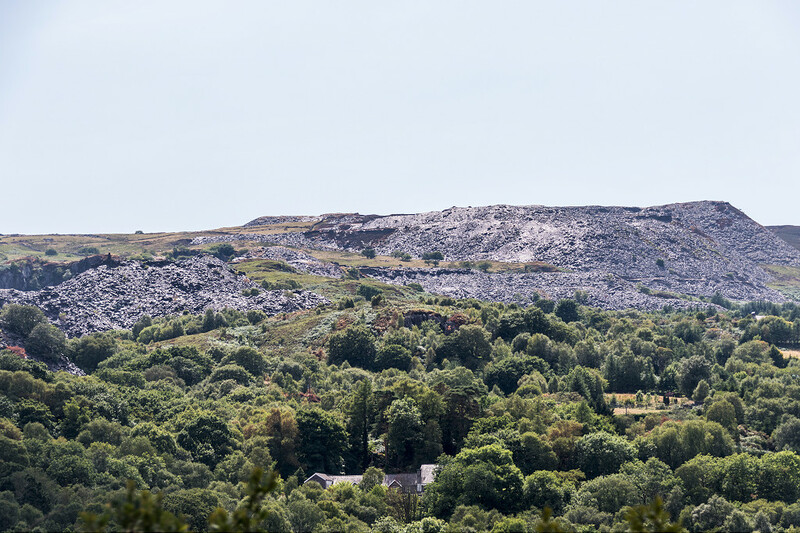 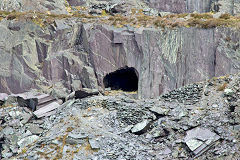 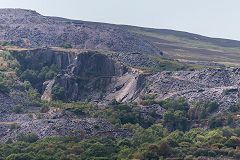 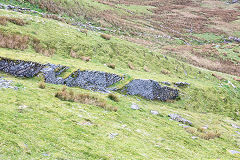 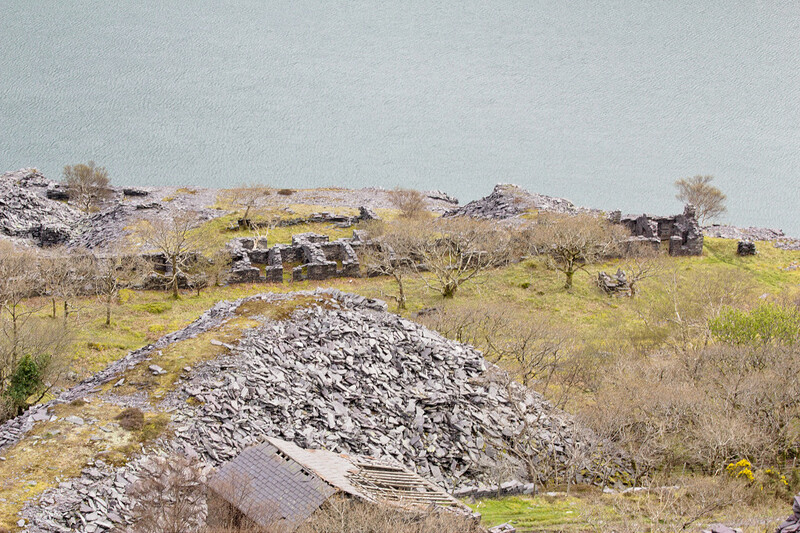 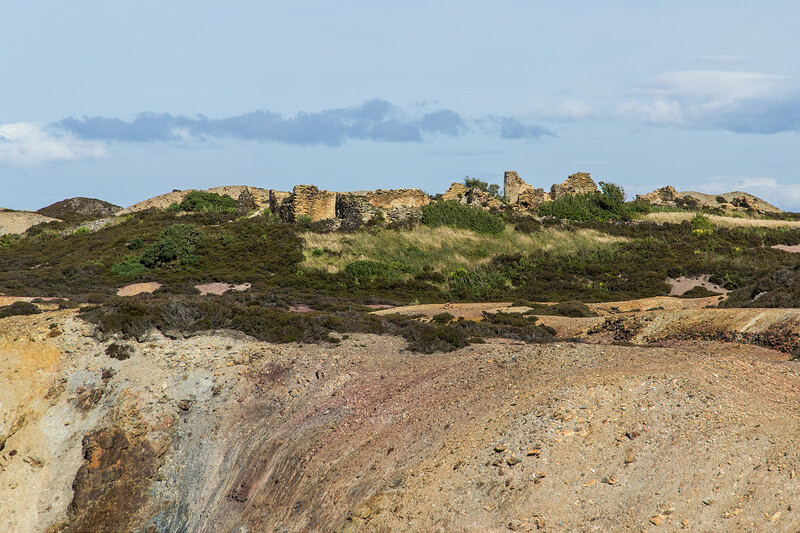 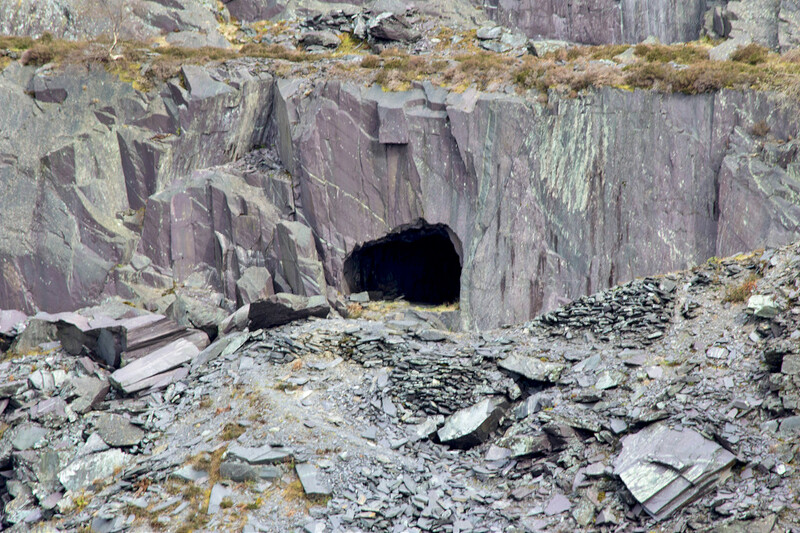 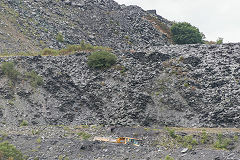 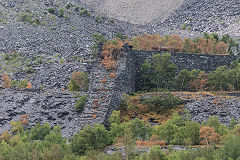 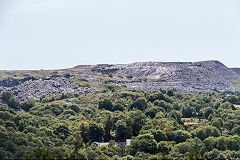 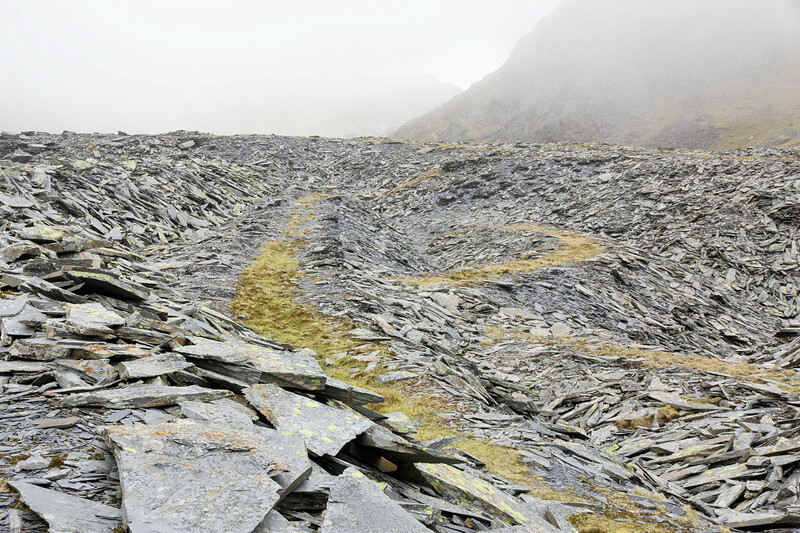 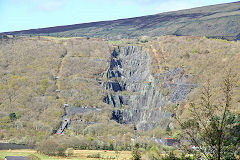 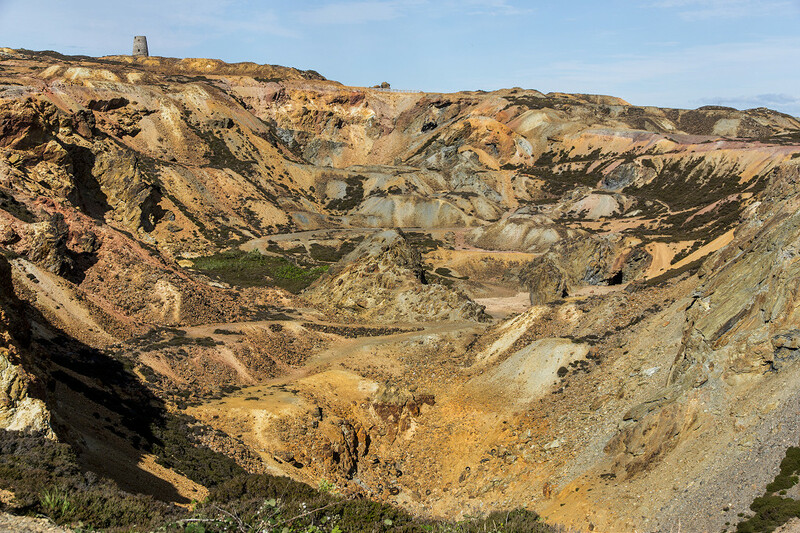 Rhosydd Quarry was one of the older quarries with minor workings up to 1853 when the Rhosydd Slate Co was formed. 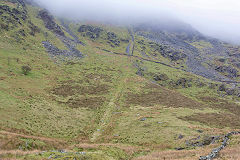 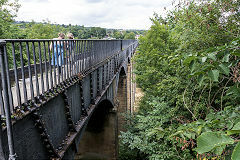 The usual chequered existence followed until closure in 1930. 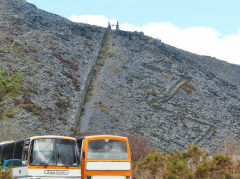 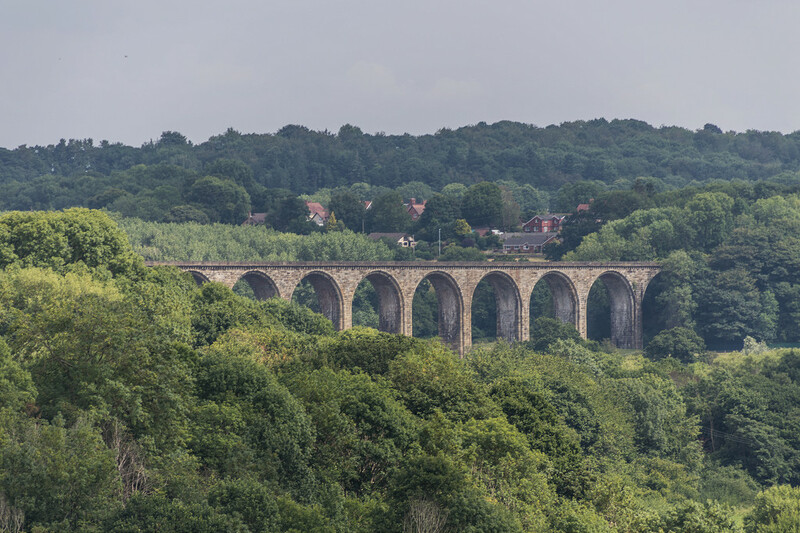 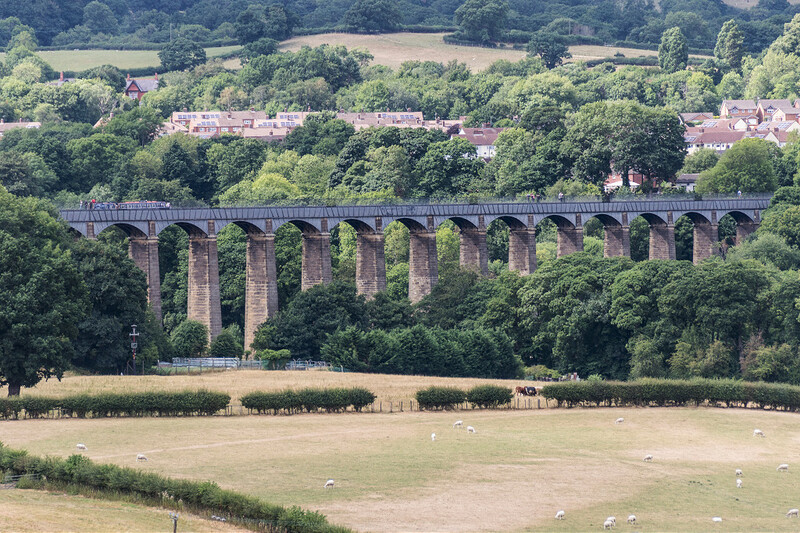 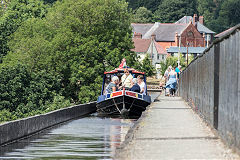 The spectacular 1500ft-long incline opened in 1864. 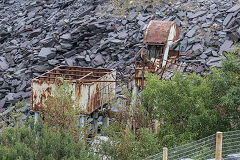 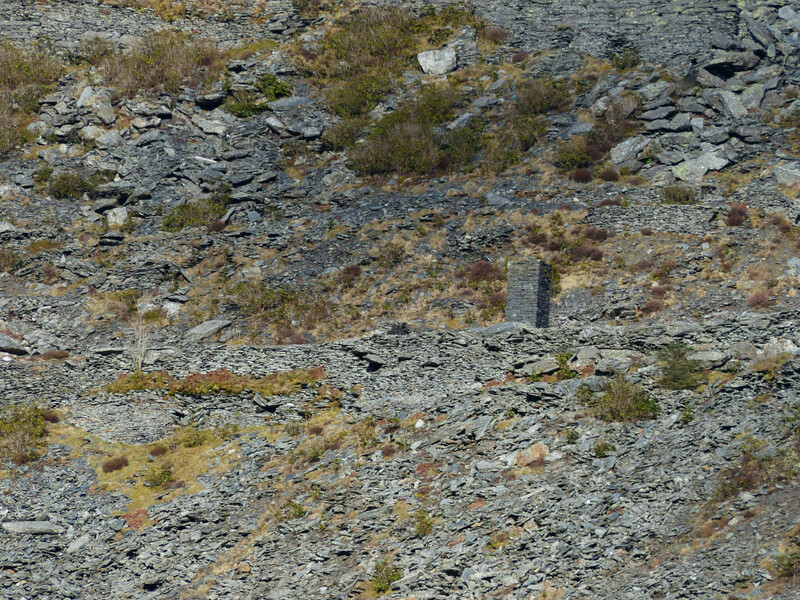 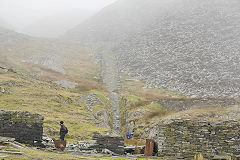 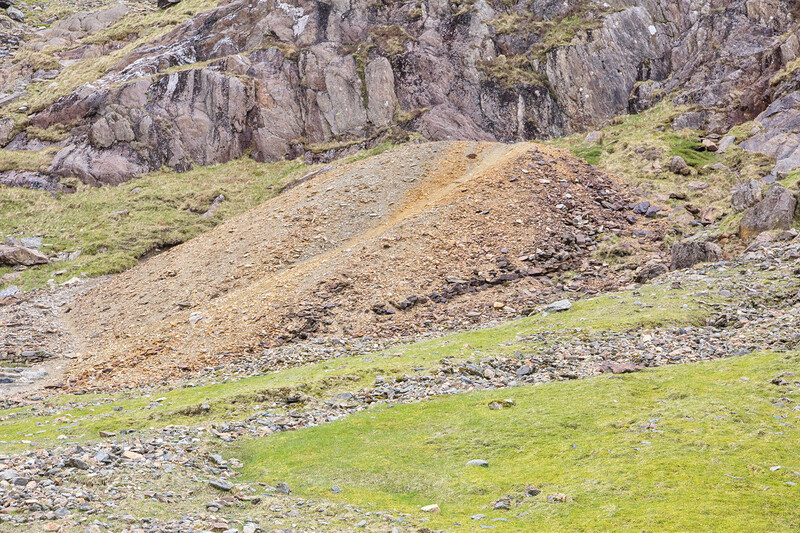 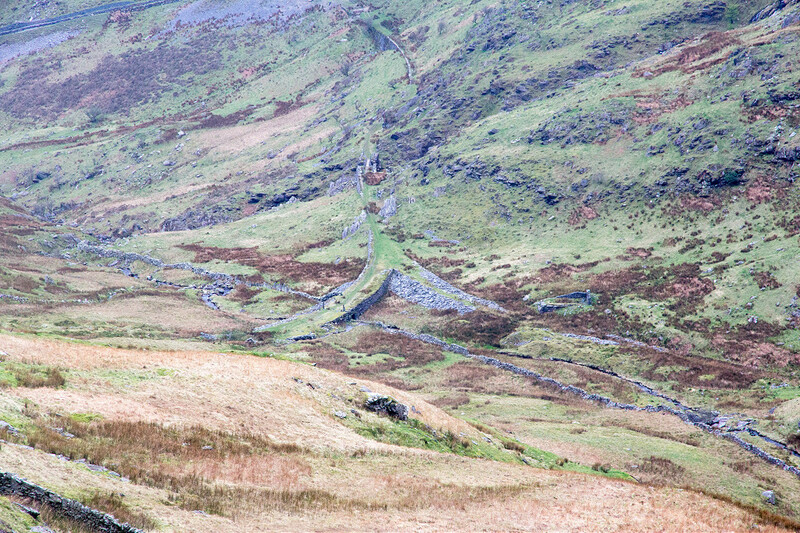 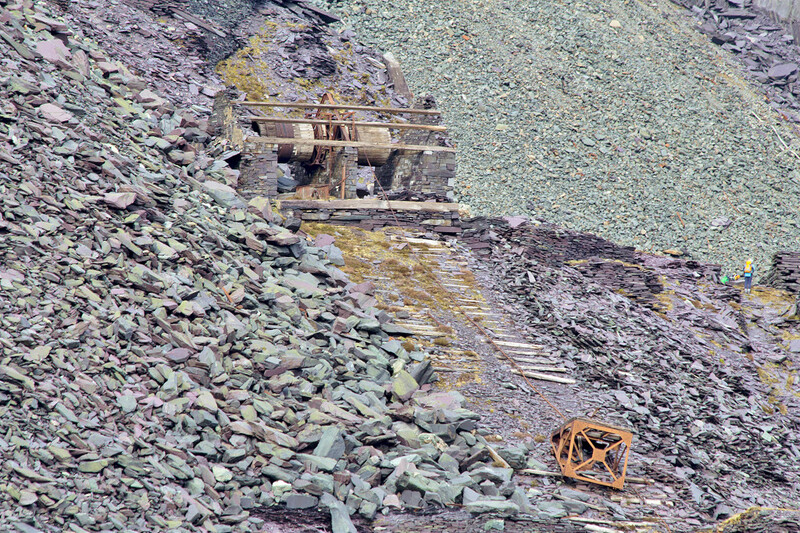 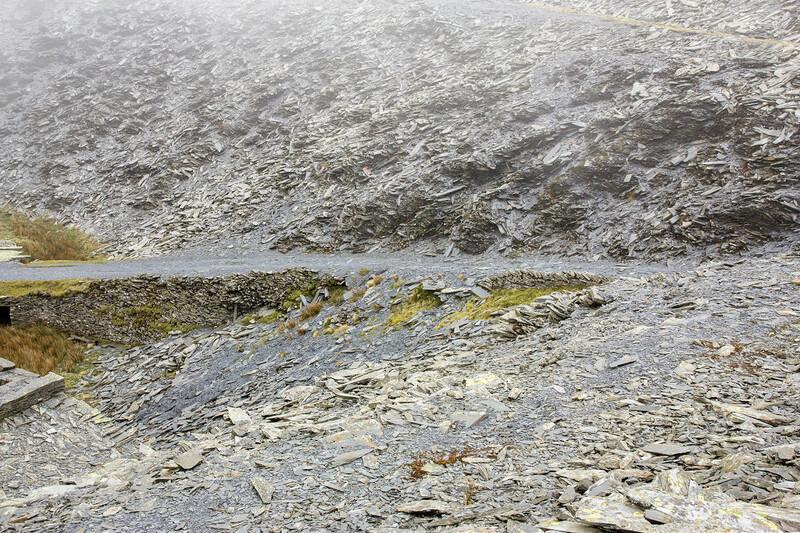 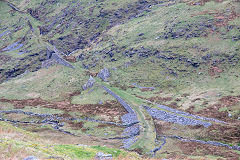 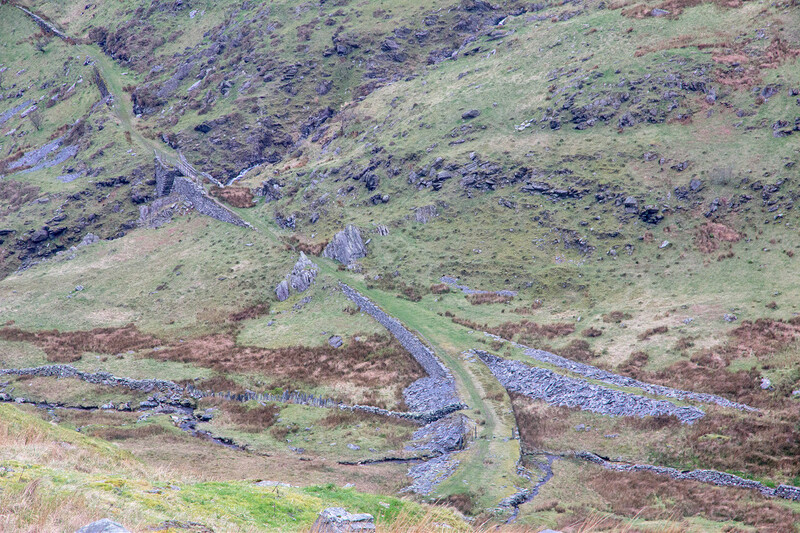 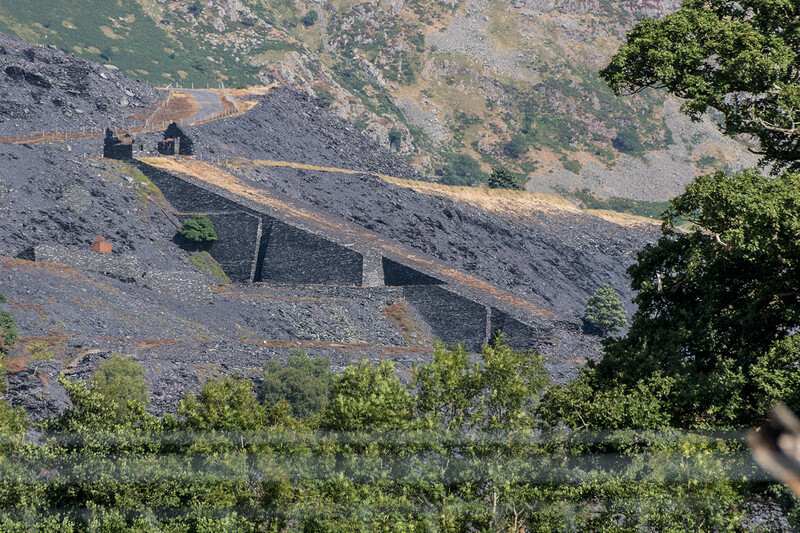 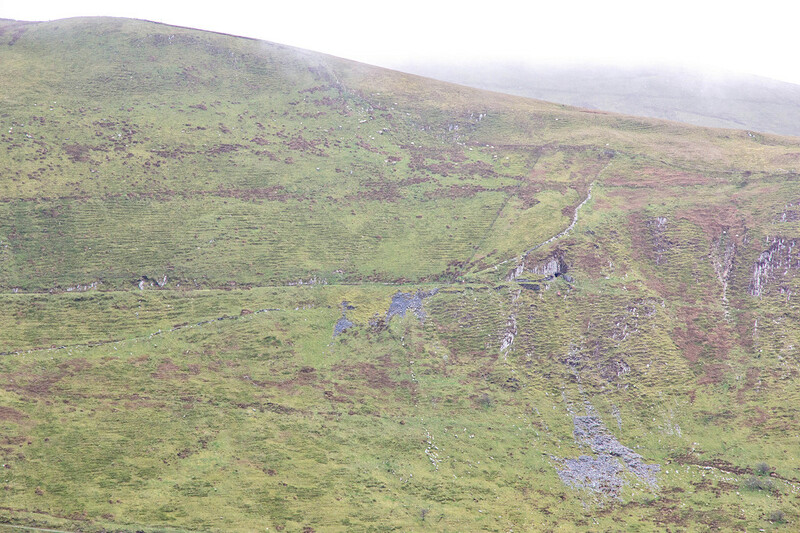 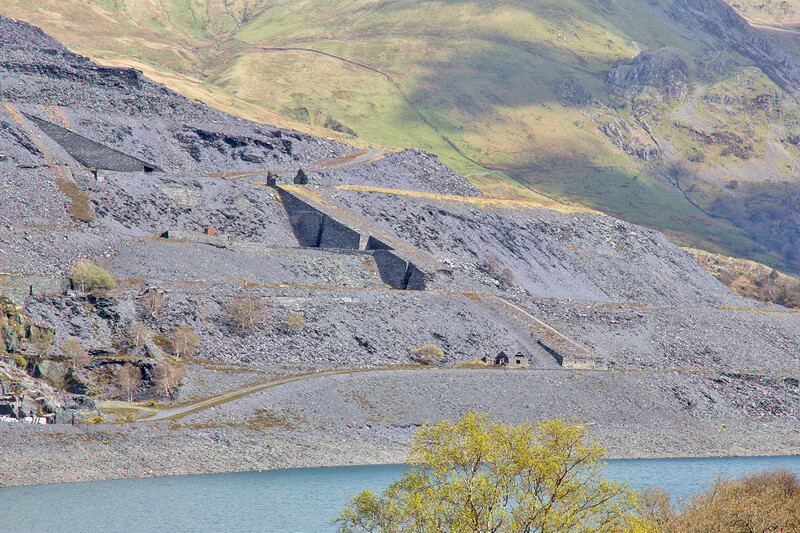 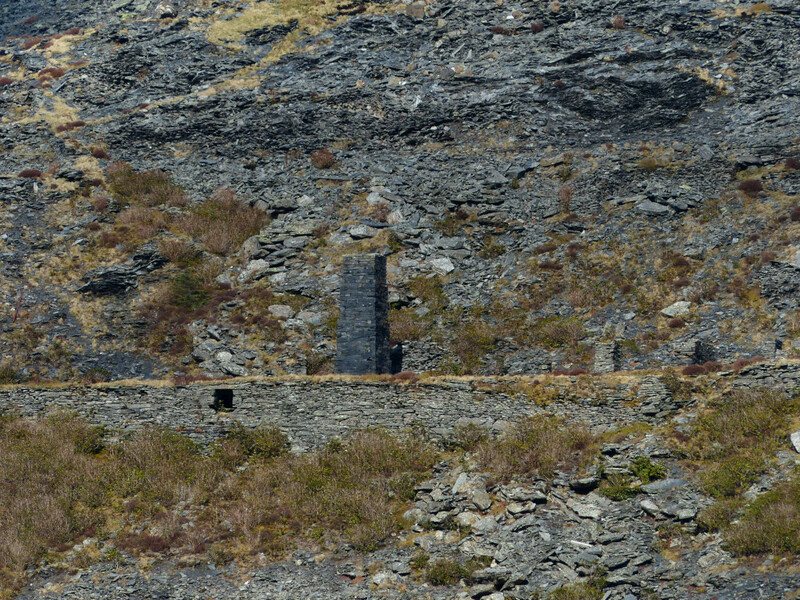 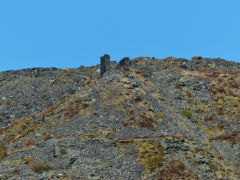 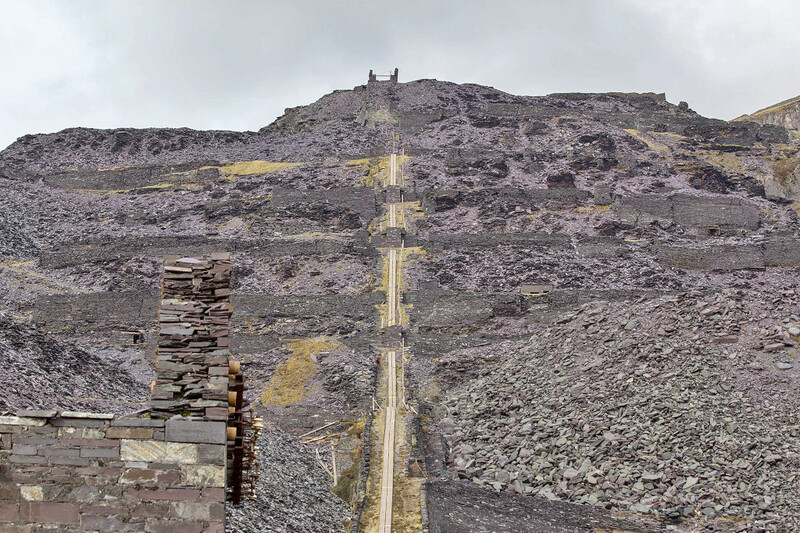 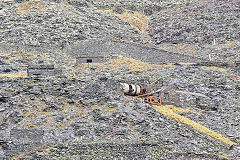 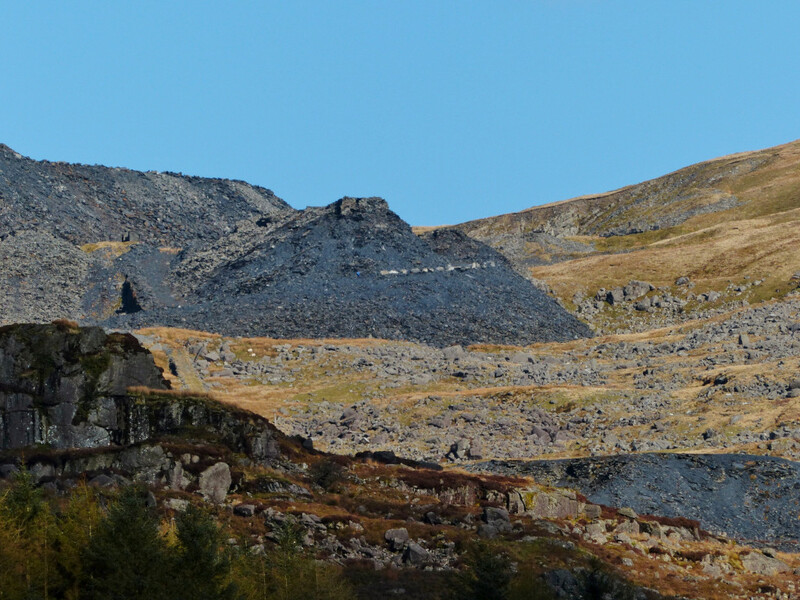 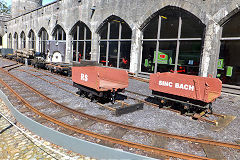 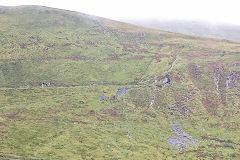 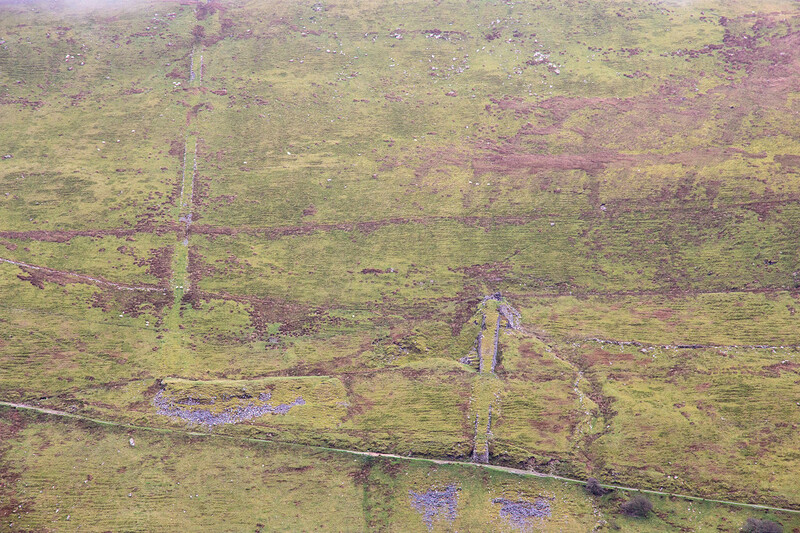 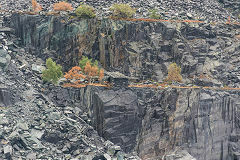 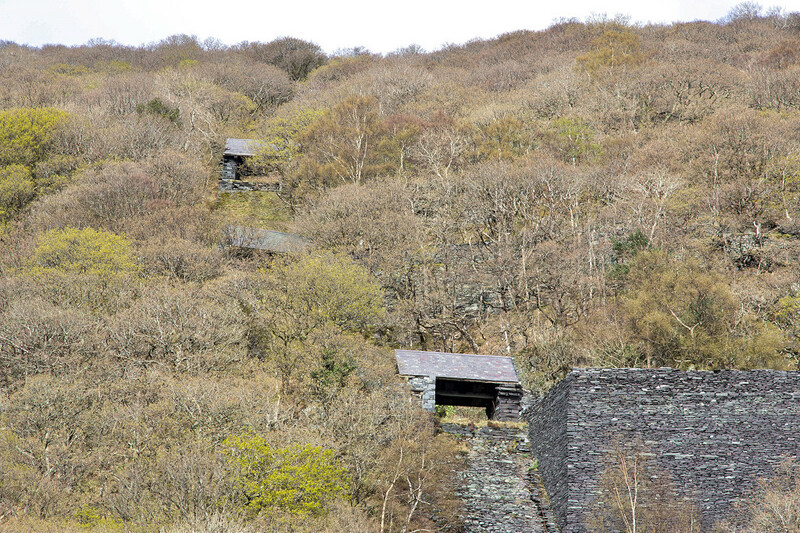 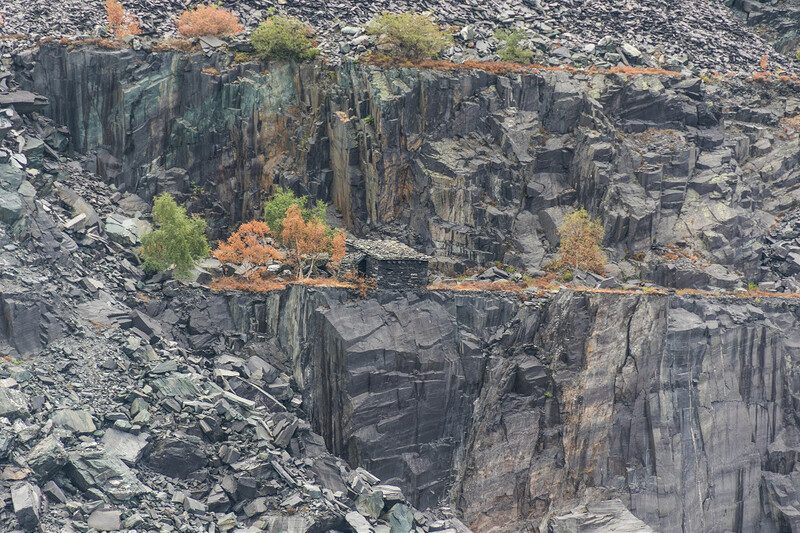 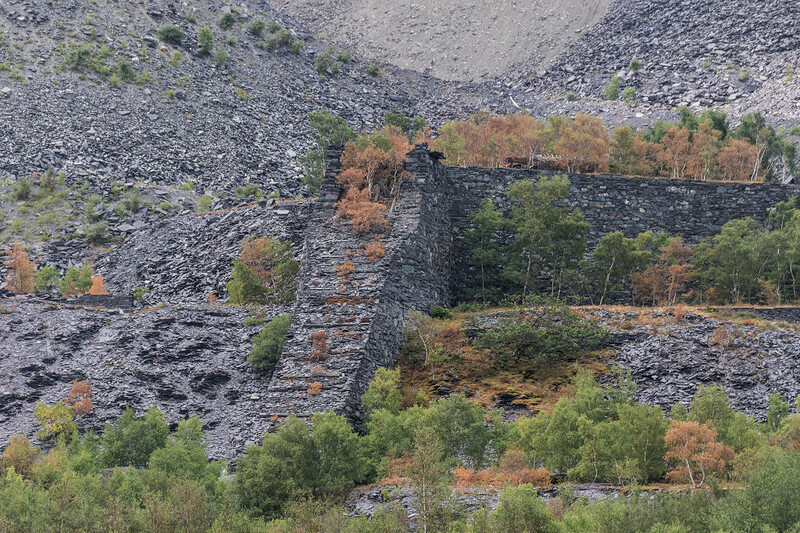 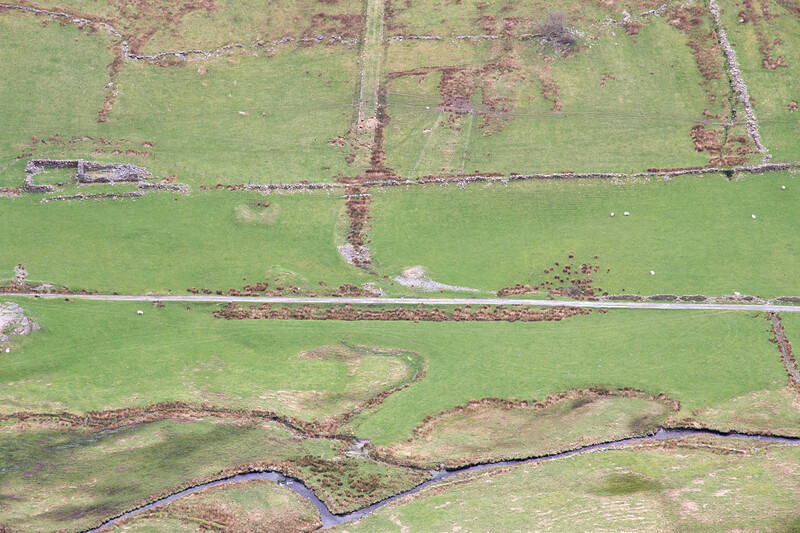 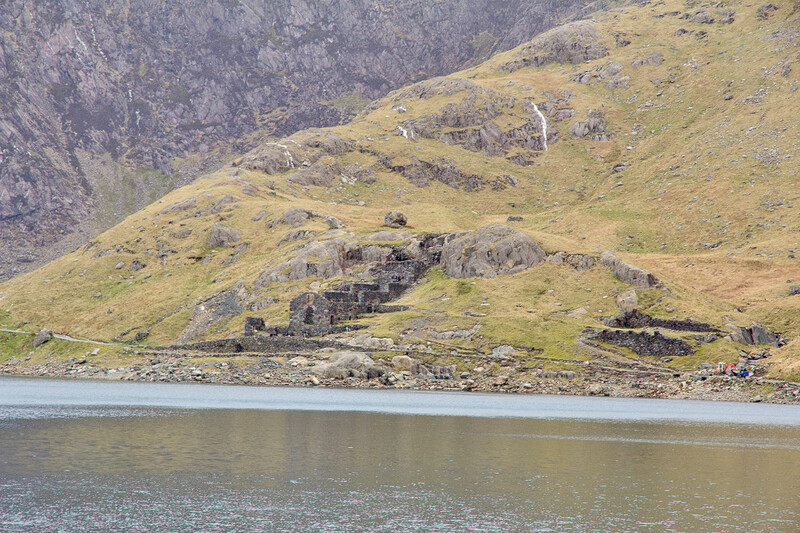 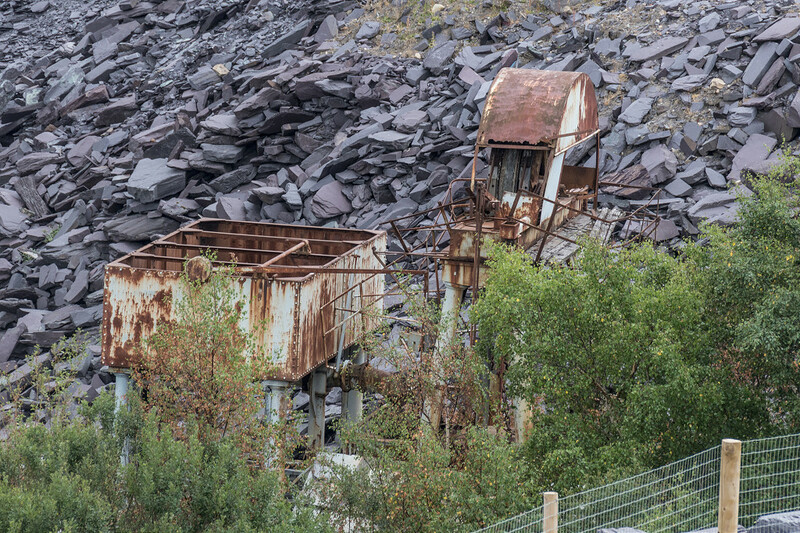 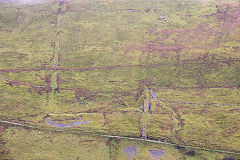 Long range photos of the Braich side of Dinorwic showing some of the transporters that took the slate wagons up and down the inclines. 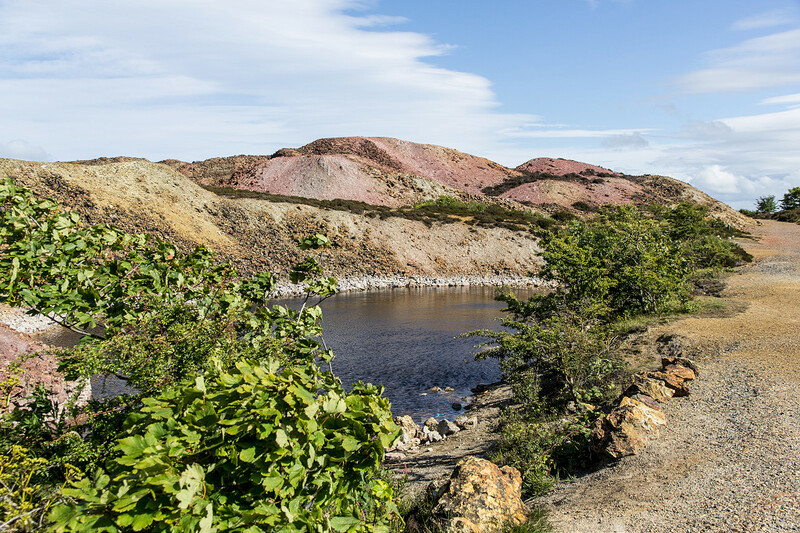 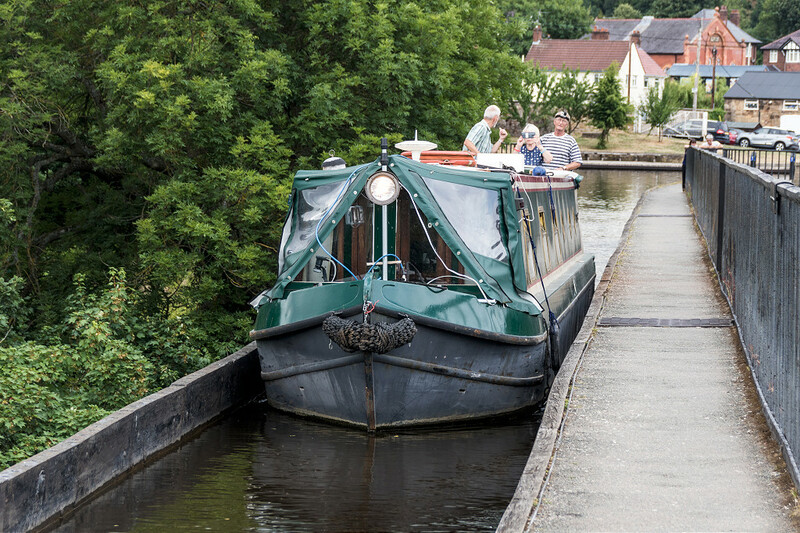 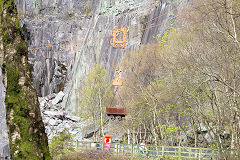 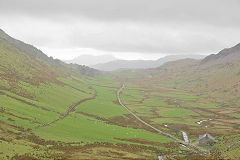 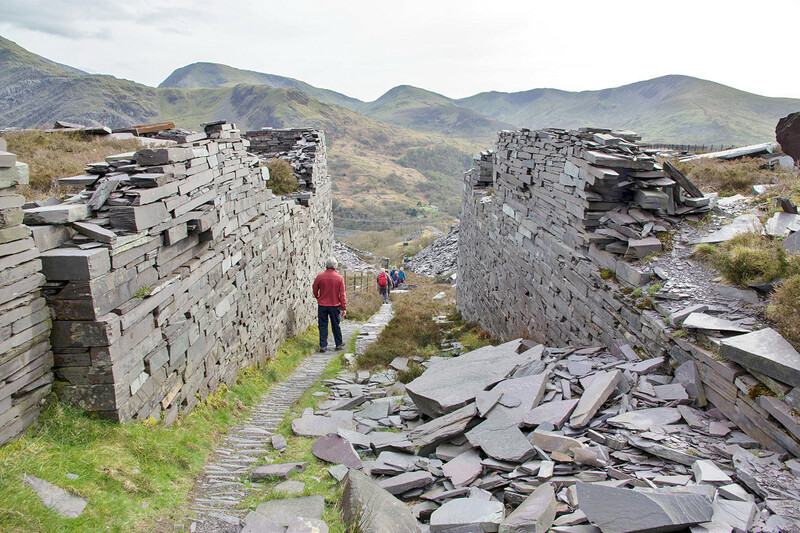 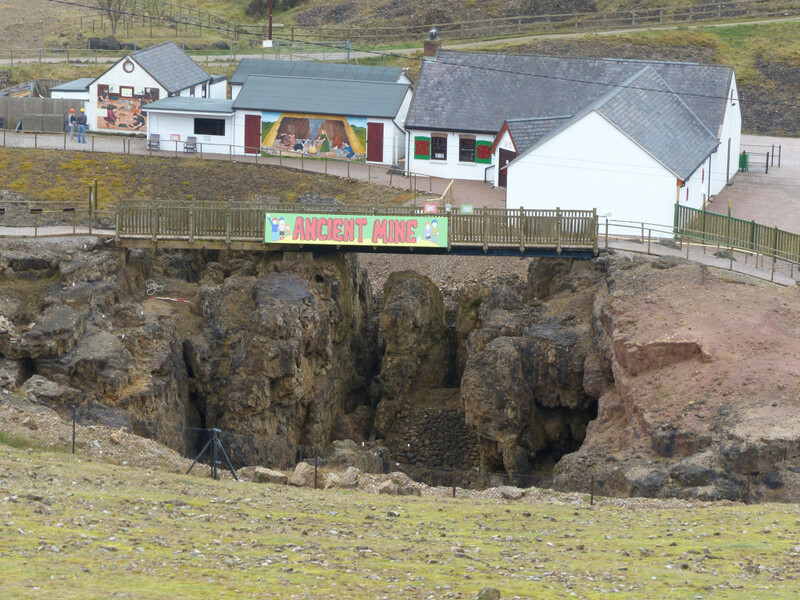 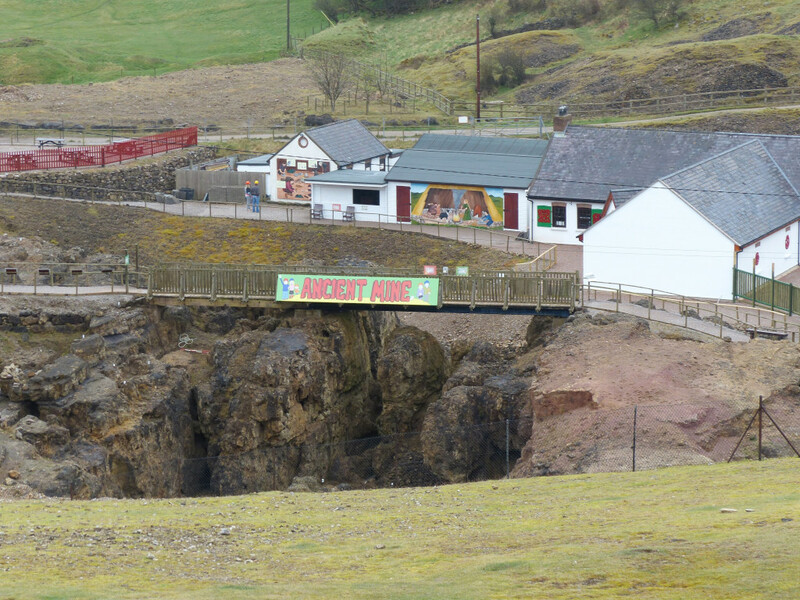 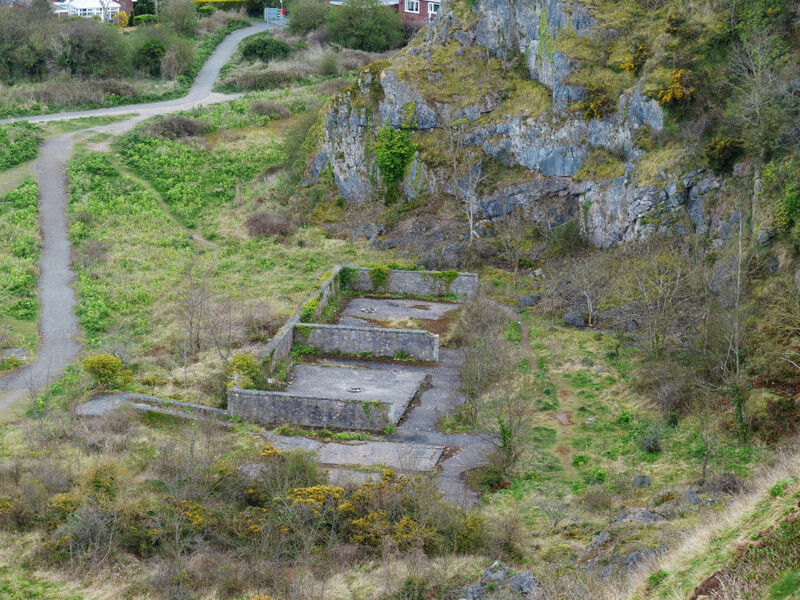 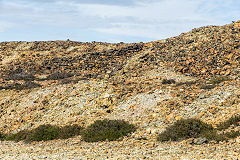 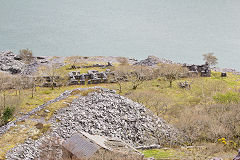 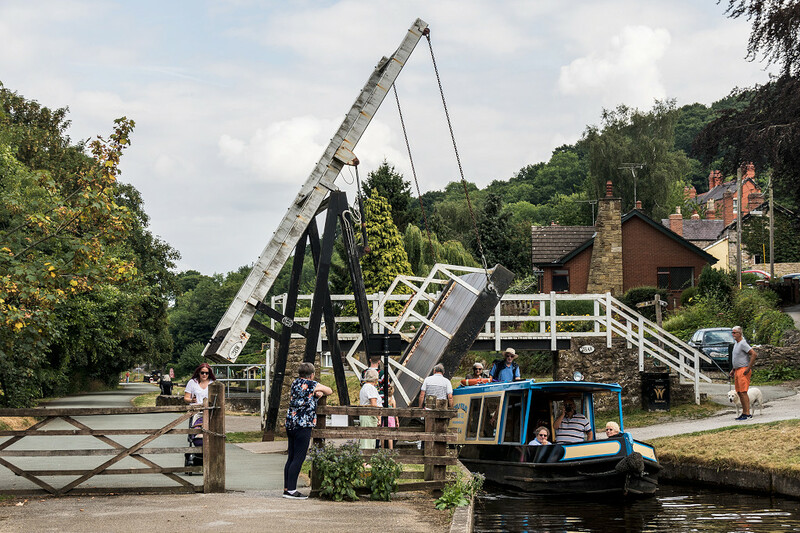 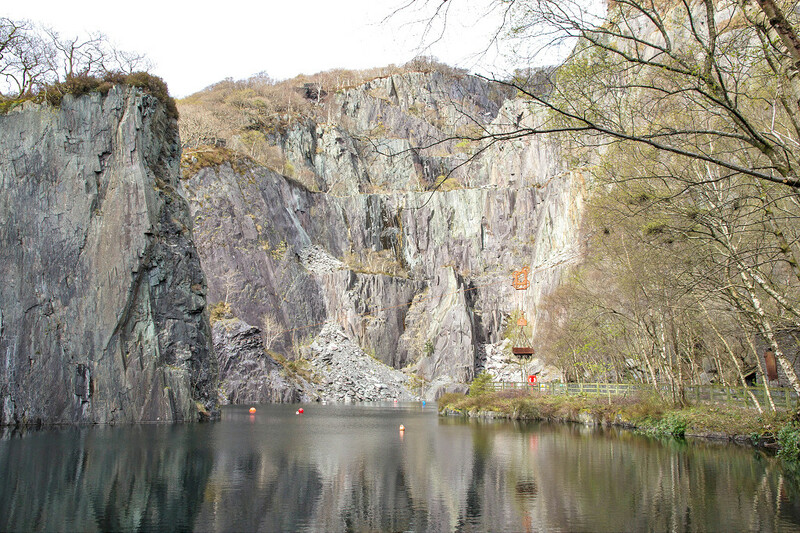 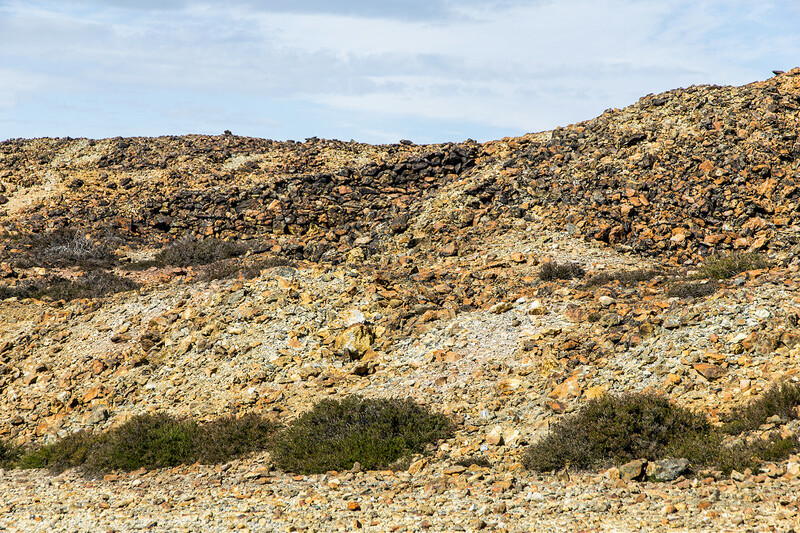 Vivian Quarry and it's inclines are part of the Museum complex but, despite being staged, are well worth seeing. 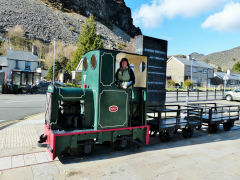 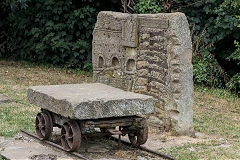 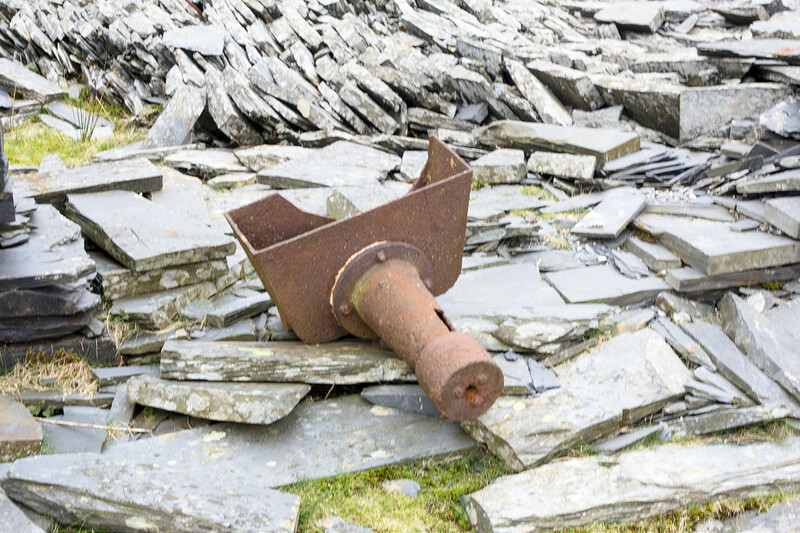 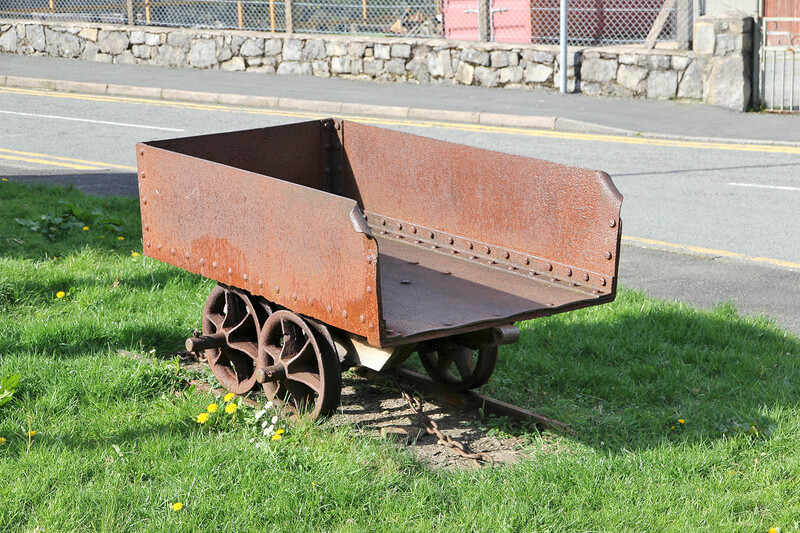 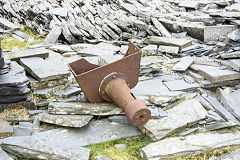 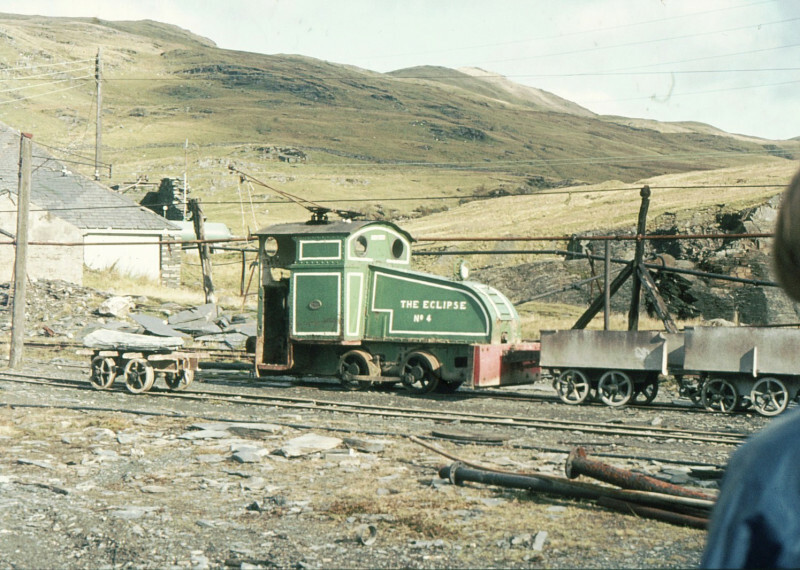 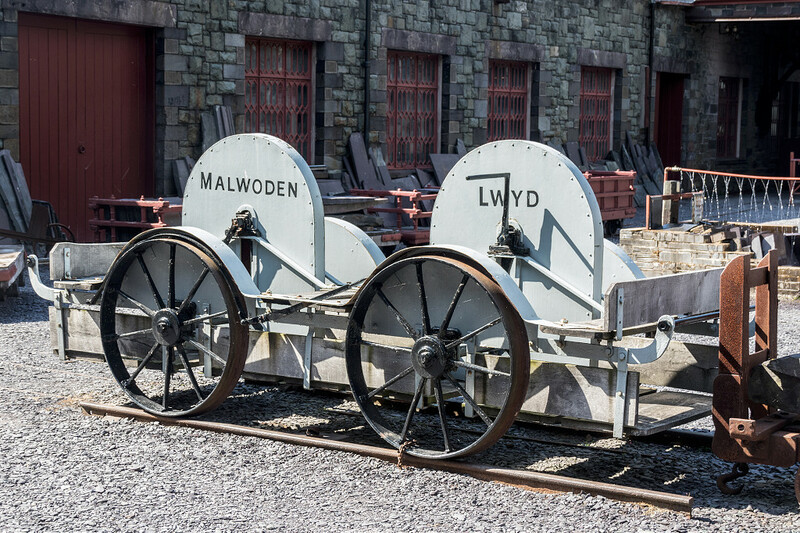 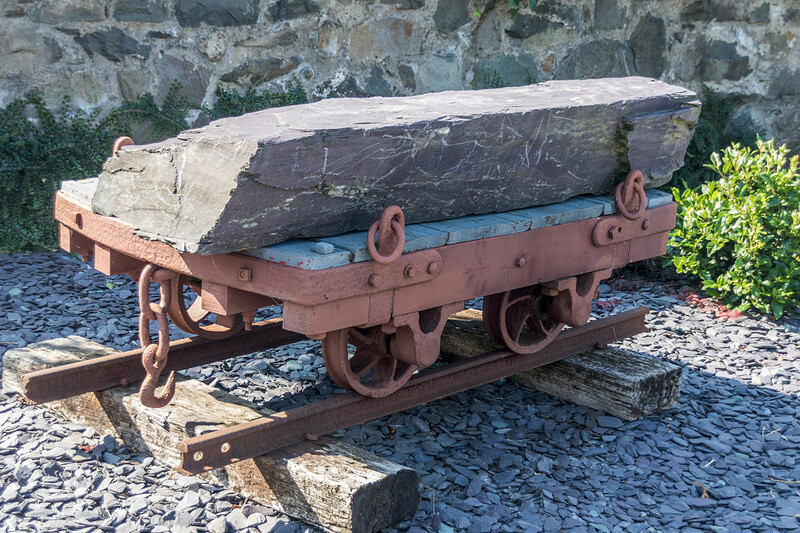 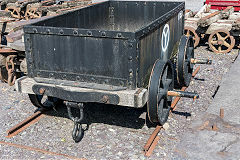 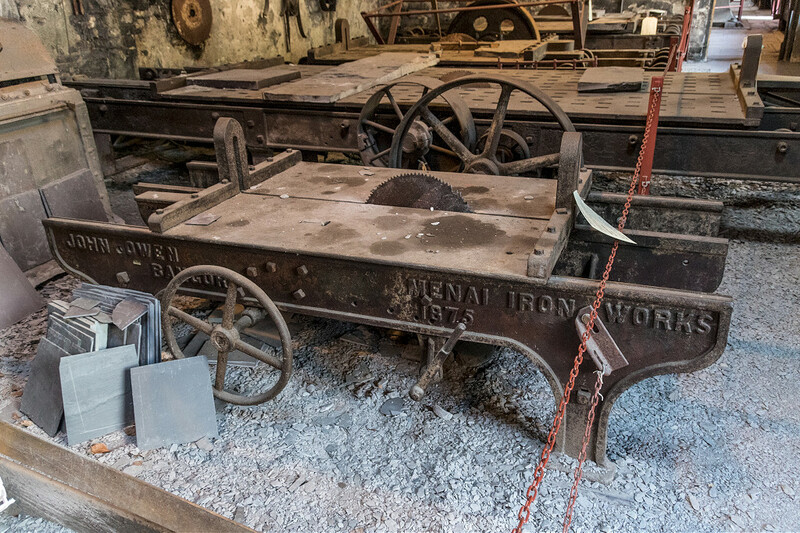 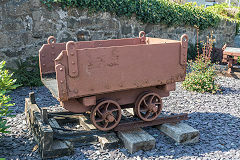 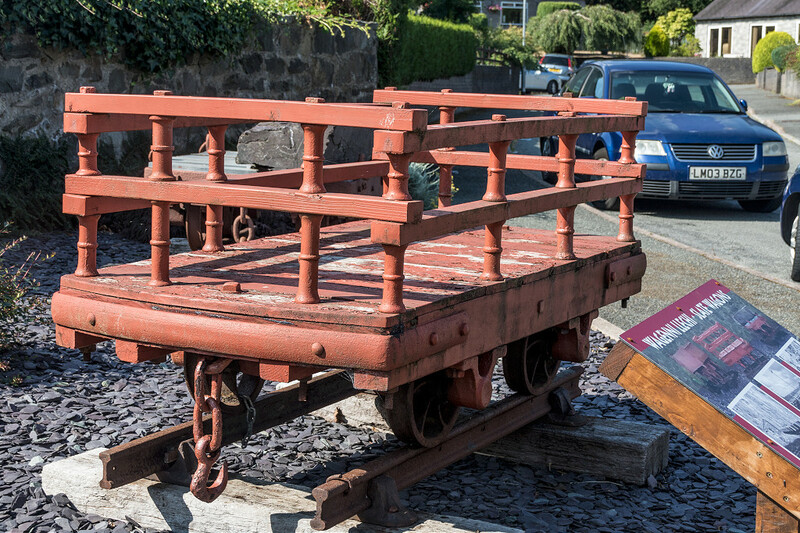 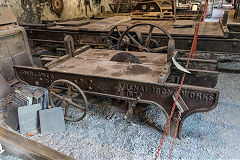 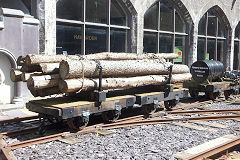 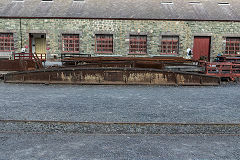 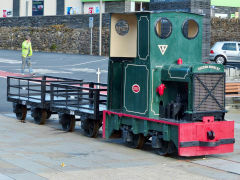 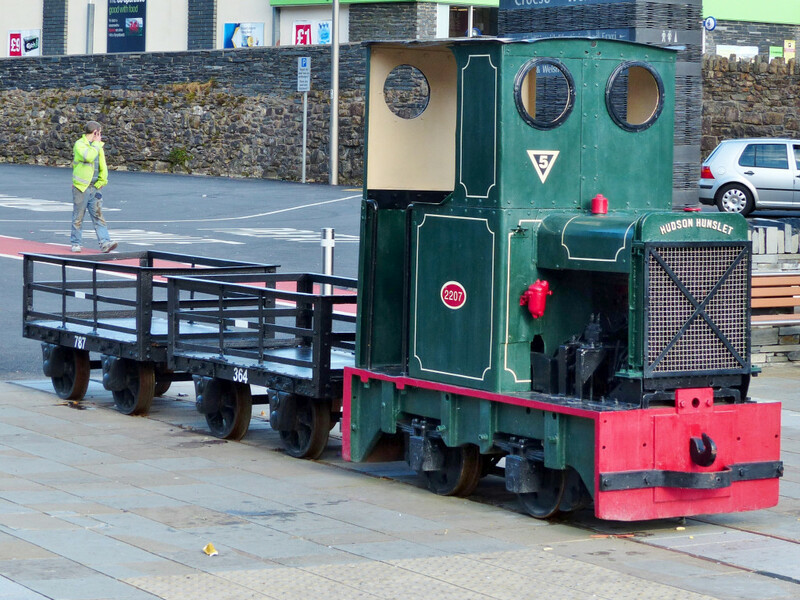 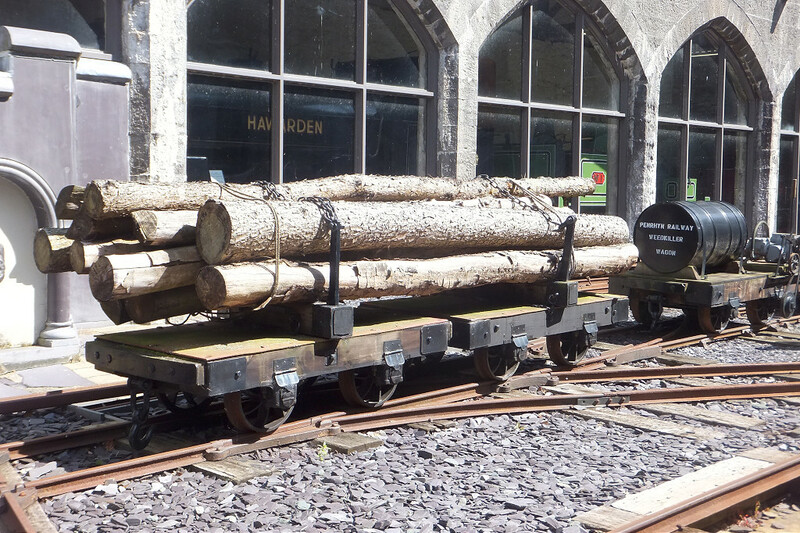 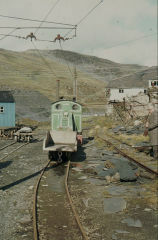 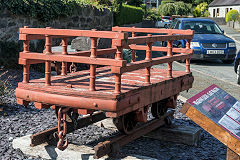 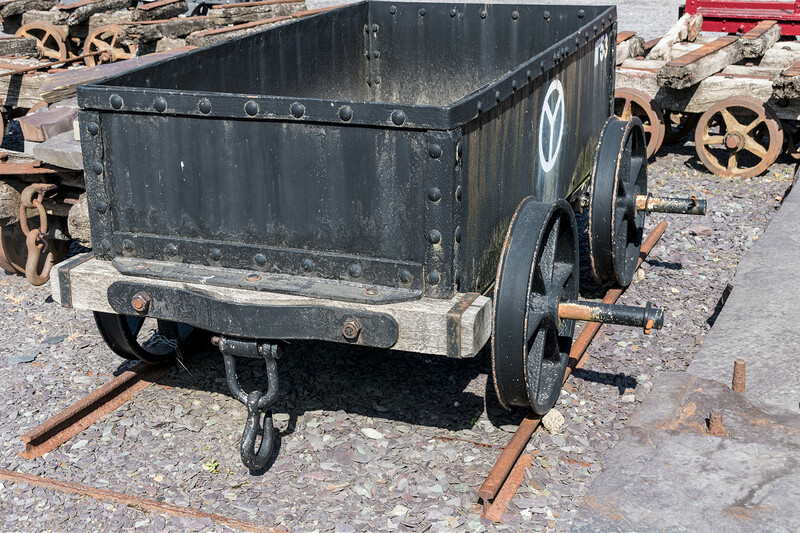 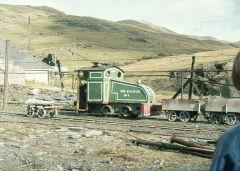 There are quite a few preserved slate wagons dotted around Llanberis. 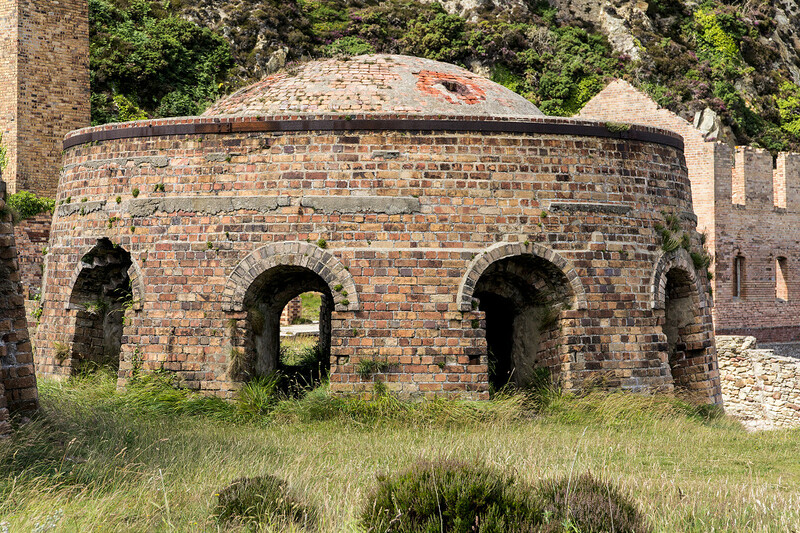 The water tower at Gloddaeth Hall, Llandudno, is similar to a 17c dovecote in the grounds but probably December 2016s from the 1880s. 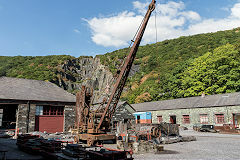 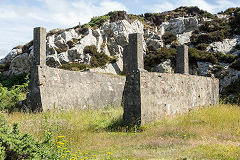 The Little Orme Quarry worked from 1898 to 1931, stone being loaded direct into ships at it's quayside. 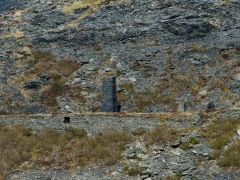 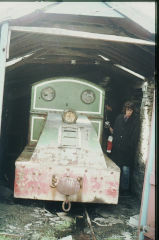 The quarry was worked by 2ft gauge Kerr Stuart locos up to 1927 and after by vertical boilered Sentinal locos, the ghosts of De Winton?